on and treason trial of the mysterious Aaron Burr, and the impeachment trial of President Andrew Johnson. His histories have won the Washington Writing Award for best book of the year, the History Prize of the Society of the Cincinnati, and the William H. Prescott Award of the National Society of Colonial Dames of America. 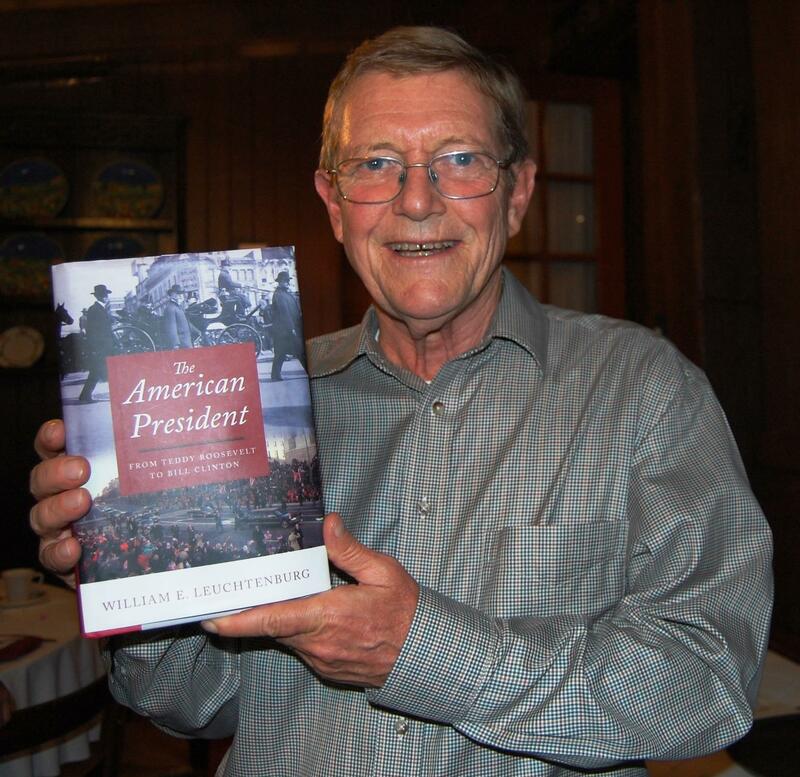 His first novel, The Lincoln Deception, about the John Wilkes Booth Conspiracy, was called the best historical novel of 2013 by Bloomberg View. Sequels include The Wilson Deception, set at the Paris Peace Conference in 1919, and The Babe Ruth Deception, which follows the Babe’s first two years with the Yankees. 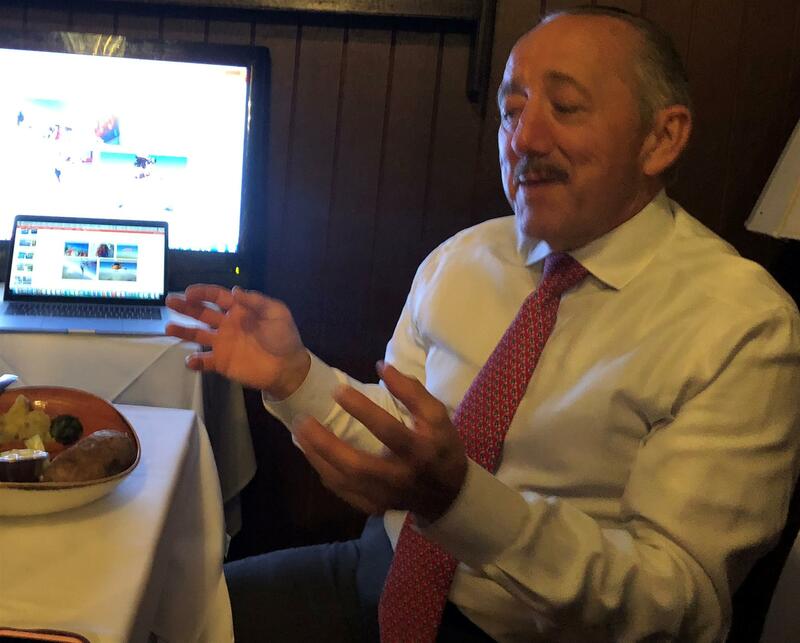 Brian Walsh, Co-Founder, Exerceo, and Julio Valcarcel spoke on “Mentoring Young Professionals” on April 4, 2019. 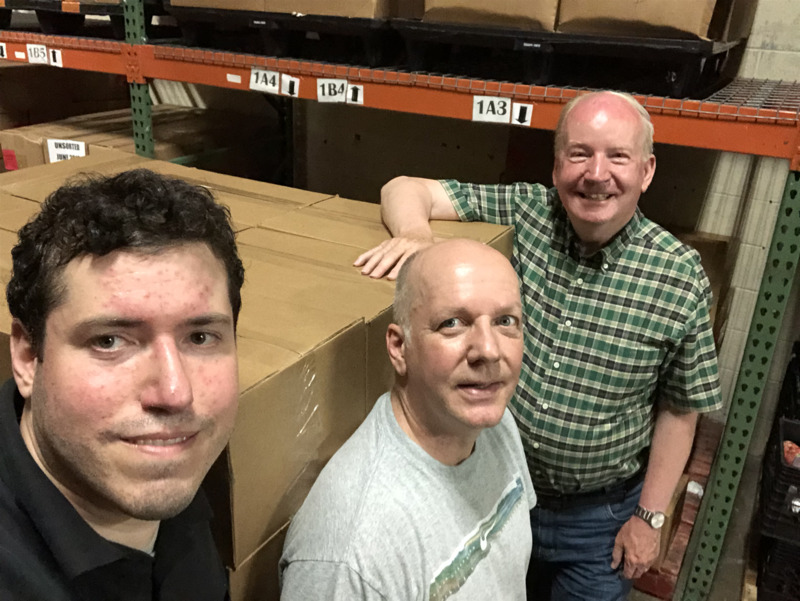 [L-R] Tom Lewis with Julio Valcarcel and Brian Walsh of exerceo. Thanks very much to Nancy Mason for introducing the speakers to the club. 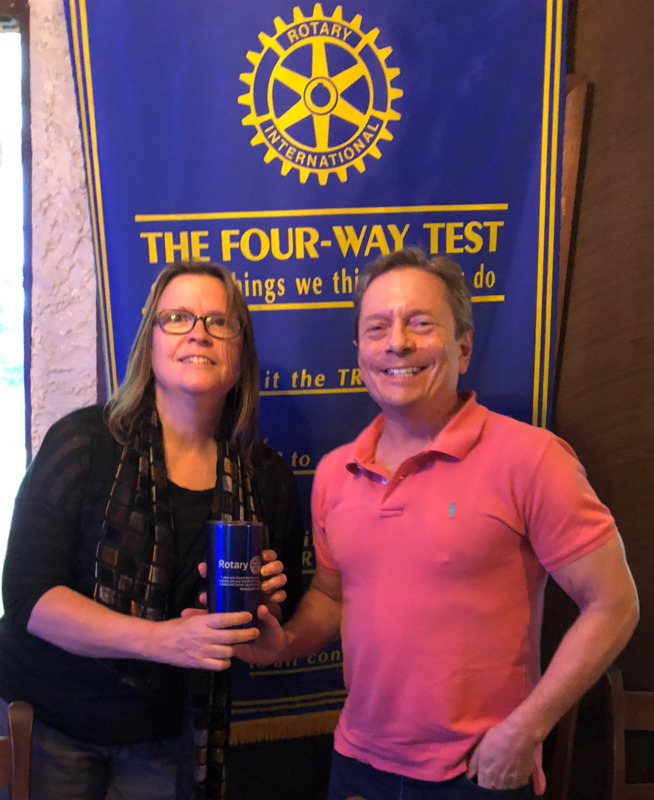 Empowerment Speaker Kevin Coleman Presented "The 3 Key Laws for Personal / Professional Growth" at the Rotary Club Meeting on March 7, 2019. 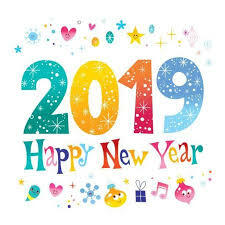 No Meeting on December 27, 2018 - Happy New Year! Please let Alan Grant know if you will be coming to help distribute dictionaries to third graders. 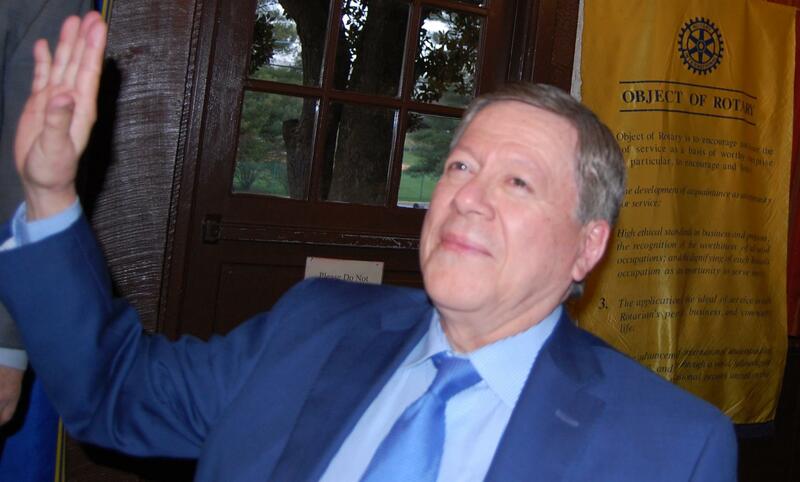 Author Philip Tarnoff discussed his latest book "In the Footsteps of Rome" at the Rotary Club meeting on October 11, 2018. 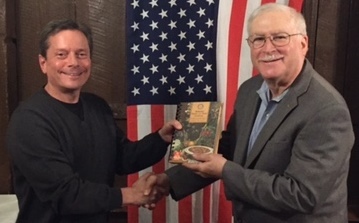 Tom Lewis thanked author Philip Tarnoff who discussed his latest book "In the Footsteps of Rome" at the Rotary Club meeting on October 11, 2018. 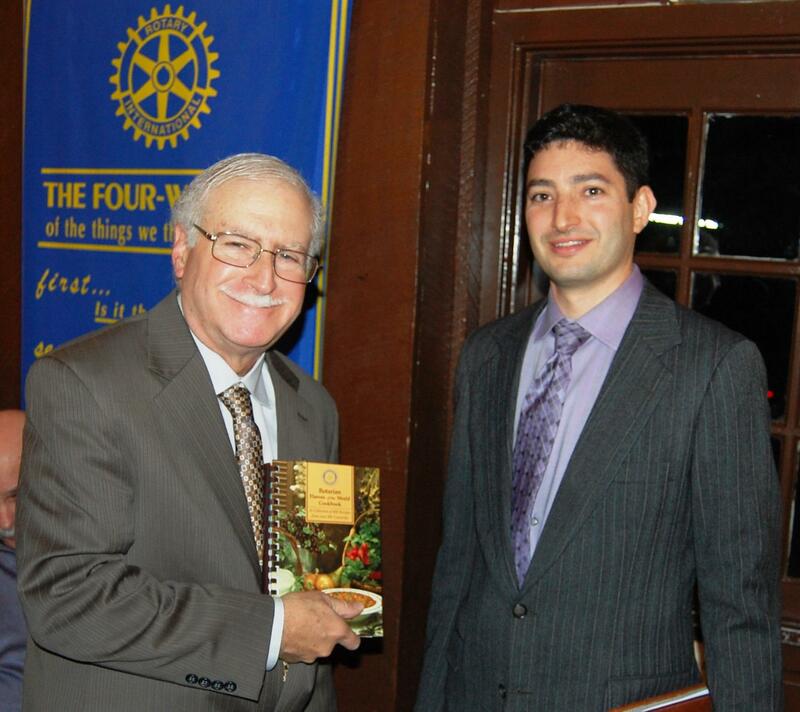 NY Times Bestselling Author Ronald Kessler was the guest speaker at the Rotary Club meeting on May 3, 2018. 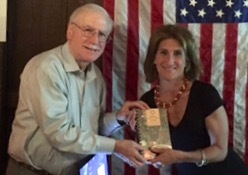 Tom Lewis (right) presented NY Times Bestselling Author Ronald Kessler and his wife Pam with the Rotary cup for his presentation on his latest book, "The Trump White House" at the Rotary Club meeting on May 3, 2018. 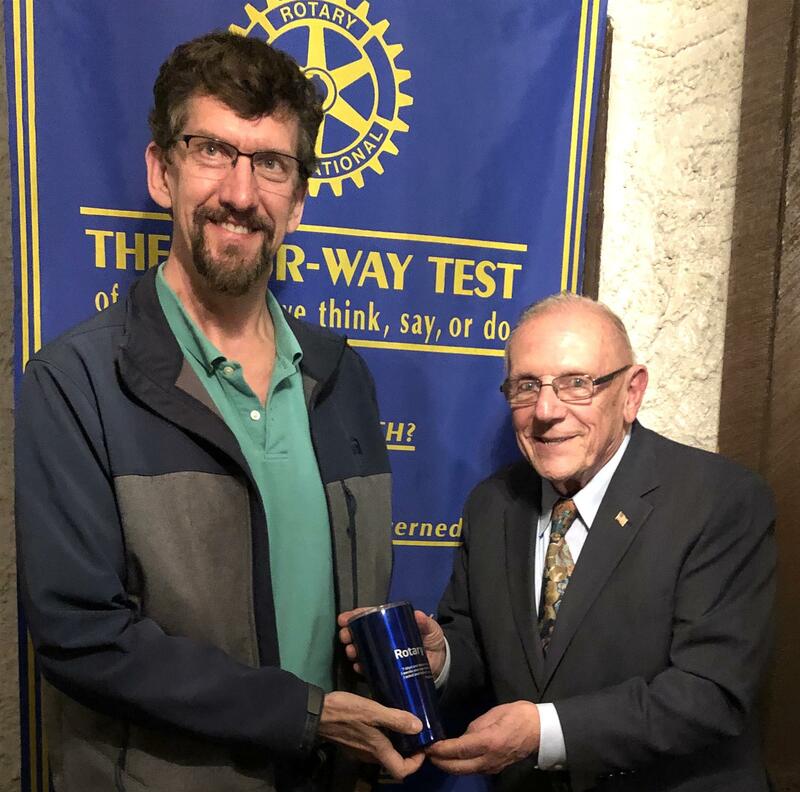 McLean Quinn received a Rotary cup from Bob Nelson in appreciation for his presentation at the Rotary Club meeting on April 19, 2018. 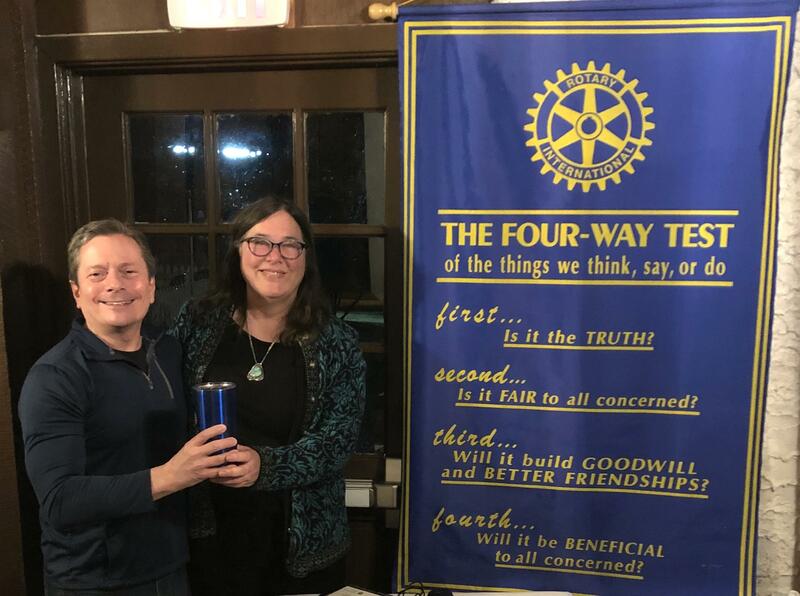 Rose Krasnow was the guest speaker at the Rotary Club meeting on April 5, 2018. 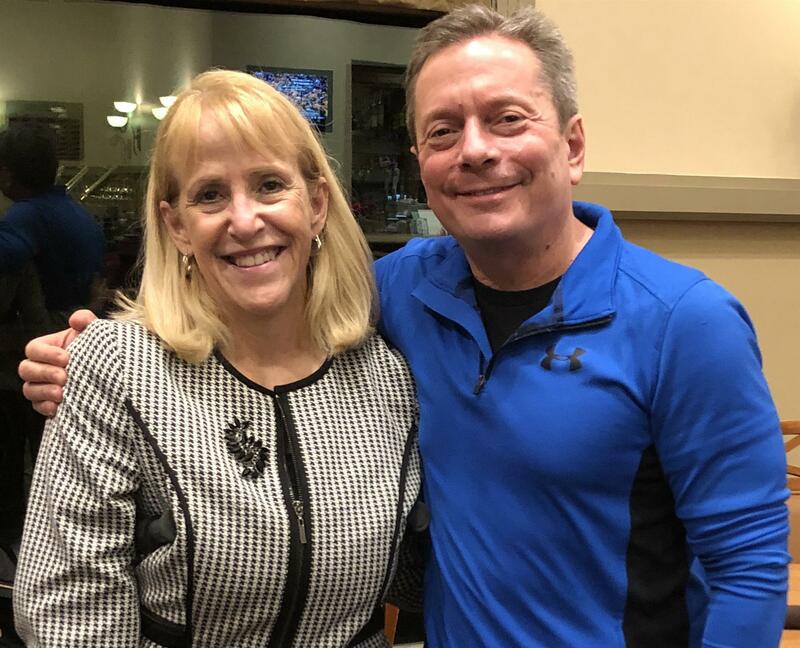 President Todd Nitkin thanked former Rockville Mayor and current County Executive Candidate Rose Krasnow for her presentation. $19,000 in medical equipment delivered in Nepal for screening of 5000 children for hearing problems and 100 ear surgeries to prevent or reduce hearing loss. Rotarians from the RC of Kathmandu Mid-Town and Dr. Milan Maharjan, Chairperson of Ear Care Nepal (ECN), appear in the picture below. The big piece of equipment is an operating microscope that will be used in the performance of ear surgeries. To the right is a portable, battery operated audiometer, which is used to facilitate ear screening without access to electricity. This piece of equipment is needed to overcome problems posed by frequent power outages in Nepal; and an impedance meter, a very important diagnostic tool that ECN can now use to perform better diagnoses of ear problems prior to surgery. Global Grant 1637950 provided this equipment at a cost of approximately $19,000. The Grant is also paying for the screening of 5000 Nepalese children for hearing problems and ear surgery for 100 good candidates for ear surgery to prevent or reduce hearing loss. 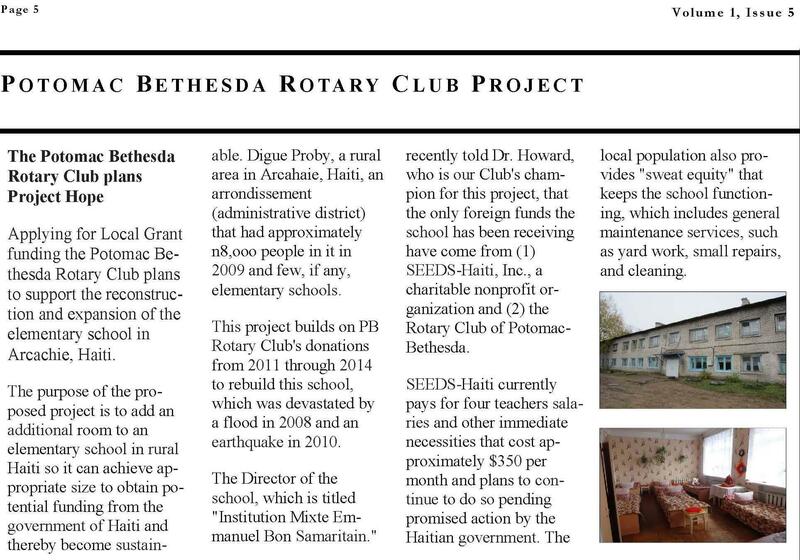 The Rotary Club of Potomac-Bethesda is the international sponsor of this Gl obal Grant. 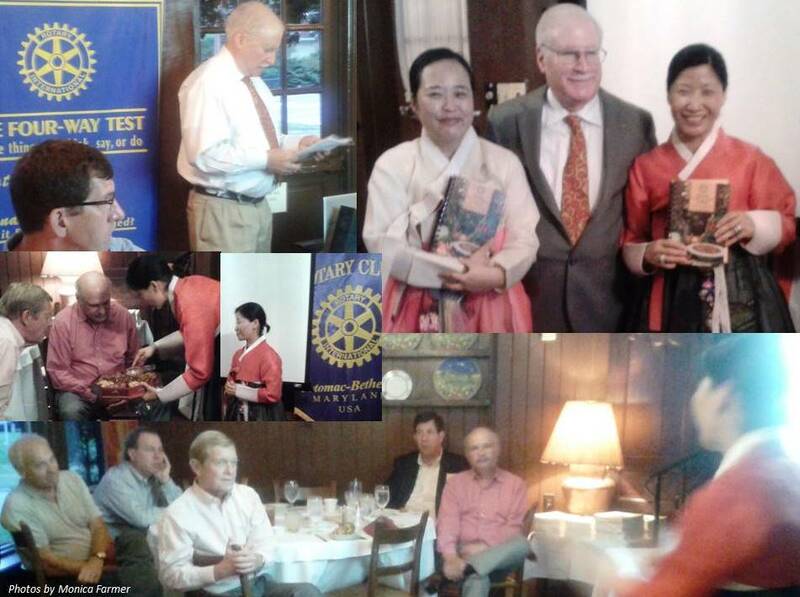 The Rotary Club of Kathmandu Mid-Town is the host Club. 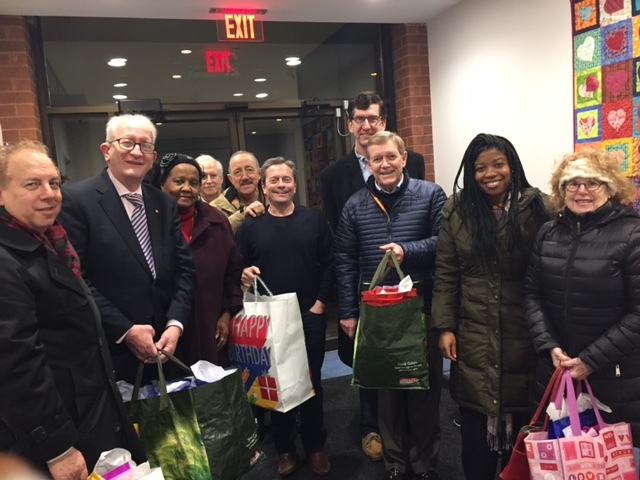 Additionally, financial contributions were provided by the Rotary Clubs of Bethesda-Chevy Chase, Metro Bethesda, and Pleasant Valley, New York, as well as various individual donors. Paul McDermott, Professor Emeritus, Montgomery College, had great photographs and maps to go along with his talk, "Strolling on the C&O Canal" at the meeting on March 29, 2018. 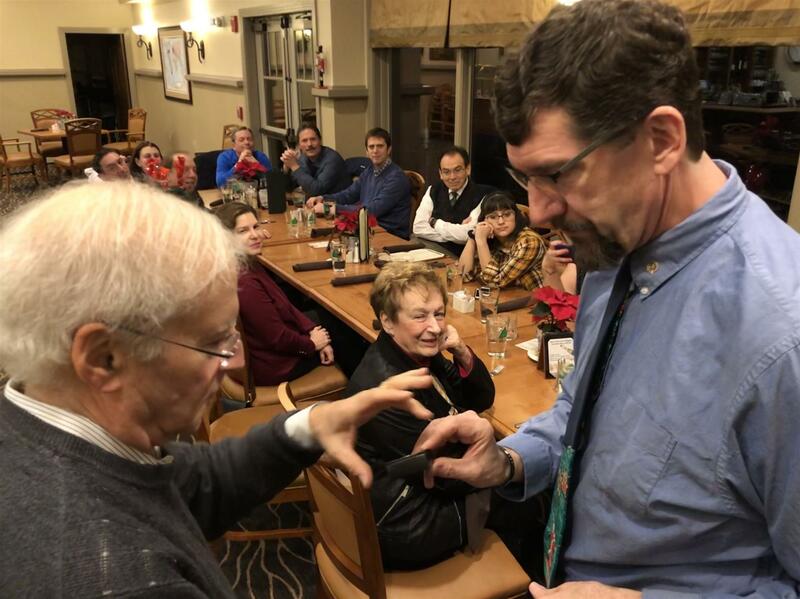 President Todd Nitkin thanked Paul McDermott, Professor Emeritus, Montgomery College, who had great photographs and maps to go along with his talk, "Strolling on the C&O Canal" at the meeting on March 29, 2018. The City of Rockville is creating a new 6.5 acre park in the Chestnut Lodge neighborhood and reached out to residents for suggestions on the name of the new park. 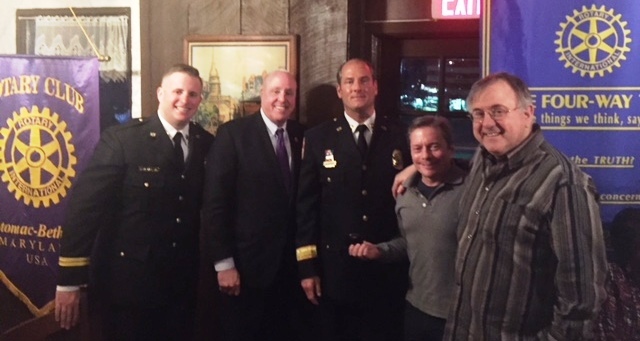 Among the suggestions were several to name the park in honor of recently deceased Deputy State Fire Chief and Captain of the Rockville Volunteer Fire Department, Sander Cohen. The suggestions were reviewed by Rockville Recreation and Parks Advisory Board and a recommendation was made by the Board to name the park, "Chestnut Lodge Park." The Board indicated that "a person must be deceased for at least one year prior to naming something in their honor." However in speaking to the Department of Parks and Recreation, it has been determined that the policy is a guideline only and that the Mayor and Council has final decision-making authority on the future park's name. 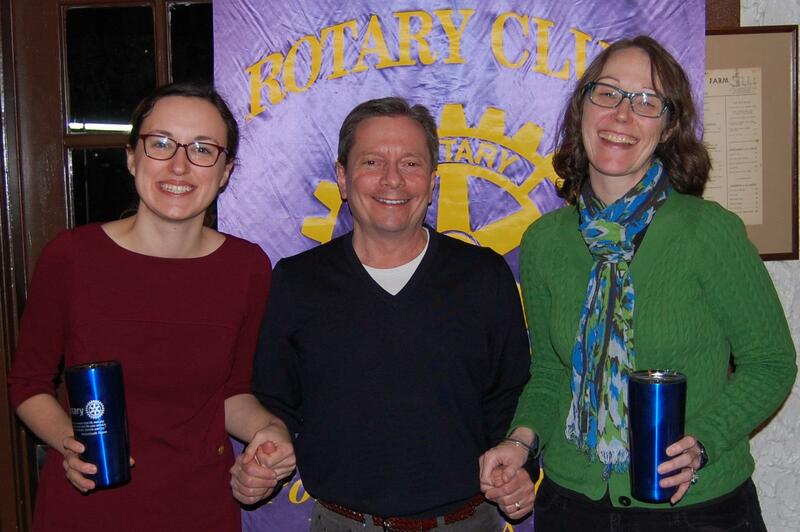 “Experiencing the Loss of a Loved One” was the Topic for Guest Speakers Catherine Stahl (Director of Communications and Education at Hospice Caring) and Jade Davis at the Potomac-Bethesda Rotary Club Meeting on March 15, 2018. 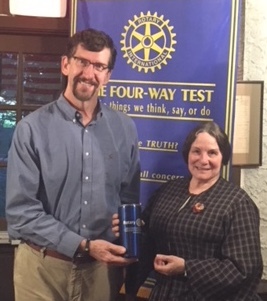 Tom Clifford gave a presentation on the "Universities at Shady Grove" at the Rotary Club Meeting on March 8, 2018. 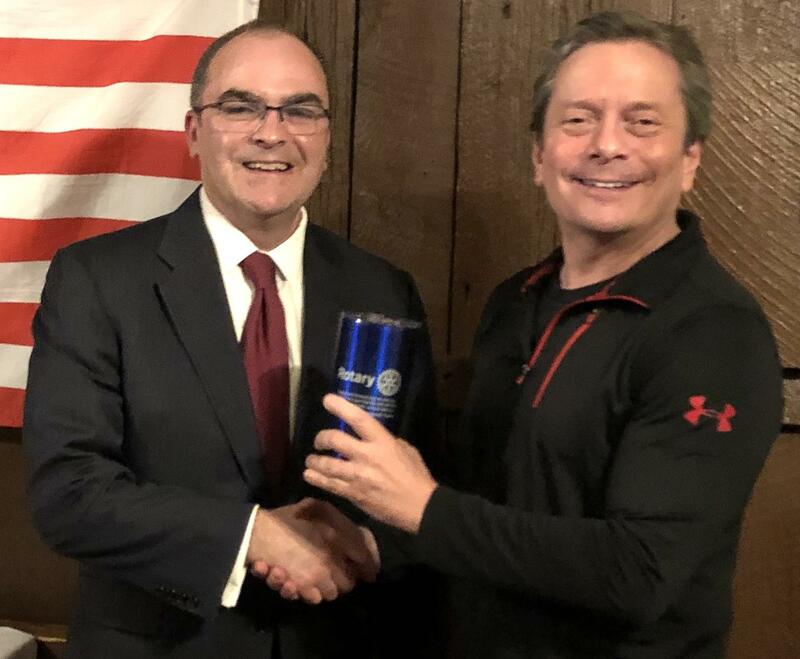 Tom Clifford and John Zuknick Make a Presentation on the "Universities at Shady Grove" at the Rotary Club Meeting on March 8, 2018. 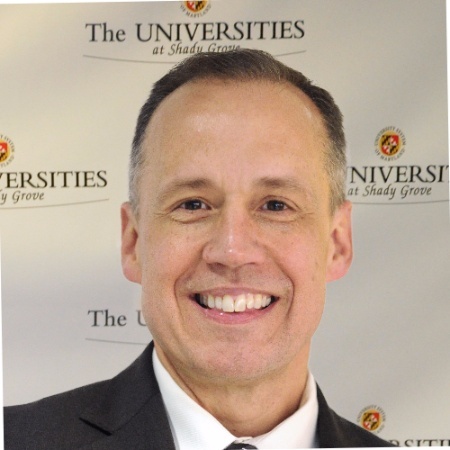 "The Universities at Shady Grove (USG) offers more than 80 undergraduate and graduate degree programs from nine Maryland public universities on one convenient campus in Montgomery County. USG helps prepare students for rewarding careers in the region’s most high-demand fields. Students who successfully complete their coursework on the USG campus graduate with a degree from one of its nine partner universities. Through on-campus services such as academic coaching, career advising, internship preparation, personal counseling, and leadership training, students leave the USG campus with the academic skills and real-world experiences needed for successful careers." 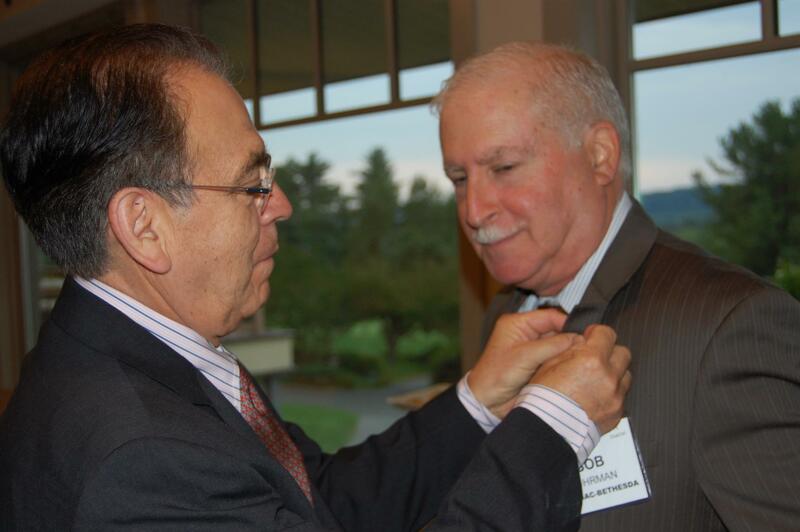 Congratulations to Immediate Past President Bob Fuhrman who received a pin from Tom Lewis in recognition of his outstanding service to the Potomac-Bethesda Rotary Club. 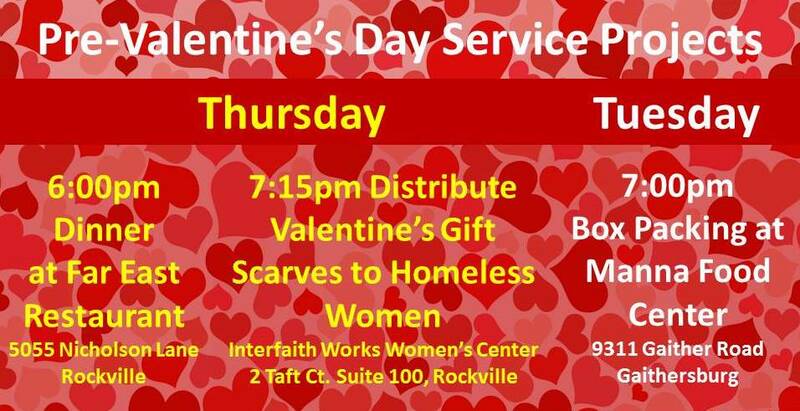 Valentine's Gifts to Homeless Women were beautiful pashmina scarves from Gladys Howard. 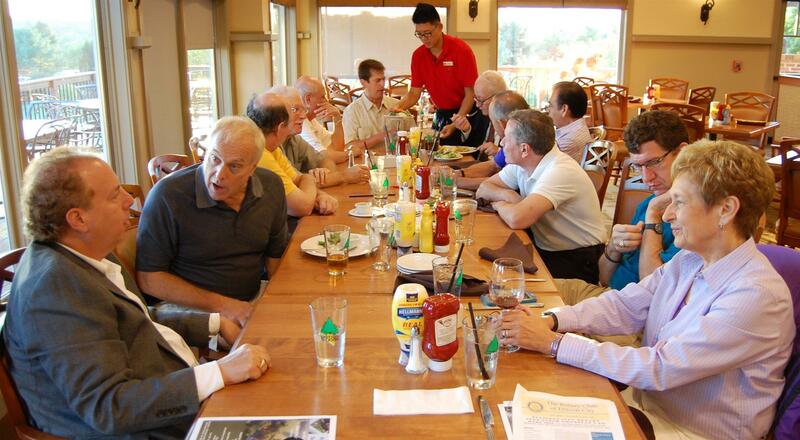 Rotarians dined at the Far East Restaurant in Rockville. 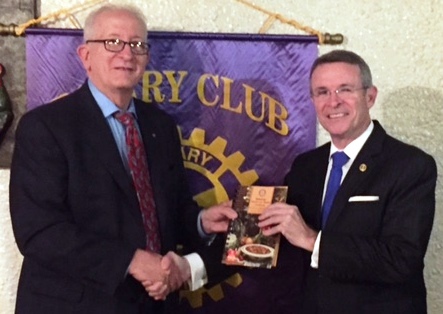 Guest Speaker on February 1, 2018, was Richard Gilmore, President/CEO of the GIC Group who’s topic was "Harold Rosenthal Fellowship in International Relations"
The top three per capita giving clubs to The Rotary Foundation during the 2016-2017 Rotary year were Charlotte Hall, Capitol Hill, and Columbia-Patuxent. This designation requires a minimum $50 per capita level of giving. Eight clubs were recognized as 100% Foundation Giving Clubs. 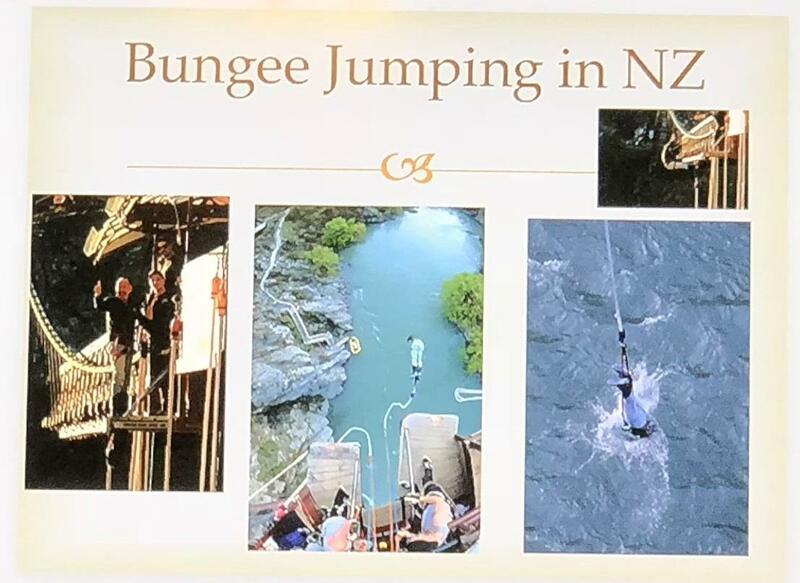 These are clubs in which every dues-paying member contributes a minimum of $25.00 to any Rotary Foundation gift designation and the club per capita giving average contribution is a least $100. 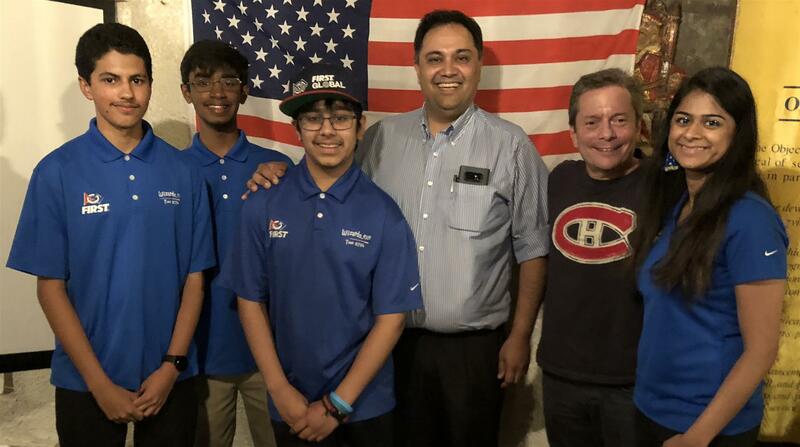 Clubs recognized were Aberdeen, Gaithersburg, Glen Burnie, Greenbelt, Metro Bethesda, Potomac-Bethesda, Prince Frederick, and Prince George’s County. 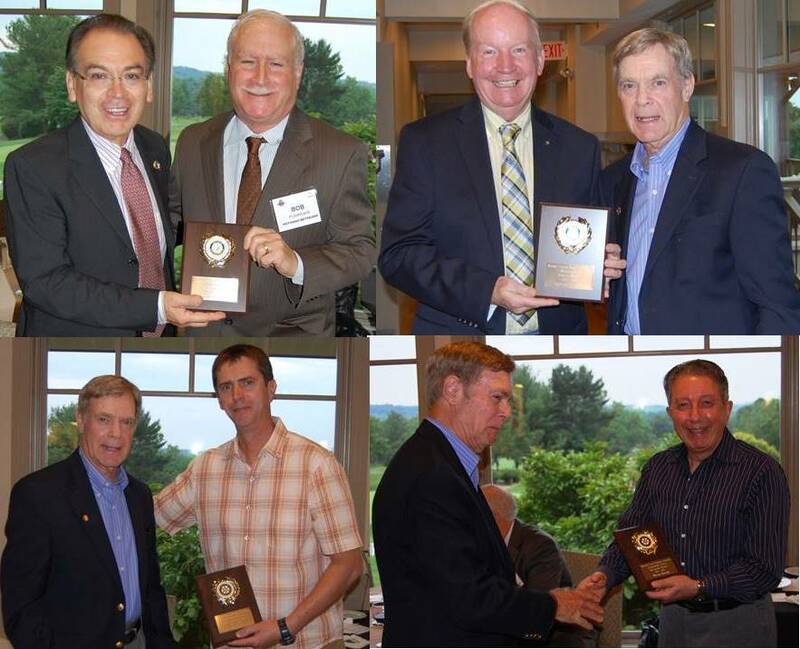 Five clubs were recognized as Every Rotarian, Every-Year Clubs. They were Glen Burnie, Gaithersburg, Metro Bethesda, Potomac-Bethesda, Prince Frederick. To be recognized, every dues-paying member must contribute a minimum of $25 to the Annual Fund with a per capita giving of at least $100. 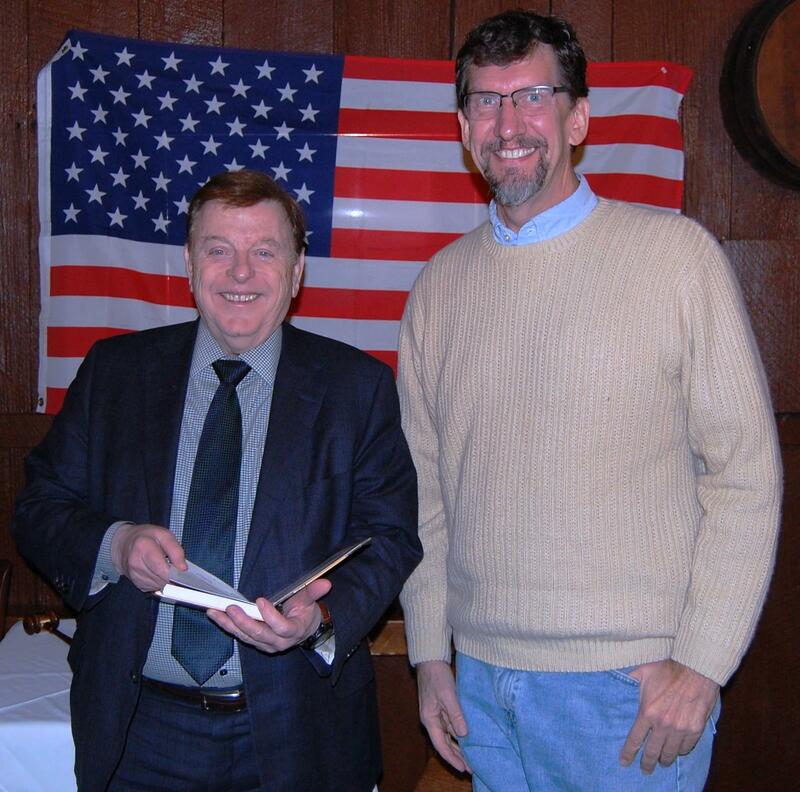 Alan Grant and Bob Nelson distributed dictionaries to third graders at St. Elizabeth's Elementary School on January 25, 2018. 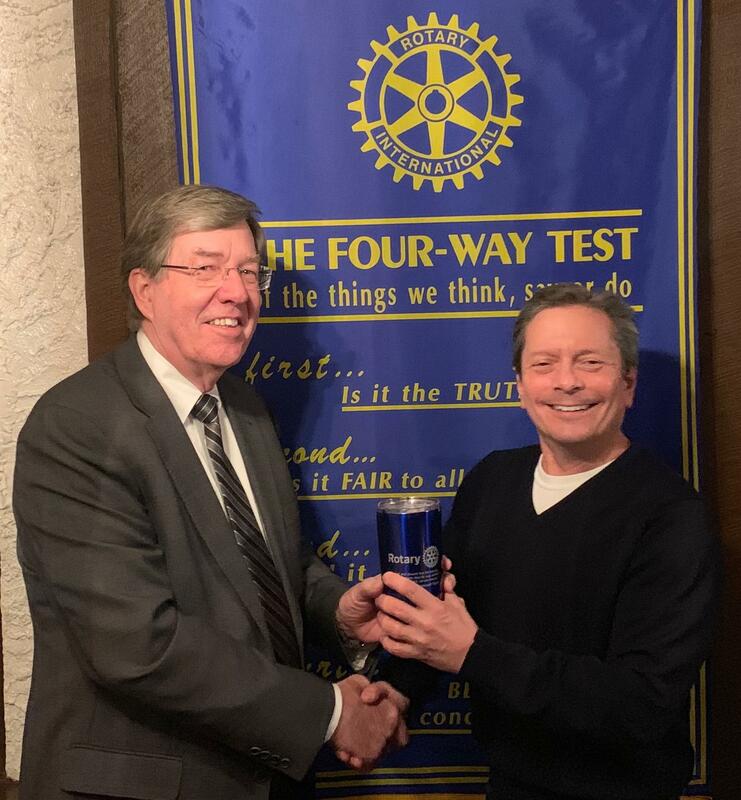 John Townsend, Manager of Public and Government Relations for AAA Mid-Atlantic, Addressed the Topic “Lucky Us - Why Having the Worst Traffic Hotspots in the Nation Impacts Us All” at the Rotary Club Meeting on January 18, 2018. 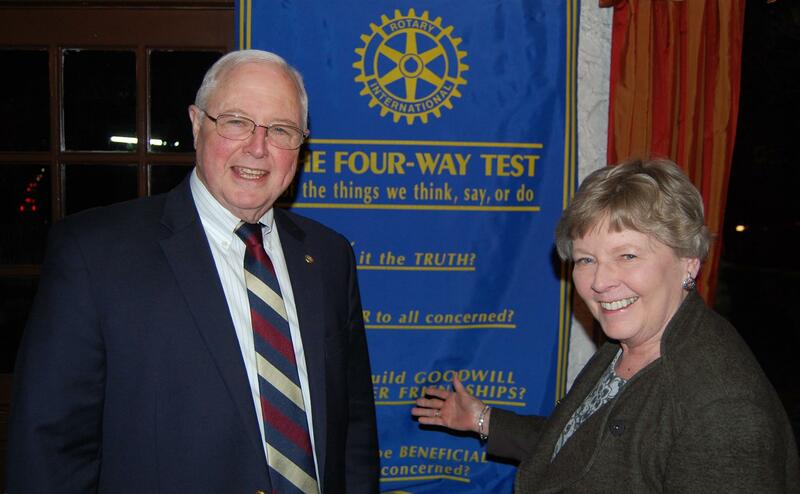 Tom and Barbara Allen gave a mini-forum on "Opioid Awareness" at the Rotary Club meeting on January 11, 2018. 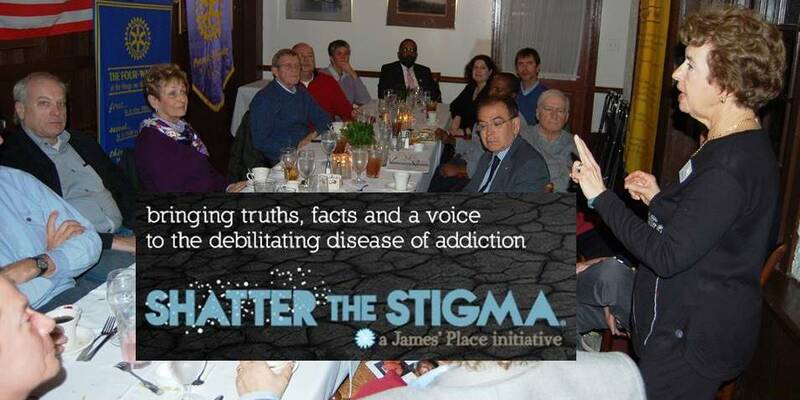 Their nonprofit James’ Place Inc. provides education, advocacy and scholarships for recovery housing. 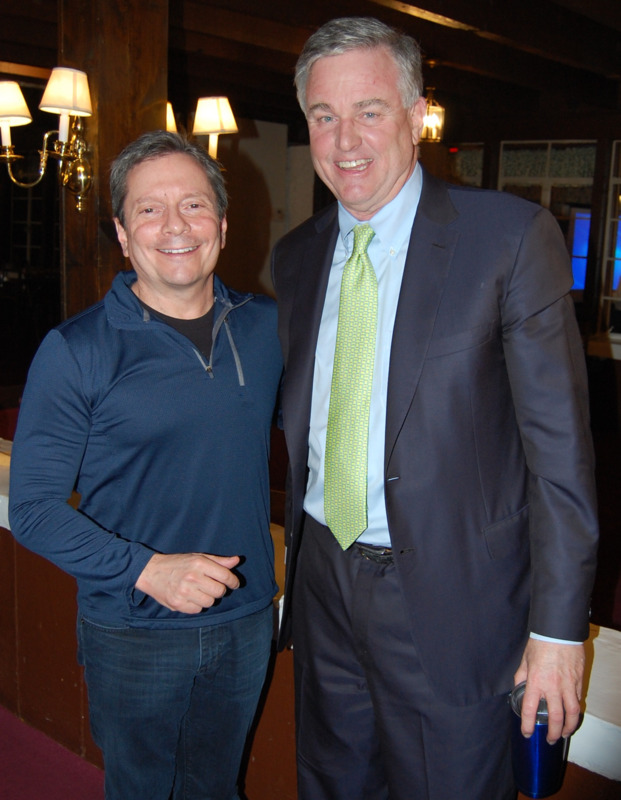 Lee Barnes, CEO, Barwood Taxi Service, spoke about "The Changing Landscape of Transportation" at the Potomac-Bethesda Rotary Club meeting on January 4, 2018. 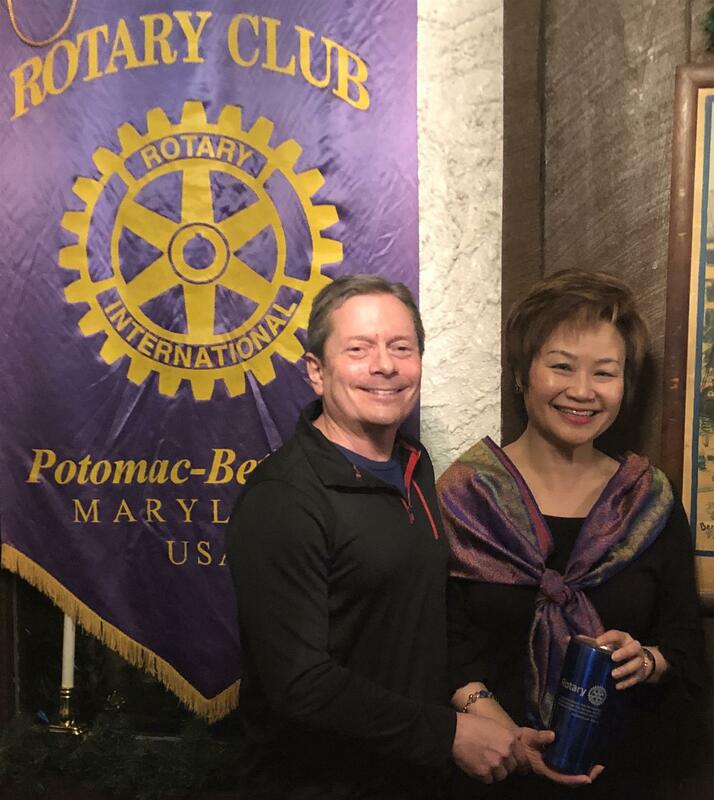 The Potomac-Bethesda Rotary Club wishes you all the best for 2018! 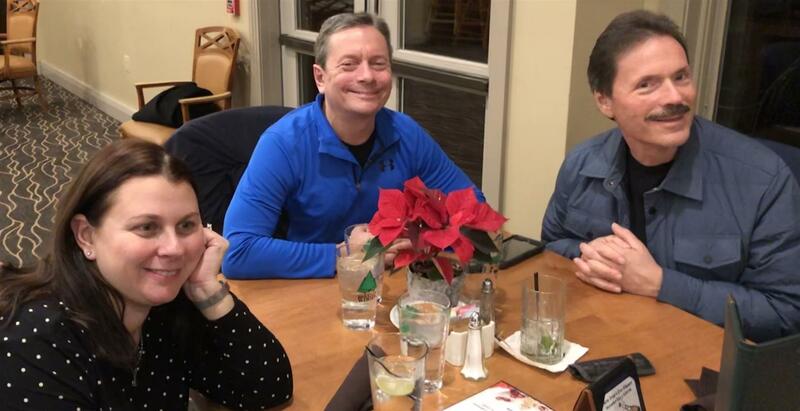 Rotarians, family members and guests gathered for the annual Holiday Party held at Bretton Woods Recreation Center on December 21, 2017. There is no meeting scheduled for December 28, 2017. Happy New Year! 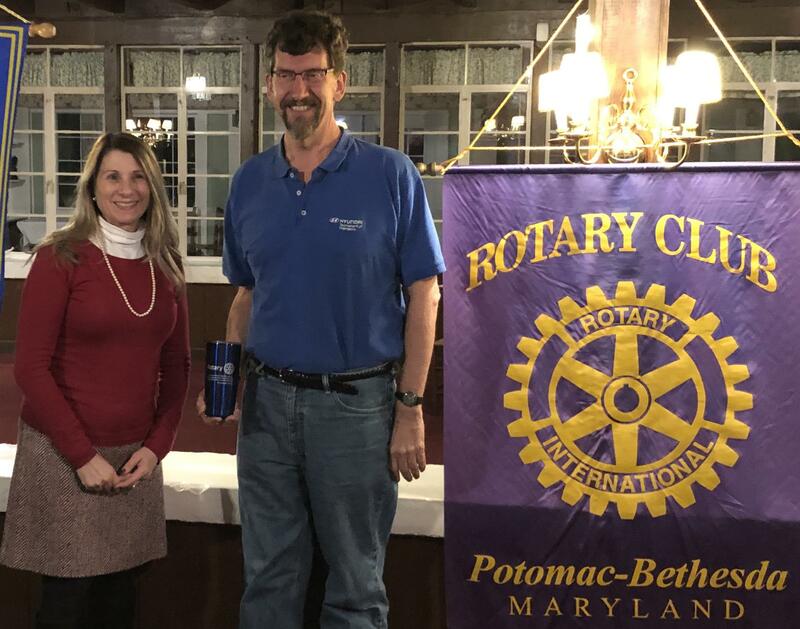 John McCarthy, States Attorney, Montgomery County, spoke about Opioid Addiction at the Potomac-Bethesda Rotary Club Meeting on December 14, 2017. 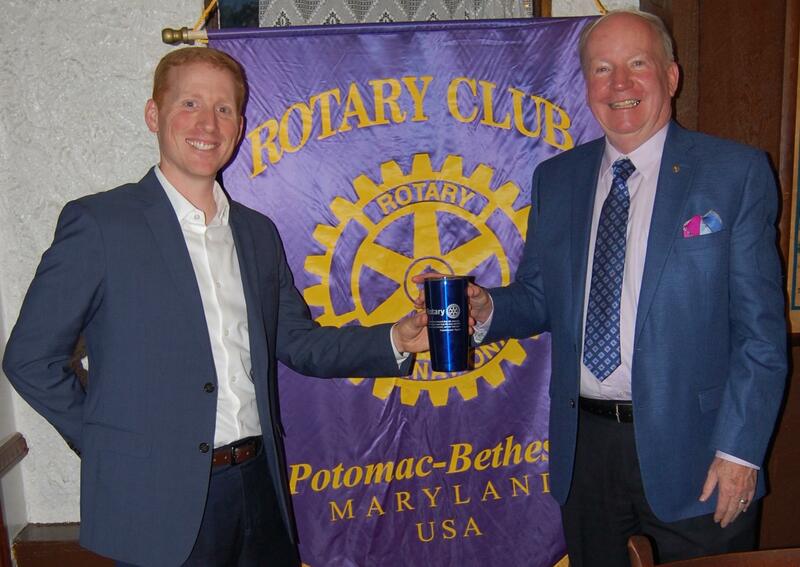 John McCarthy, States Attorney, Montgomery County, spoke about Opioid Addiction at the Potomac-Bethesda Rotary Club Meeting on December 14, 2017. 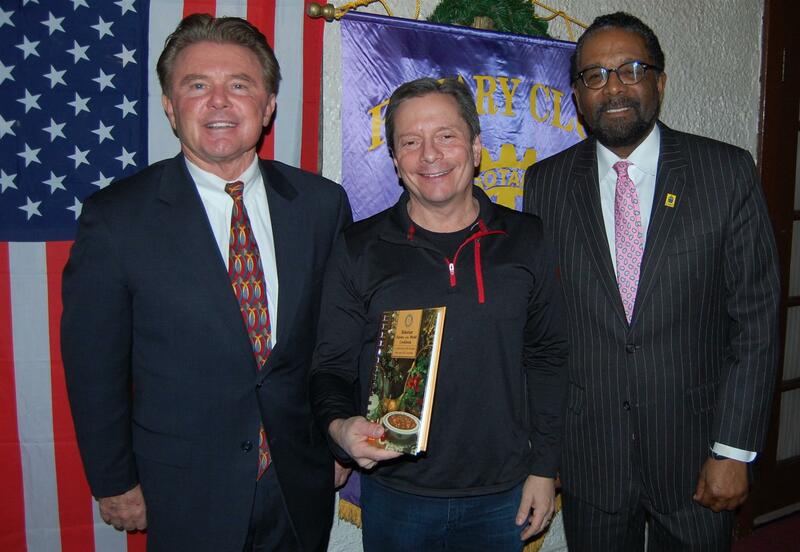 Pictured [L-R] are John McCarthy, P-B President Todd Nitkin and Rotary District Governor Greg Wims. 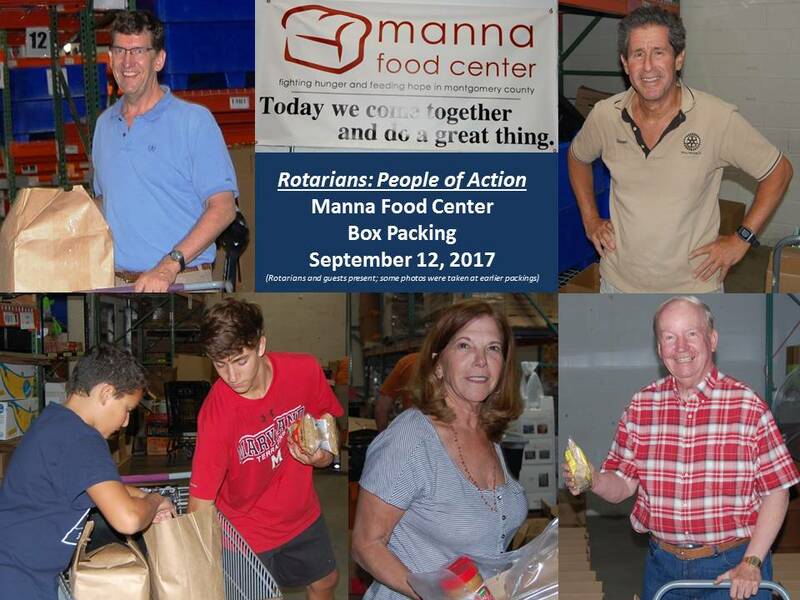 Rotarians Pack 144 Food Boxes at the Manna Food Center on December 12, 2017. 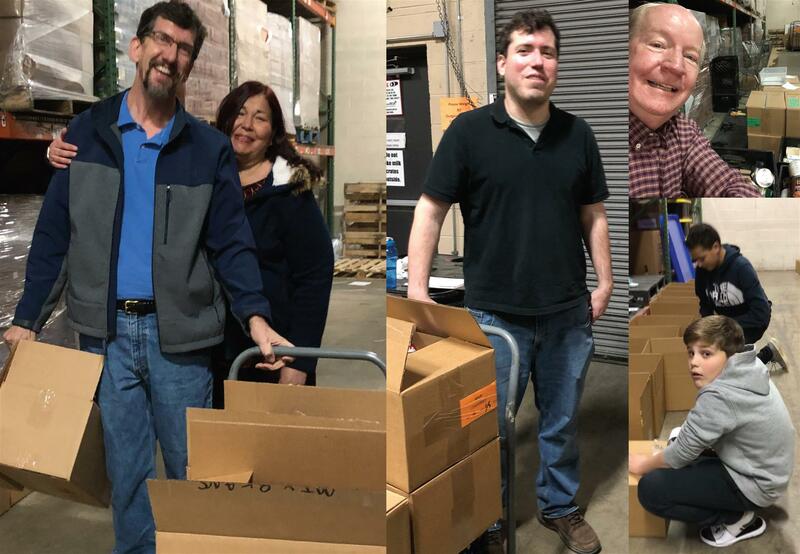 It's the busy holiday season, but Alex Naron along with Rotarians Steve Naron and Bob Nelson, and other volunteers packed 144 food boxes at the Manna Food Center on December 12, 2017. Why not make a New Year's resolution to join them in 2018 on the second Tuesday of each month at 7pm? 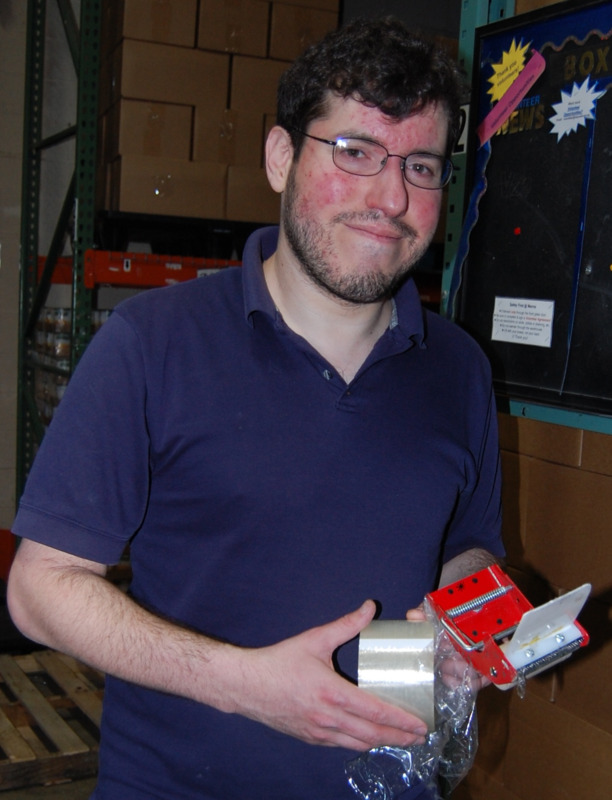 Sander Benjamin Cohen, born August 26, 1984 in Washington , DC., died at the age of 33 on December 8, 2017. He heroically passed serving in the Line of Duty for the Maryland State Fire Marshal’s Office. Sander is survived by his loving parents Dr. Neil and Arlene Soodak Cohen, his beloved dog Mia, and grandmother Rose Soodak; he is preceded by his late grandparents Robert Soodak and Minnie and Samuel Cohen. 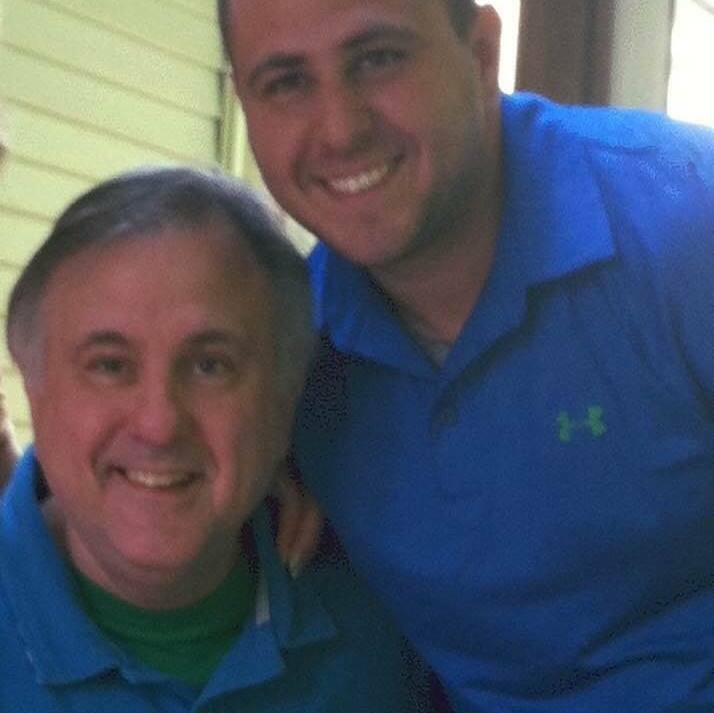 He also leaves behind six aunts and uncles (Teresa and Joel Soodak; Howard and Carol Cohen; Sondra and David Cohen), as well as four cousins (Jessica and Ethan Soodak; Rebecca and Samuel Cohen). 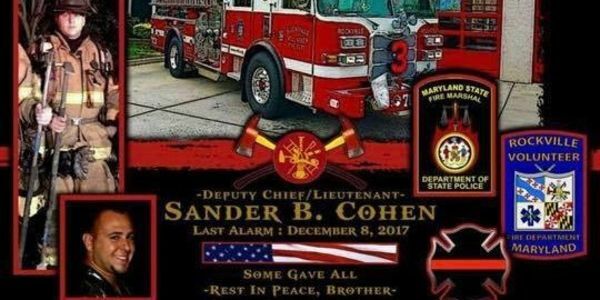 Sander Cohen was a nine year veteran of the Maryland State Fire Marshal’s Office, where he held the rank of Deputy Chief. 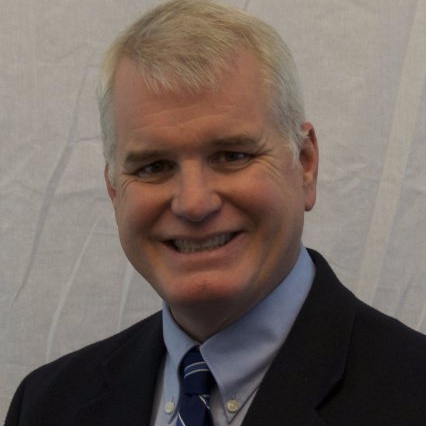 He served as the Regional Commander of the Northeast Regional Office. Throughout his career, Sander received numerous awards including a Unit Citation from Prince George’s County Fire & EMS Department for his involvement in a multi-agency investigation. 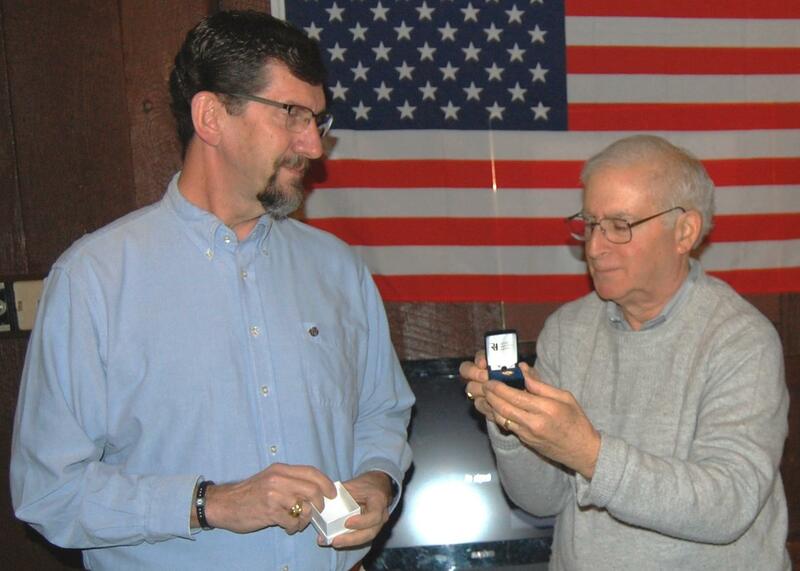 In addition to his public service as a State Fire Marshal, Sander was a 14 year veteran of the Rockville Volunteer Fire Department, where he held the rank of Lieutenant. Sander was a dedicated and active member holding many positions including Shift Officer and Director. He was awarded a Citation of Bravery for his life saving actions at an apartment fire on December 22, 2003. A memorial service will be held on December 14, 2017 at B’nai Israel, 6301 Montrose Rd Rockville, MD 20852 at 11 Am. A private internment will follow. Shiva will be observed and open to the public on Thursday, December 14th from 6pm to 10pm at Woodmont Country Club located at 1201 Rockville Pike, Rockville, Maryland. Close friends and immediate family will continue Shiva on Saturday, December 16th at the Cohen residence. 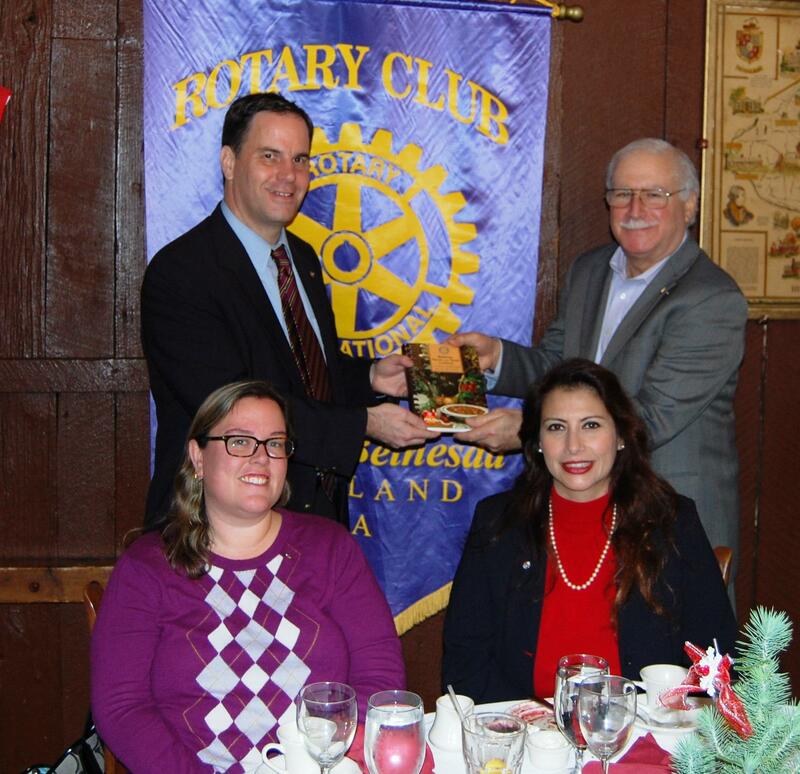 Susan Glover, Senior Vice President, Adventist HealthCare spoke on "Patient Safety and the Role of the Patient Advocate" at the Rotary Club Meeting on December 7, 2017. Guest speaker Diana Negroponte reported on the status of International Trade Negotiations and addressed the question “What are the chances that the US will withdraw from NAFTA?” on November 16, 2017. 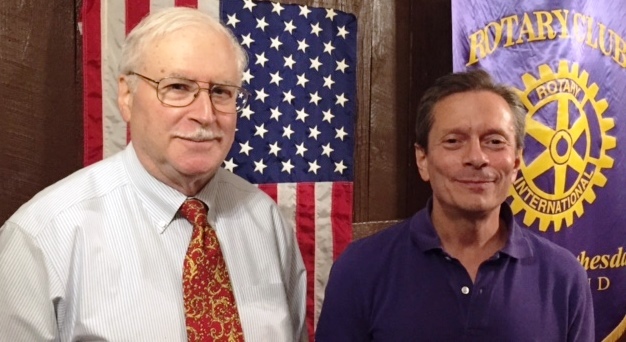 Guest Speaker on November 2, 2017, was Dr. Michael Schoenbaum, NIH Epidemiologist, who discussed the Identification and Treatment of Suicide Risk in the Military. 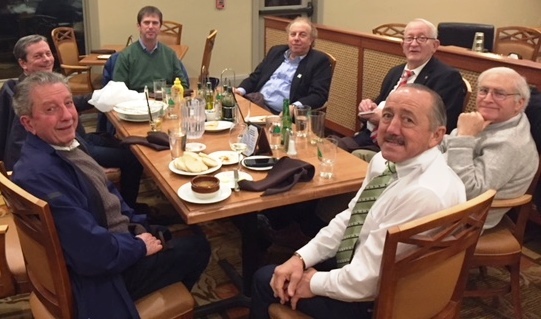 October 26, 2017, was a Rotary Club Social at Bretton Woods, the First Since the Passing of Arthur Blitz. 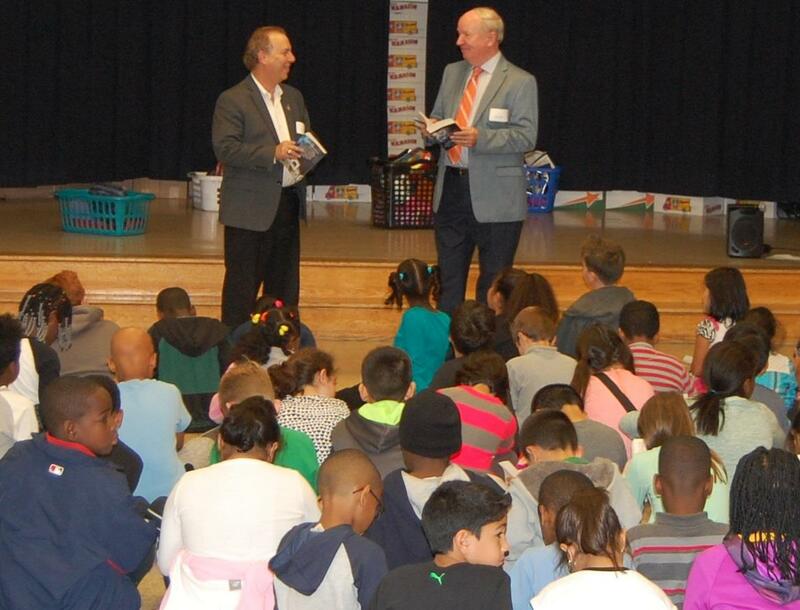 Alan Grant and Bob Nelson distributed dictionaries to third graders at Waters Landing Elementary School on October 24, 2017. 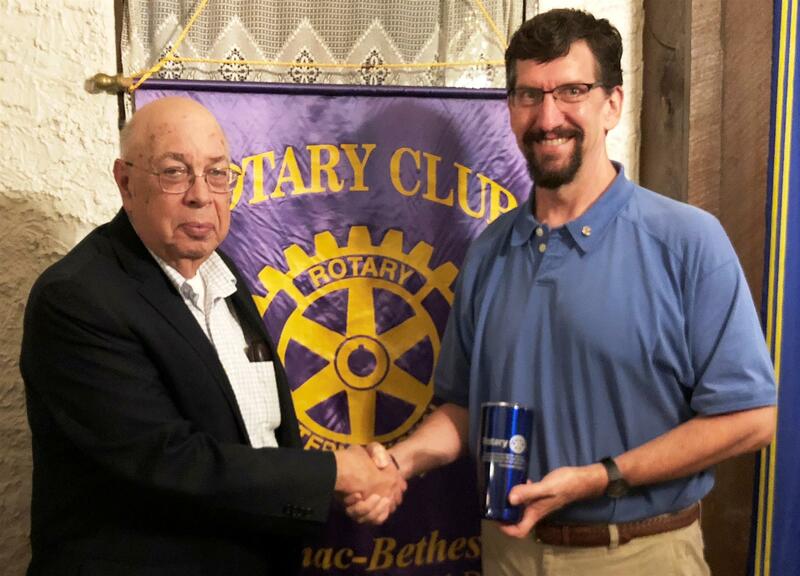 “Climate Change” was the topic at the October 12, 2017, Rotary Club Meeting with Guest Speaker Bilal Haq who was formerly Director for Marine Geoscience Programs at National Science Foundation. 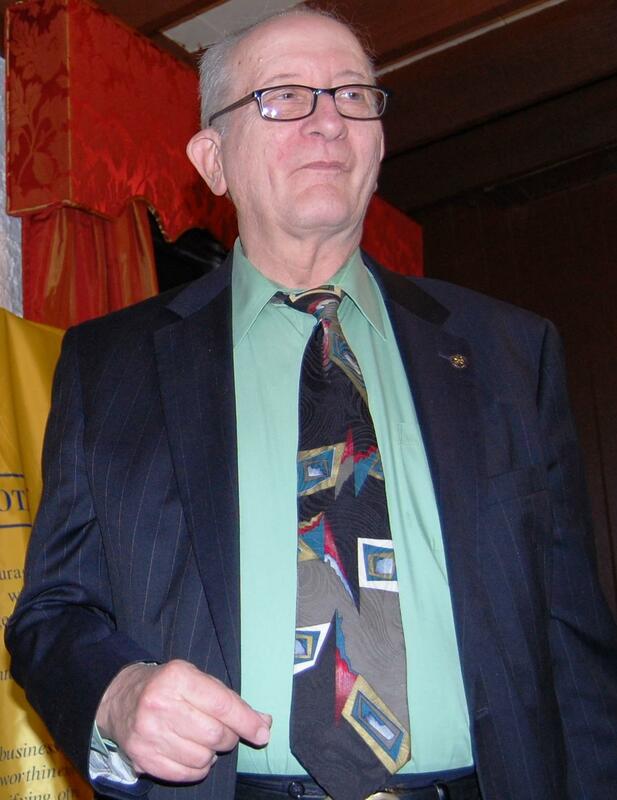 It is with great sadness that we report the passing on October 4, 2017, of our beloved Rotarian of 35 years and Past President Arthur H. Blitz. 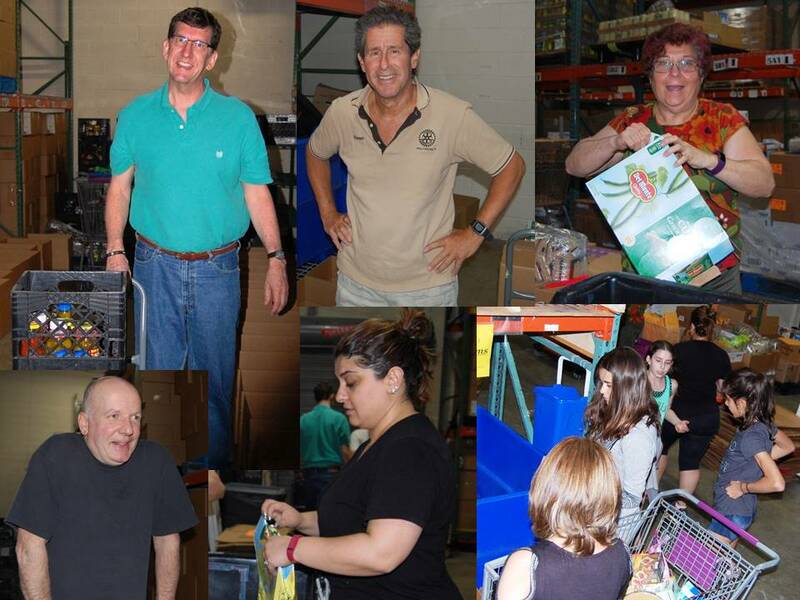 Art was a leader in the club organizing annual fix-up projects at the Jewish Foundation for Group Homes. 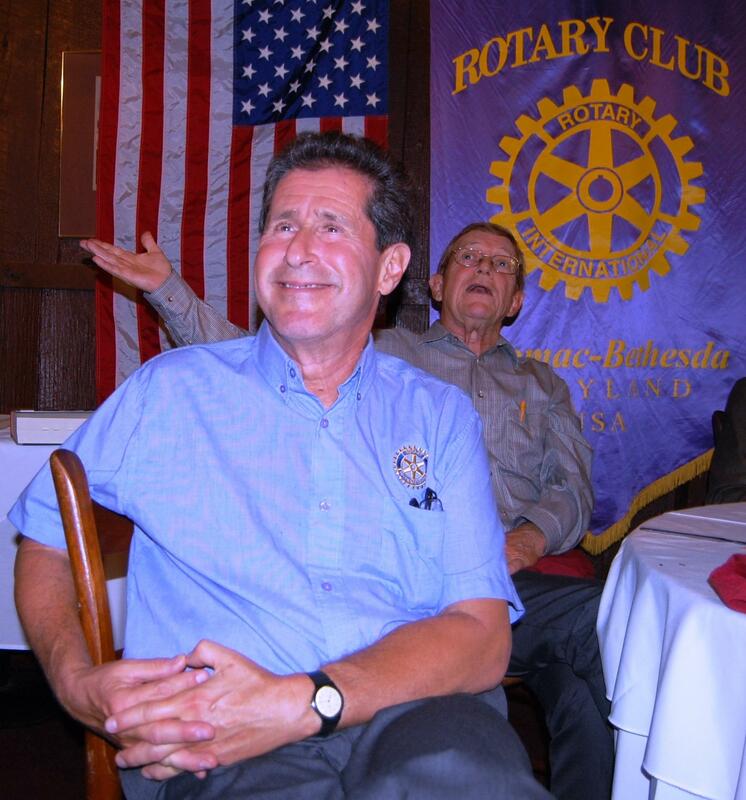 He always brought a funny story and occasionally entertained fellow Rotarians with his magic tricks. He will be sadly missed. 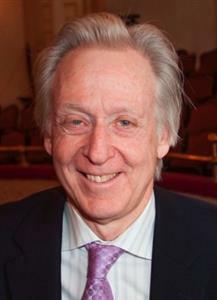 We express our condolences to his family, wife Mimi, and children Leslie, Robin and Mickey. 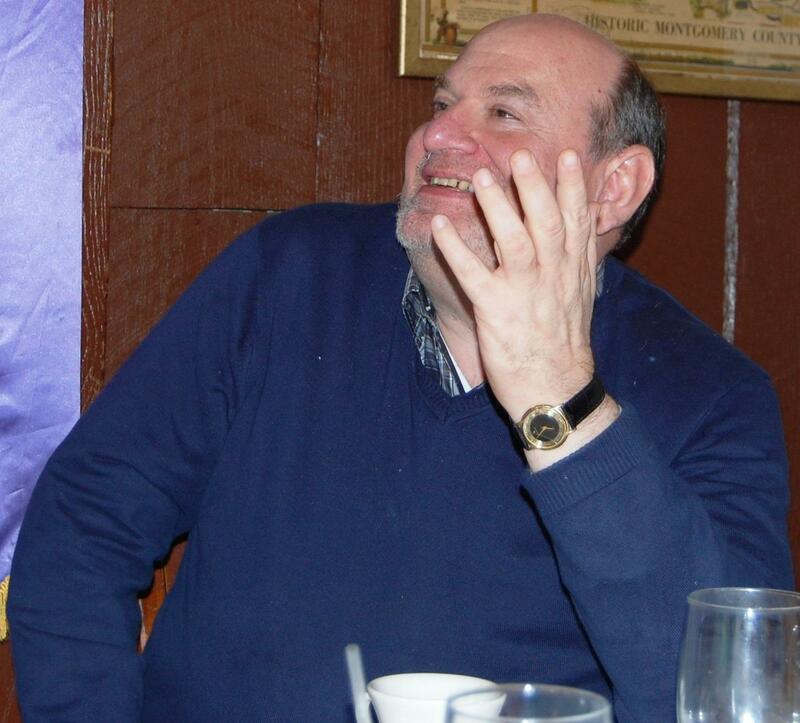 His funeral is scheduled for Monday, October 9, 2017, at 10:30am at Congregation Beth El, 8125 Old Georgetown Road, Bethesda, with interment to follow at Judean Memorial Gardens, Olney, MD. Family will be receiving friends through Friday evening, October 13th and holding Shiva Minyan at 7pm on Monday, October 9th and Tuesday, October 10th. Memorial contributions may be made to CHI, Inc., 10501 New Hampshire Ave, Silver Spring, MD 20903 or to the Montgomery County Humane Society, 601 S. Stone Street Ave, Rockville, MD 20850. 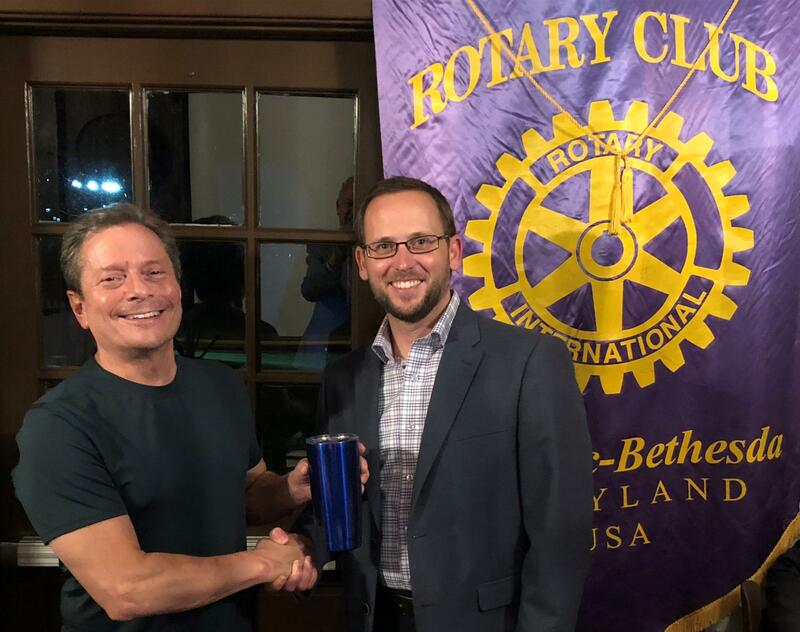 President Todd Nitkin thanked motivational speaker Roderick Mitchell for giving an inspiring presentation on the “Application of Firefighting Concepts to Everyday Life” at the Potomac-Bethesda Rotary Club Meeting on September 14, 2017. 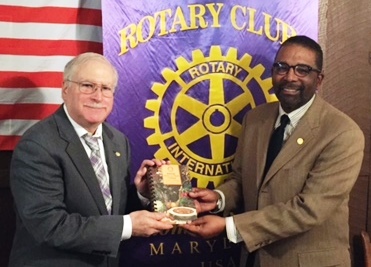 Rotary District Governor Greg Wims made his official club visit to the Potomac-Bethesda Rotary Club on September 7, 2017. 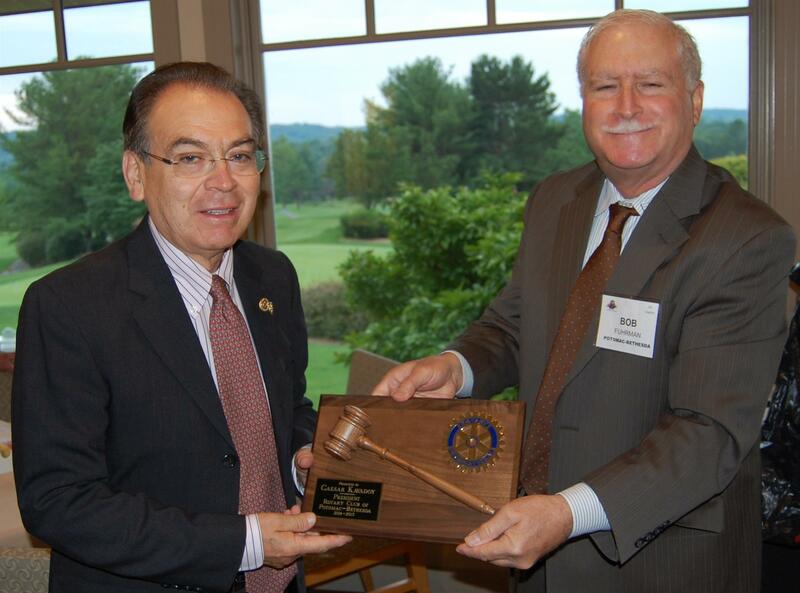 Welcome Rotary District Governor Greg Wims to the Potomac-Bethesda Rotary Club Meeting on September 7, 2017. 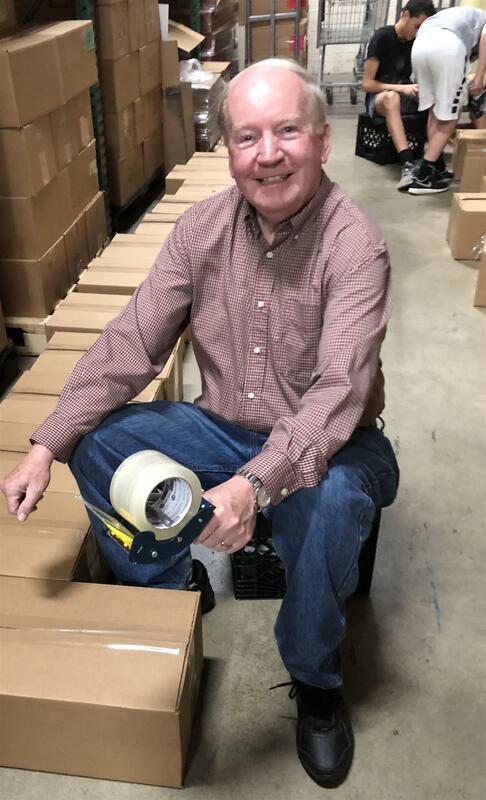 Greg Wims is a 6th generation Marylander with 49 years of volunteer service to the community. 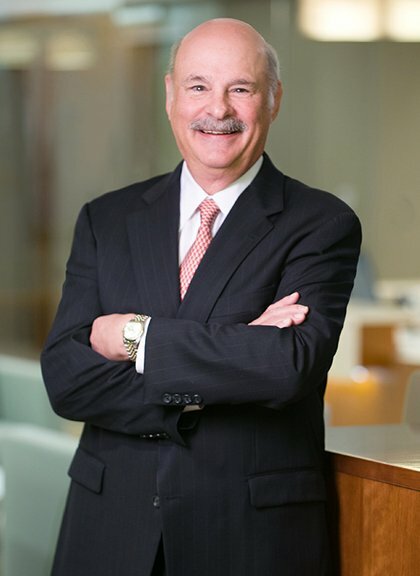 He has served on many nonprofit boards, University of Maryland Dental School, Universities at Shady Grove, Montgomery College, YMCA, Kennedy Center and Boys and Girls Club just to name a few. 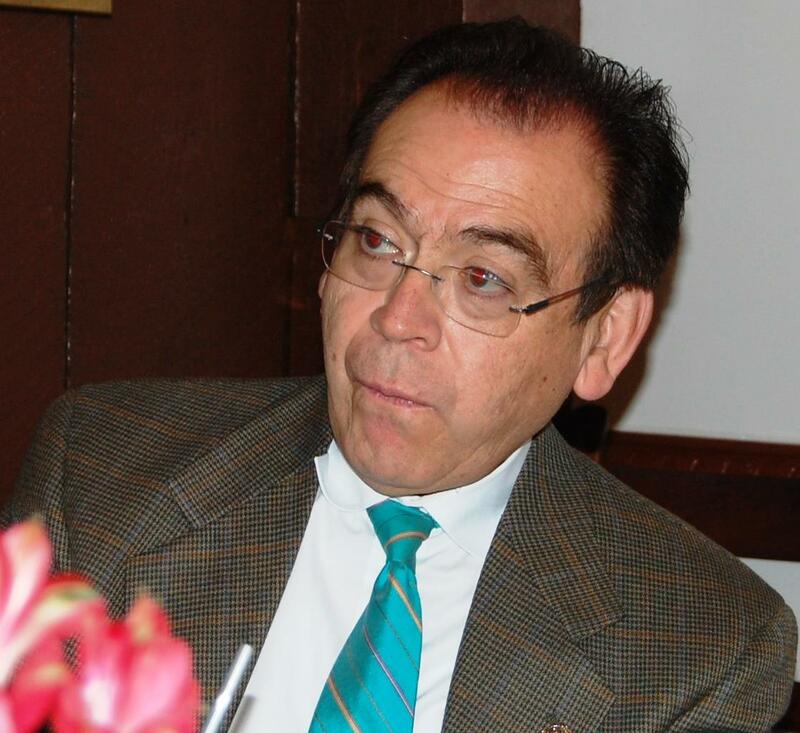 He presently serves on the Congressional Bank Board in the Metro Washington DC area. 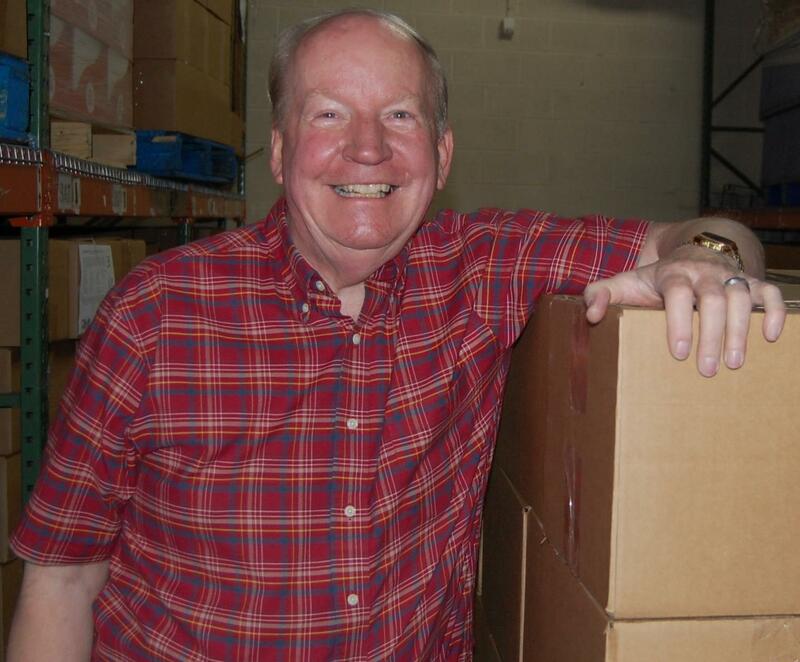 He founded the Victims’ Rights Foundation 21 years ago to help victims of violent crime. They just opened a preschool in Kenya 6 months ago. Greg is a Paul Harris fellow and a Paul Harris Society member. 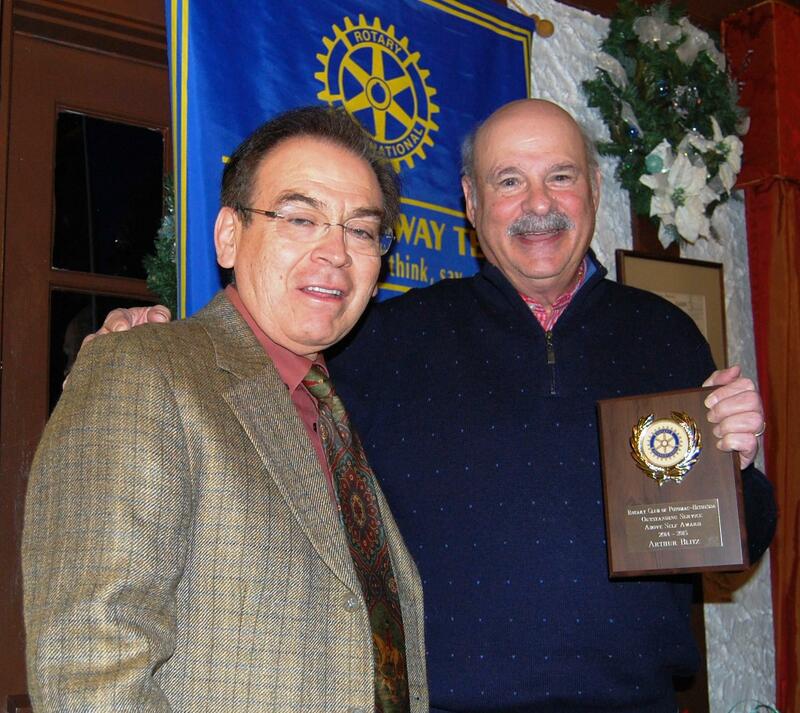 He is a member of the Bethesda Chevy Chase Rotary Club. He is married to Michelle and has three children and two grandkids. 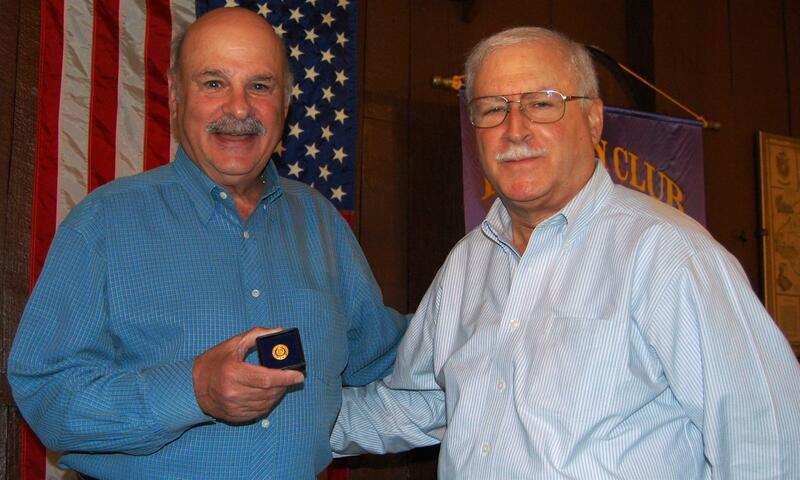 Please welcome Greg Wims, District Governor. Social at Bretton Woods Recreation Center on August 31, 2017. As you know, Hurricane Harvey has hit Texas and Louisiana very hard. 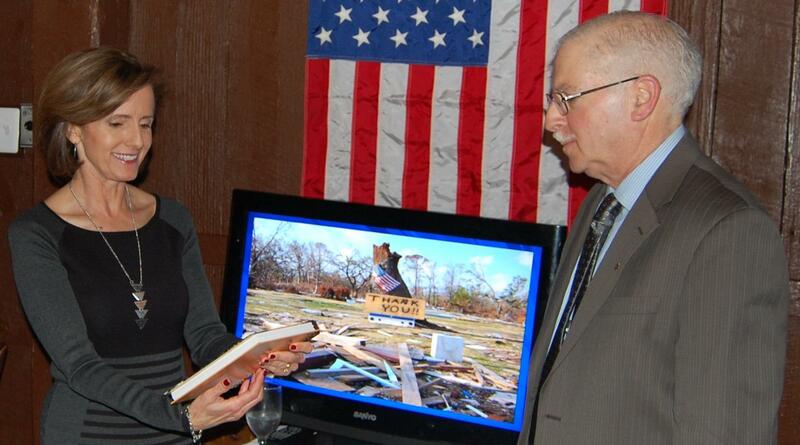 The Rotary District in coordination with the Disaster Aid USA is starting a fund drive. Please see the Press Release. Individually and as a club, I urge you to donate generously. 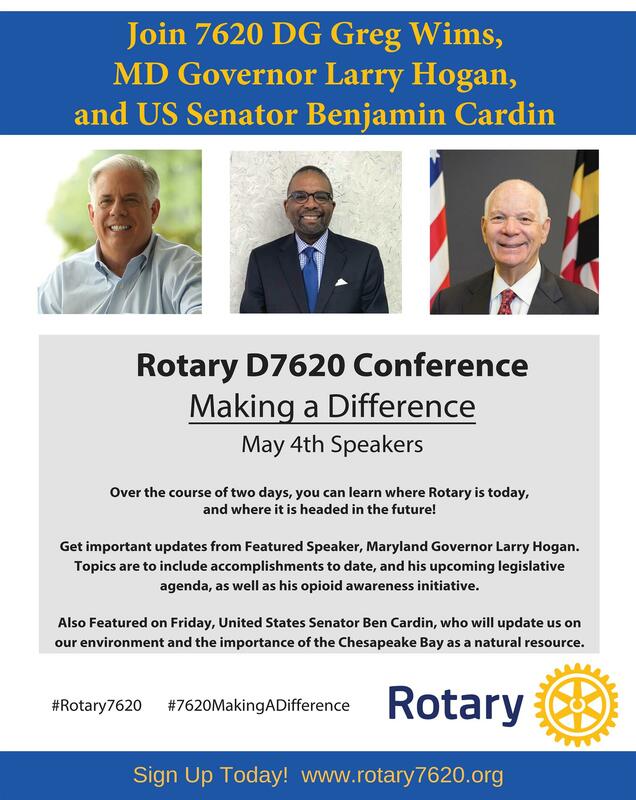 Rotary's theme this year is Make A Difference. Its time to make a difference. Your donations will provide the funds for the volunteers to handle disaster related relief from Hurricane Harvey and direct assistance to the victims of the flood. 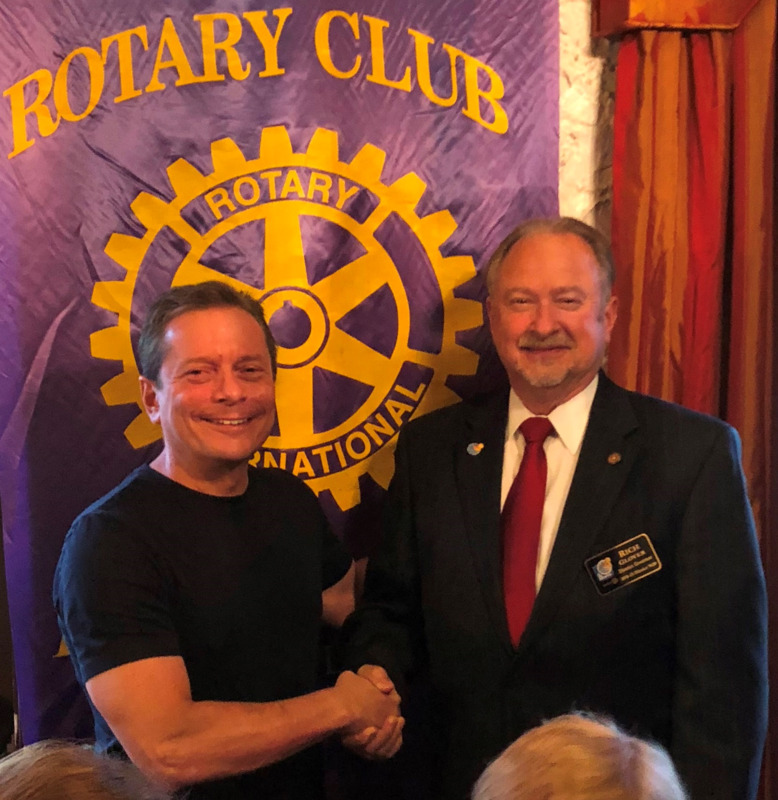 President Todd Nitkin thanked guest speaker Robert Drozd who addressed Maryland Legislative Issues and National Security at the Rotary Club meeting on August 17, 2017. 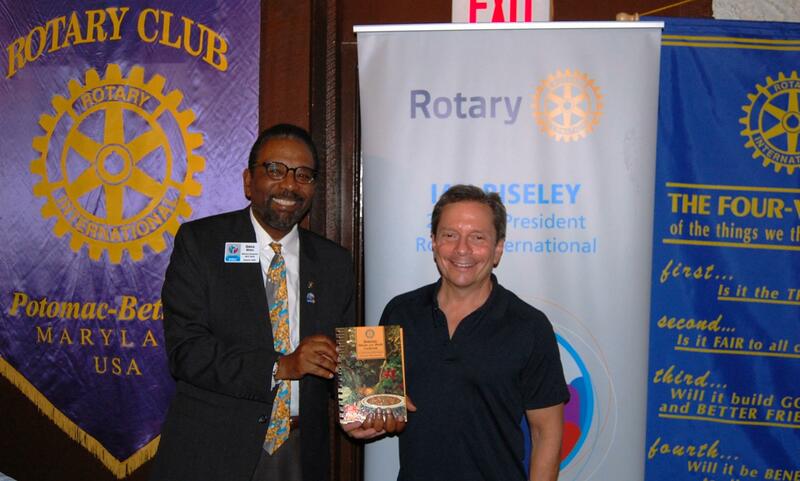 Author Judy Welles gave a presentation on Lilly Stone, a daring woman who changed the landscape of business and culture in Montgomery County, at the Rotary Club meeting on August 10, 2017. 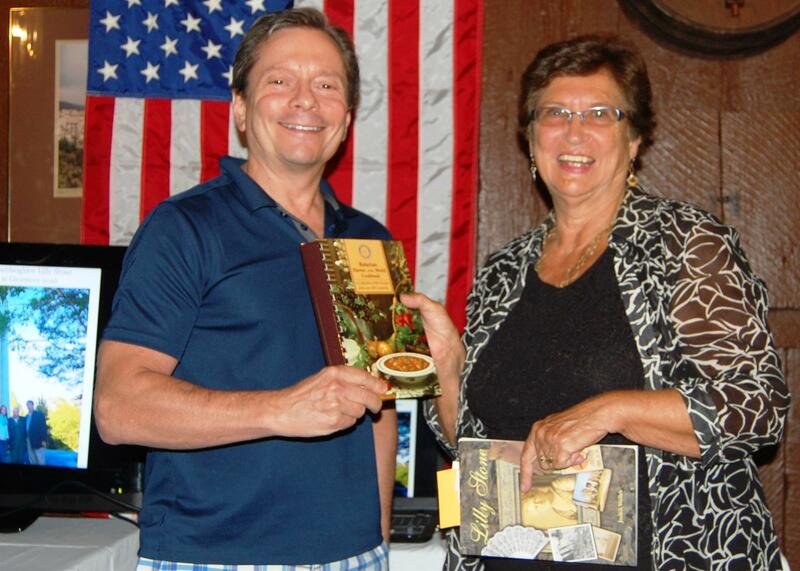 Author Judy Welles gave a presentation on Lilly Stone, a daring woman who changed the landscape of business and culture in Montgomery County, at the Rotary Club meeting on August 10, 2017. Lilly Stone was the grandmother of the late Potomac-Bethesda Rotarian John Stone. 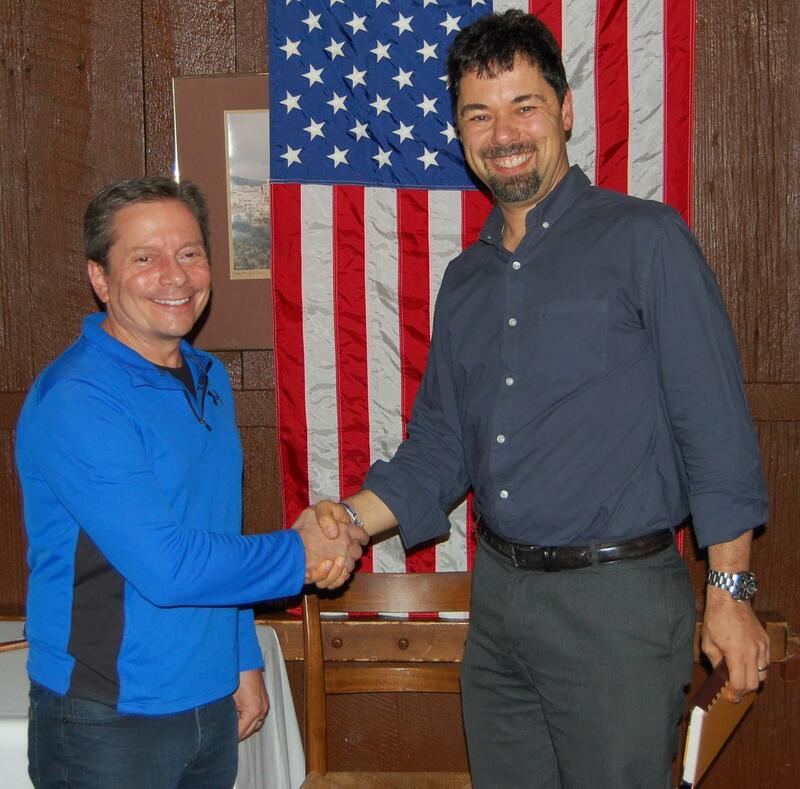 President Todd Nitkin thanked author, inspirational speaker and ultra-athlete Croix Sather at the meeting on July 20, 2017. 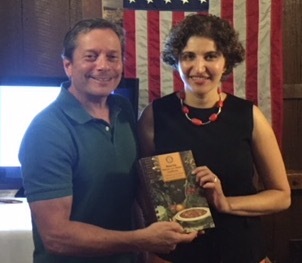 President Todd Nitkin presented the Rotary Cookbook to Author, Inspirational Speaker and Ultra-athlete Croix Sather at the Potomac-Bethesda Rotary Club Meeting on July 20, 2017. 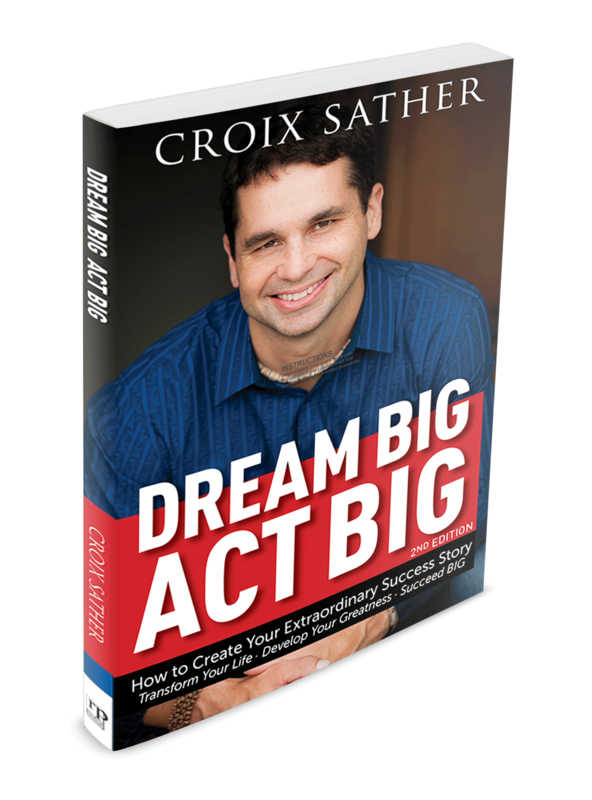 Croix Sather is an American author, inspirational speaker, and ultra-athlete. His self-help and personal development books cover the topics of personal transformation, self-help, psychology of success, and high achievement. "From the moment Croix steps on the stage he will captivate your audience. He starts strong and keeps your audience on the edge of their seats with his stories of his Run Across America and his World Record "Badwater Solo" Run through Death Valley when he crushed the previous record by almost 5 hours." 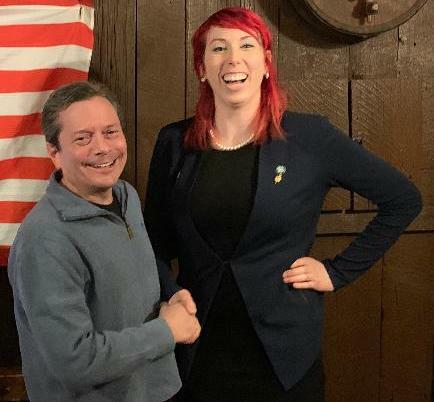 "What Croix has done is certainly impressive, but more impressive is how he has master the art of story telling to connect with your audience and inspire them in a way that creates lasting change. There is story telling and there is story telling that creates change because it reprograms your mind for success." "You can have a great keynote speaker presentation, or you can have a great keynote speaker presentation that will inspire your team and one that will increase their performance, productivity endurance, and discipline. Croix weaves in mindset and performance strategies that improve your teams performance organically into the stories and presentation." 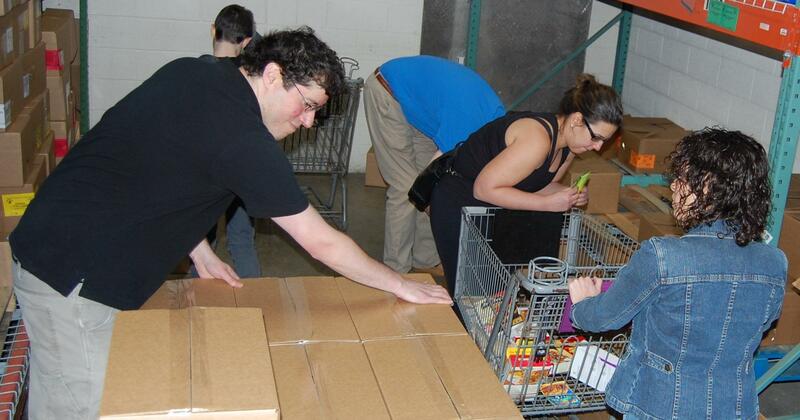 We have Manna Food Center box packing the second Tuesday of each month at 7pm. Please let Alex Naron know if you can join. Family and friends are welcome. 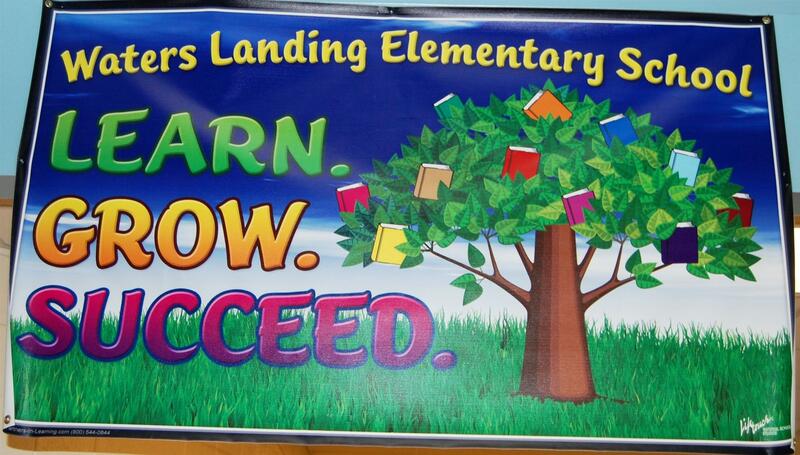 Student Service Learning forms will be completed. Location: 9311 Gaither Rd, Gaithersburg, MD 20877. Contact Alex with any questions at alexnaron@gmail.com or phone 240-620-4795. The flooding of March 27, 2017, in northern Peru destroyed the homes, fields and livestock of many families living in the shantytown of Nuevo Catacaos, which is located not far from the city of Piura, Peru. 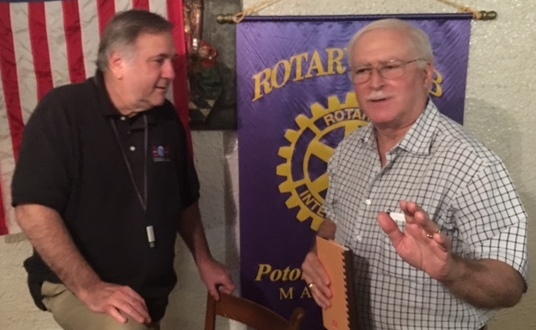 The Rotary Club of Piura reached out to the Potomac-Bethesda Rotary Club for possible assistance to benefit a small fraction of the perhaps 10,000+ people affected by the flooding in Nuevo Catacaos. 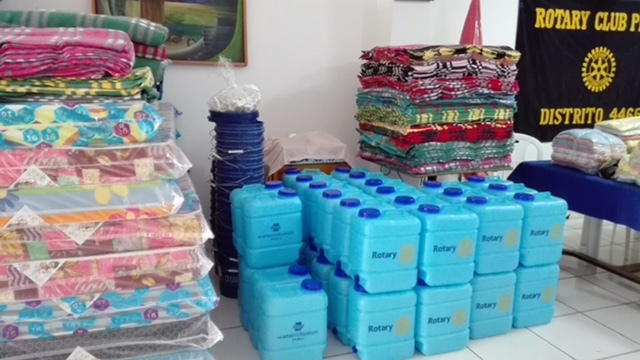 The assistance consisted of purchasing and distributing to dislocated families 120 mattresses, 120 blankets and 60 personal hygiene kits. The distribution took place on June 11, 2017. 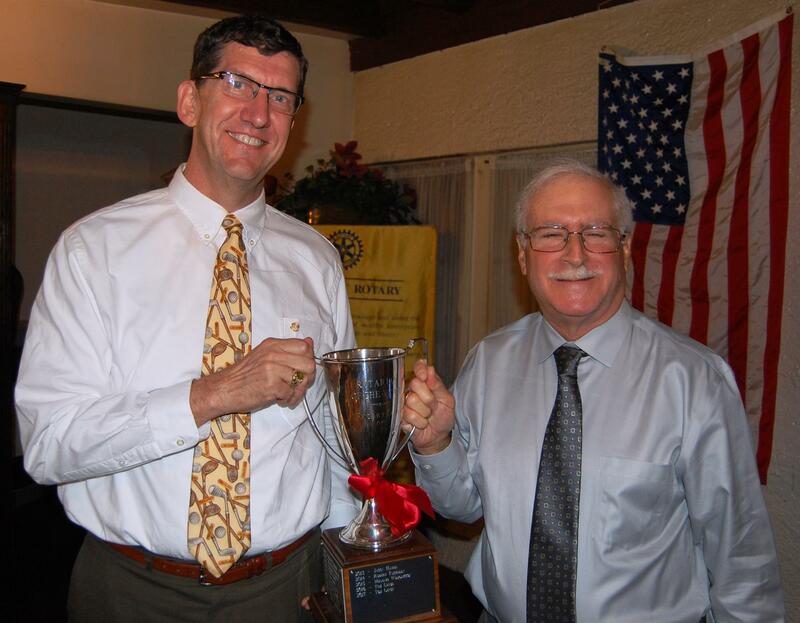 Tom Lewis received the Rotarian of the Year Award for 2016 and 2017 at the Rotary Club Meeting on June 22, 2017. 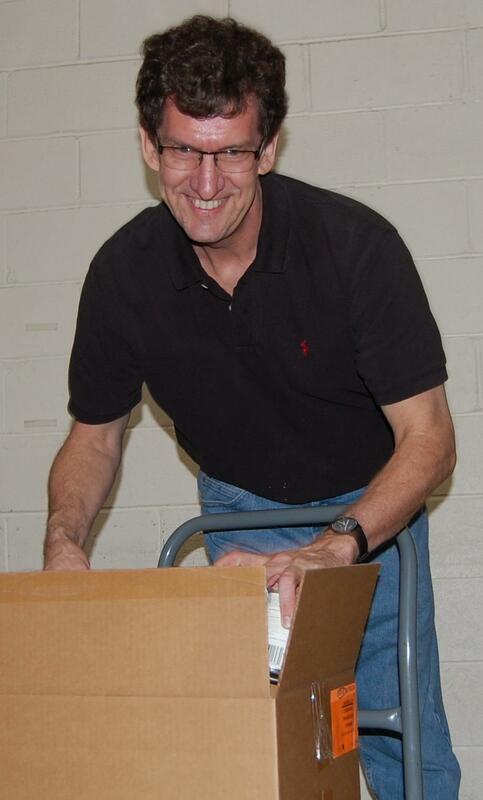 Tom continues to serve as the Potomac-Bethesda Rotary Club Treasurer and is the Vice President for Business Development at LKA Computer Consultants. 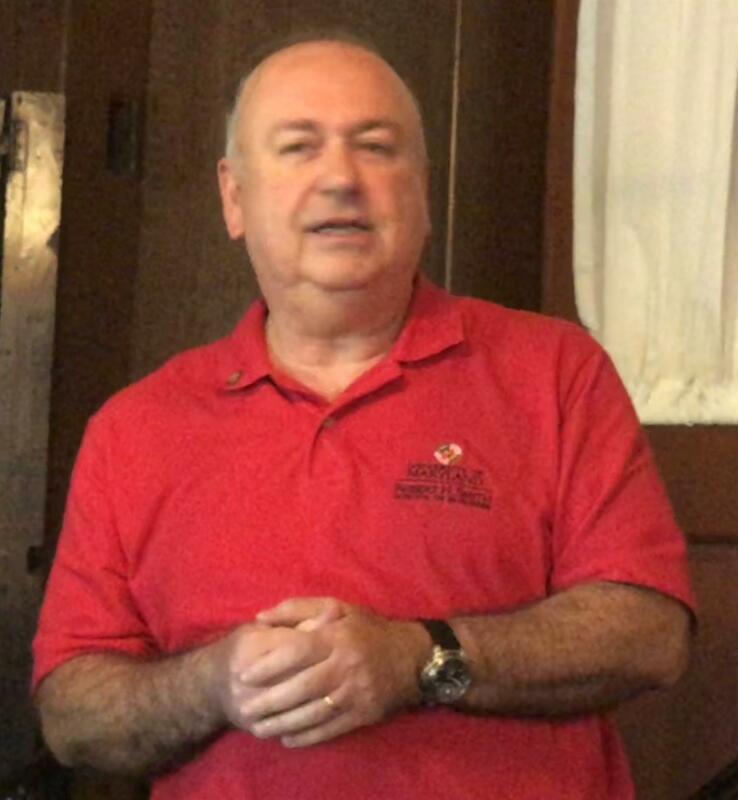 George Clack led a discussion on sanctuary cities and immigration issues at the Rotary Club Meeting on June 22, 2017. 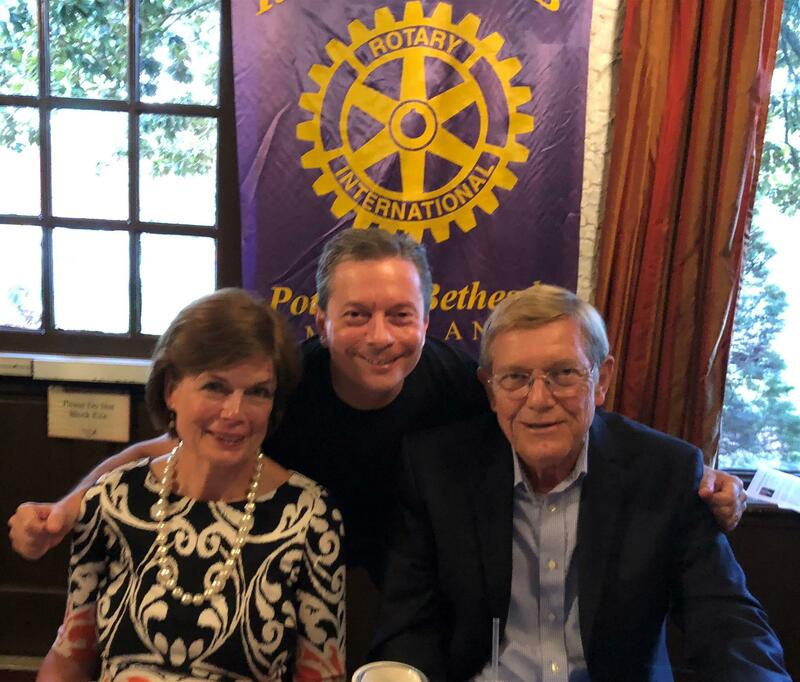 Ed Kerns spoke on "What Does Climate Change Mean for Business and Civic Leaders?” at the Rotary Club Meeting on June 8, 2017. Ellicott City, Montgomery Village and Potomac-Bethesda Rotarians share a table at the Rotary District Conference banquet on May 6, 2017. 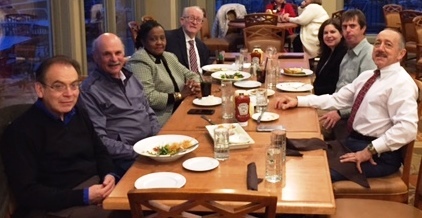 [L-R] Dr. Fred Lewis, EC President Bruno Reich, EC President-elect Pam Kreis, Nancy Mason, Bob Nelson, PB President Bob Fuhrman, Cecilia and Edco Bailey. 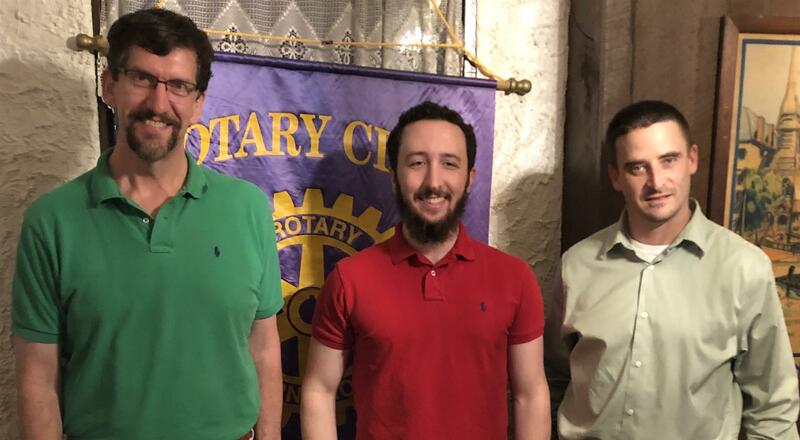 Dinner and Live Music was featured at the Potomac-Bethesda Rotary Meeting on May 4, 2017. 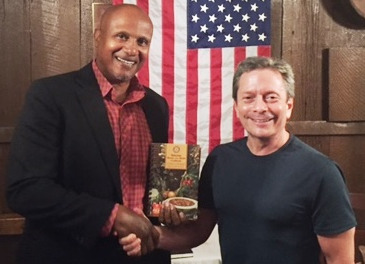 On April 20, 2017 President Bob Fuhrman congratulated Alan Grant's nephew Ari Menes who spoke on "What film means to me" and showed several montages he made. President Bob Fuhrman thanked Neil Cohen for sharing ways to optimize benefits of air travel bonus miles during his presentation "Frequent Flyer University” on April 13, 2017. Back from his trip to Maui, President Bob Fuhrman thanked Neil Cohen for sharing ways to optimize benefits of air travel bonus miles during his presentation "Frequent Flyer University” on April 13, 2017. 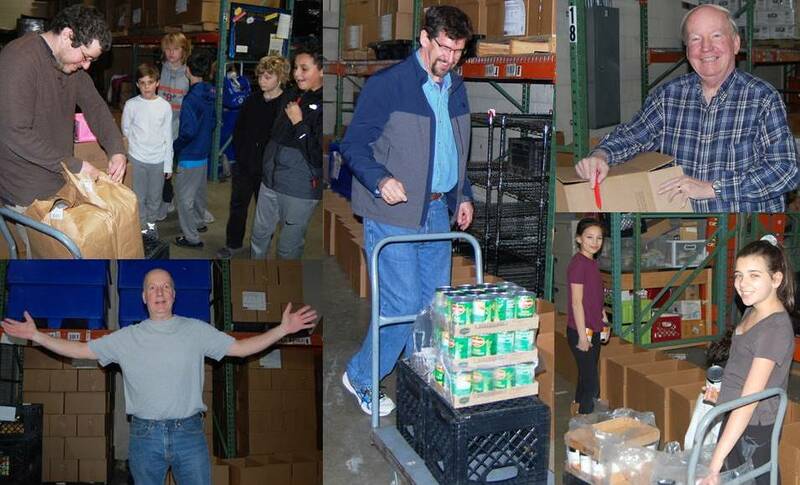 Rotarians Tom Lewis, Bob Nelson and Steve Naron with sons Alex and Will and other volunteers pack 200 food boxes at Manna on April 11, 2017. 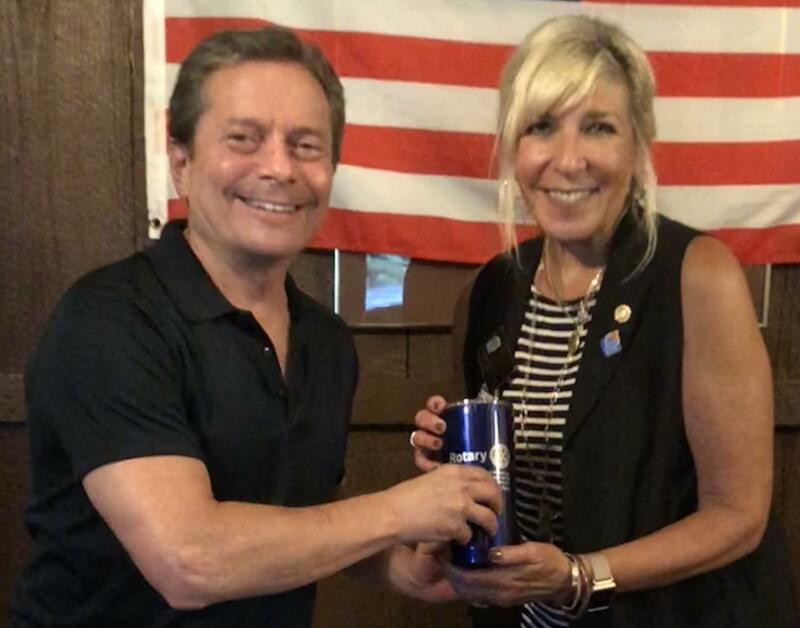 President Bob Fuhrman congratulates Guest Speaker Vicki Perper on her presentation “The Importance of Fighting Back Against Plaque” at the Rotary Club meeting on April 6, 2017. 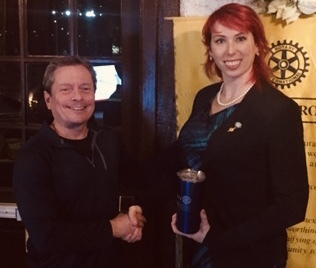 President Bob Fuhrman congratulates Guest Speaker Vicki Perper on her presentation “The Importance of Fighting Back Against Plaque” at the Rotary Club meeting on April 6, 2017. Photo by Tom Lewis. 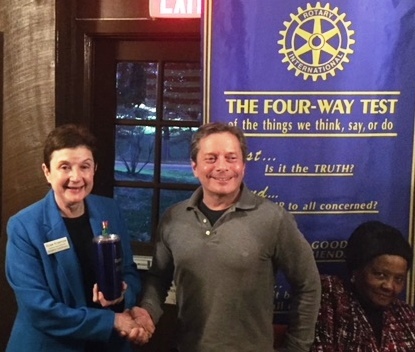 Treasurer Tom Lewis congratulates President-Elect Todd Nitkin on his presentation "The Inspiration School Project of Ethiopia,” the largest international project ever for the Potomac-Bethesda Rotary Club at the meeting on March 23, 2017. 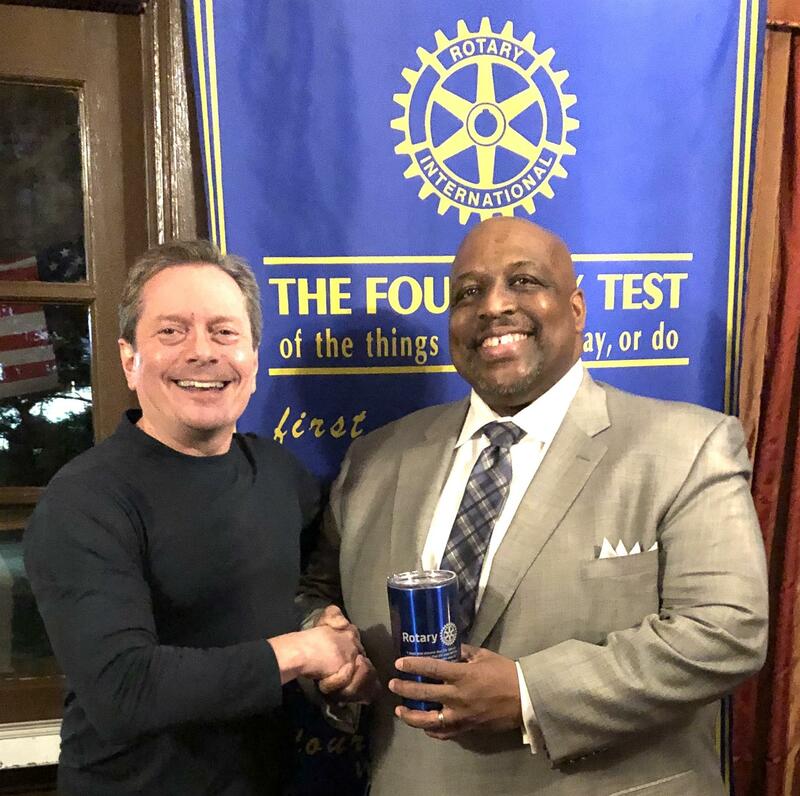 Treasurer Tom Lewis congratulates President-Elect Todd Nitkin on his presentation "The Inspiration School Project of Ethiopia,” the largest international project ever for the Potomac-Bethesda Rotary Club at the meeting on March 23, 2017. More information is available at www.inspireethiopia.org. 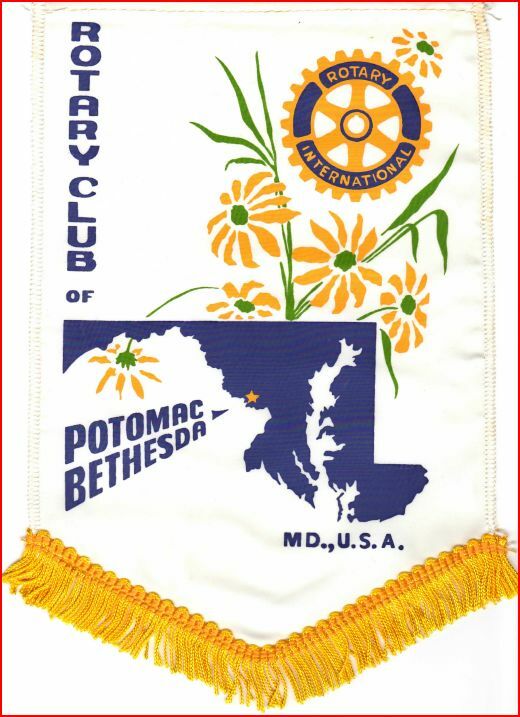 There's room at the table at the Potomac-Bethesda Rotary Club meeting on March 16, 2017. Join us! 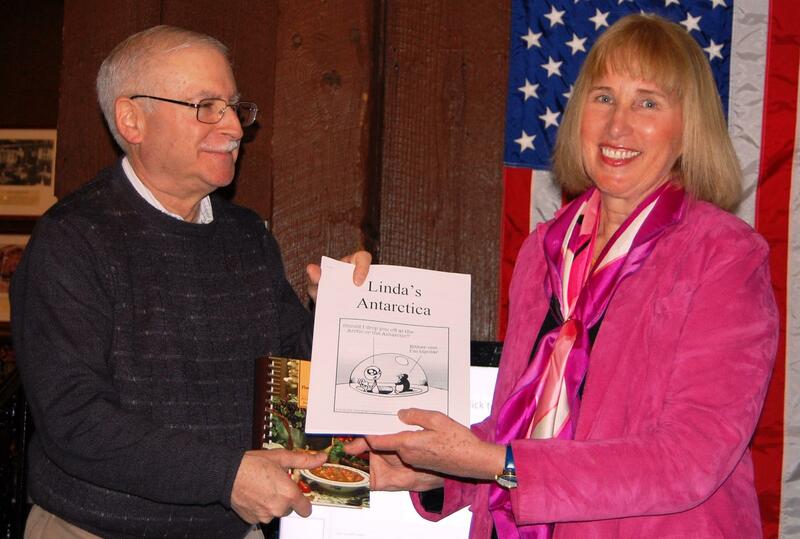 Linda Meade gave an excellent presentation on her Antarctica Adventure at the Rotary Club Meeting on March 9, 2017. 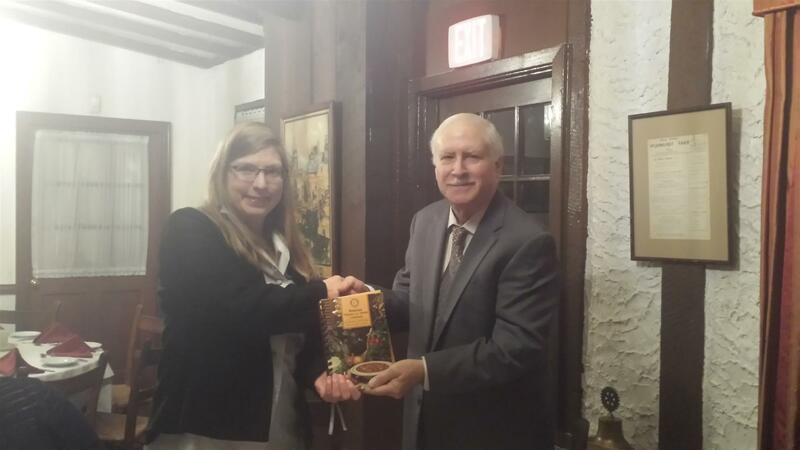 Guest Speaker Dr. Karina Korostelina Addressed the Conflict in the Ukraine at the Potomac-Bethesda Rotary Club Meeting on March 2, 2017. 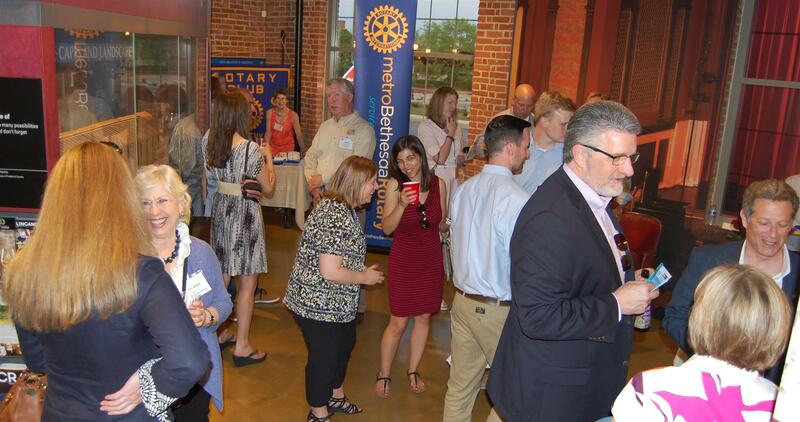 Kathleen Koch spoke about LeadersLink and their First Annual Mardi Gras Bash Fundraiser coming up on February 25. 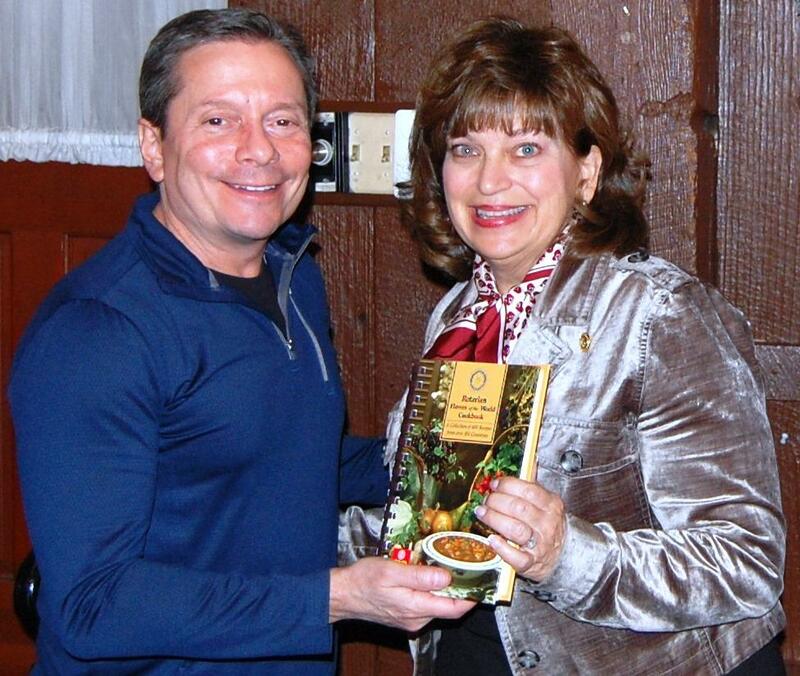 President Bob Fuhrman presents the Rotary Cookbook to guest speaker Kathleen Koch. 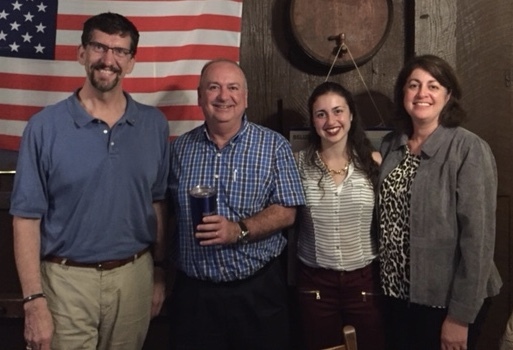 President Bob Fuhrman and his wife Nan welcomes District Governor Nominee Designate Barton Goldenberg and his wife Marina. Former Area Governor Dr. Barry Thompson and his wife Jo Ann. 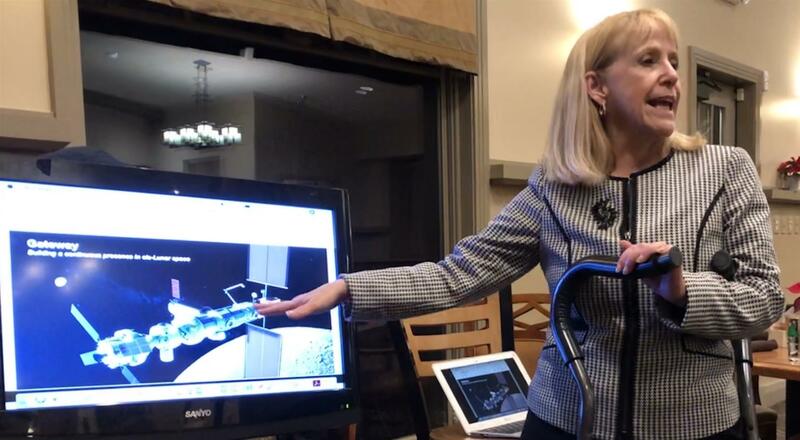 NASA's Dr. Michelle Thaller gave a wonderful photo presentation on recent space discoveries including Jupiter, Mars and Saturn at the Potomac-Bethesda Rotary Club meeting on January 19, 2017. 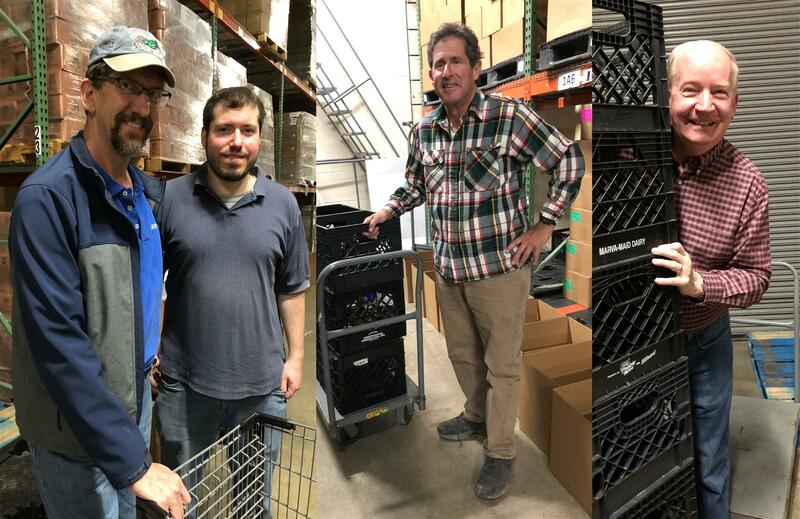 [L-R] Bob Nelson, Tom Lewis and Alex Naron at the Manna Food Center on January 10, 2017. 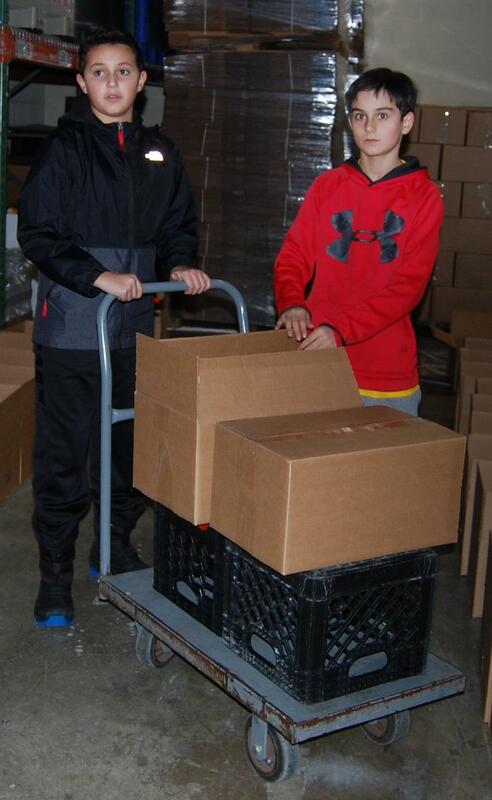 The Rotarians and volunteers packed 96 boxes of food for needy families in Montgomery County. 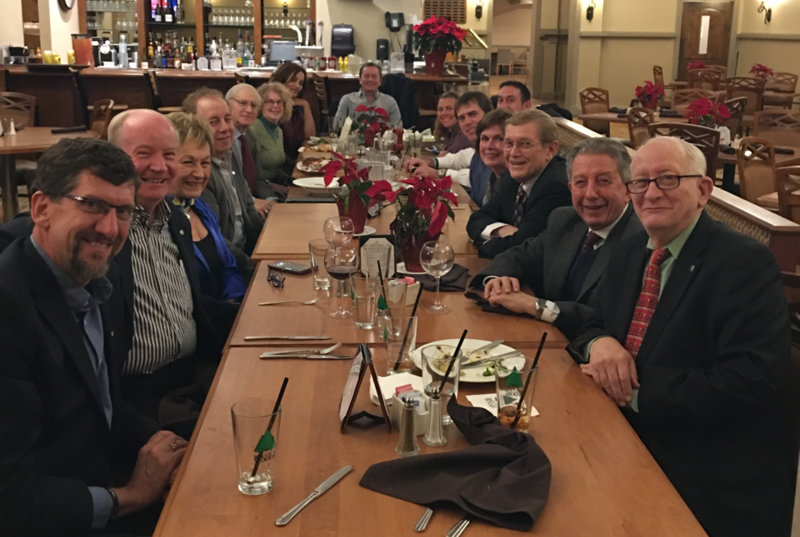 Club Assembly Dinner Meeting on Thursday, January 5, 2017, kicked off the new year. 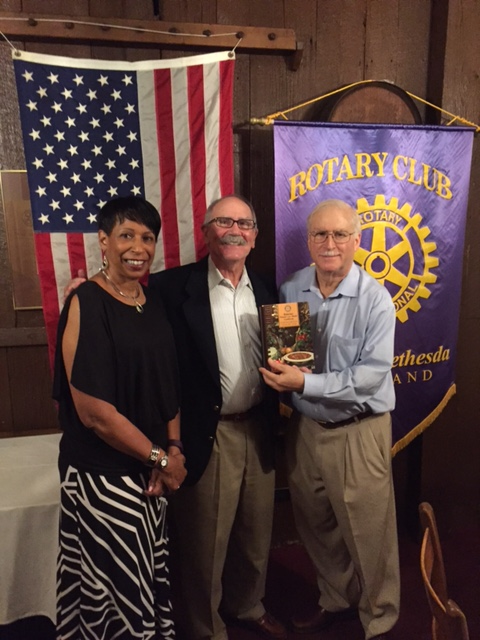 Art Blitz gave a review of Historian Joseph J. Ellis' Book "The Quartet" at the Rotary Club meeting on December 15, 2016. 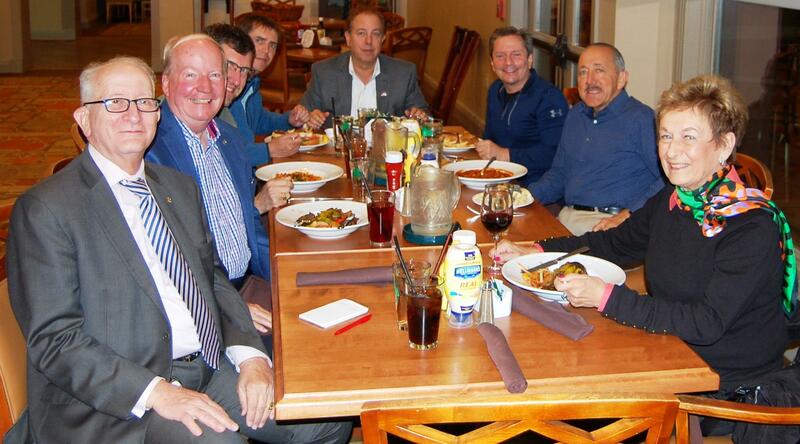 Tom Lewis convened the meeting for the President. Above is just a sampling of the many thank you notes that were received by the Potomac-Bethesda Rotary Club from third-grade students who had received a dictionary. 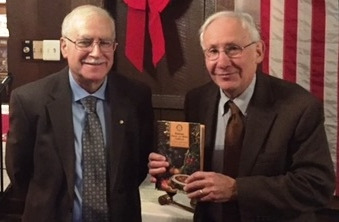 President Bob Fuhrman presented a Rotary Cookbook to Dr. Joseph Goldberg to thank him for his talk, “India - Potential for Terrorism and Armed Conflict” at the Rotary Club Meeting on December 1, 2016. 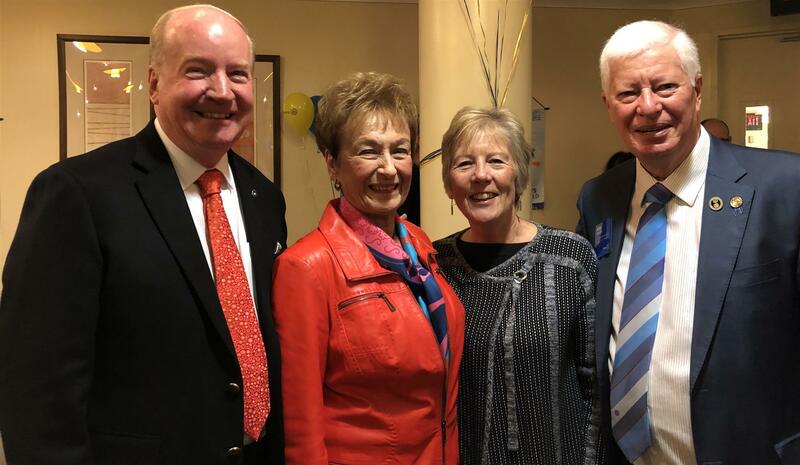 The Rotary Foundation (TRF) recently announced club recognitions based on annual foundation giving for the 2015-2016 Rotary year ending June 30. 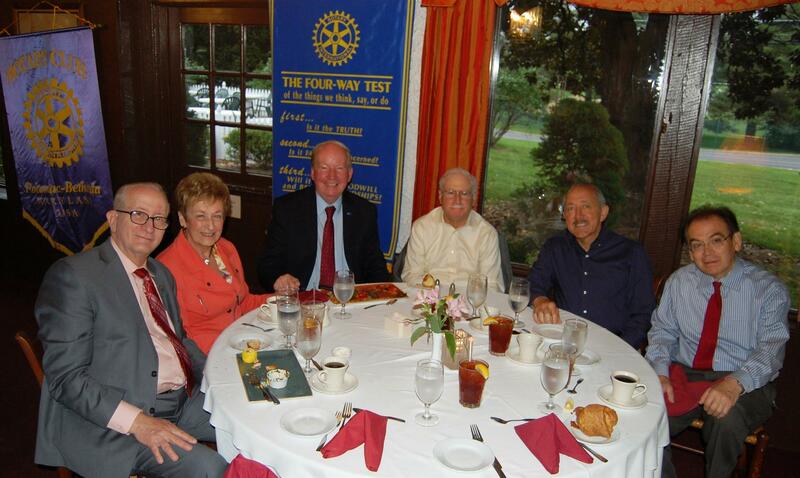 The Rotary Club of Catonsville with contributions to the Annual Fund of $341.67 per capita was ranked first in District 7620. 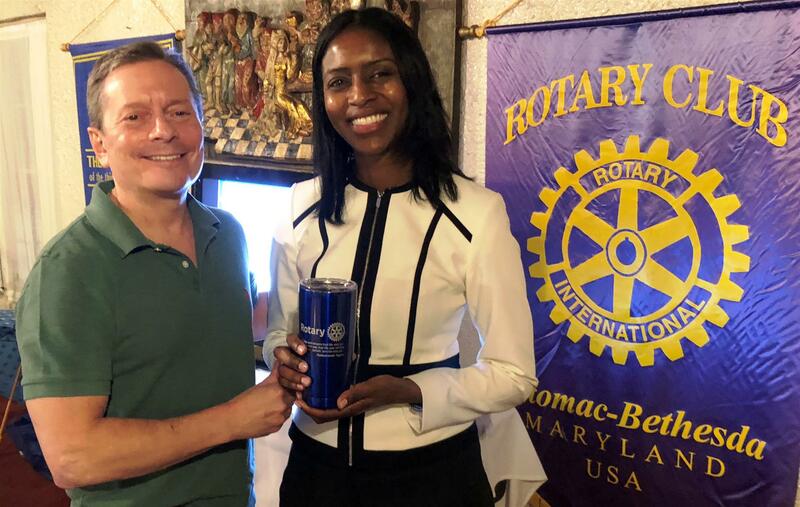 The Rotary Club of Ellicott City ranked second with per capita giving of $322.61 and the Rotary Club of College Park ranked third with per capita giving of $316.30. These clubs were three of only 1564 clubs worldwide to achieve Top Three Highest in Per Capita Annual Giving honors. Only clubs with a minimum of US$50 per capita were eligible. Eleven district clubs were recognized as a 100% Foundation Giving Club. They were: Aberdeen, Baltimore, Bonds Meadow, Catonsville, College Park, Columbia Town Center, Crofton, Elkridge, Metro Bethesda, Potomac, and Potomac-Bethesda. Only 4,609 clubs worldwide attained this status. To be eligible, 100% of all active members must personally contribute to TRF and the average contribution must be at least US$100. 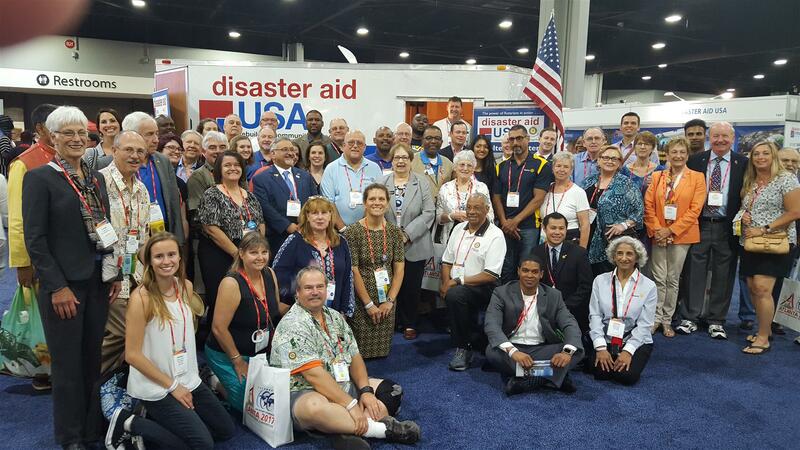 Six district clubs were among the 2,253 clubs worldwide to attain 100% Foundation Sustaining Member Club status. They were: Aberdeen, Baltimore, Bonds Meadow, Columbia Town Center, Metro Bethesda, and Potomac-Bethesda. The above clubs received banners noting their accomplishments. 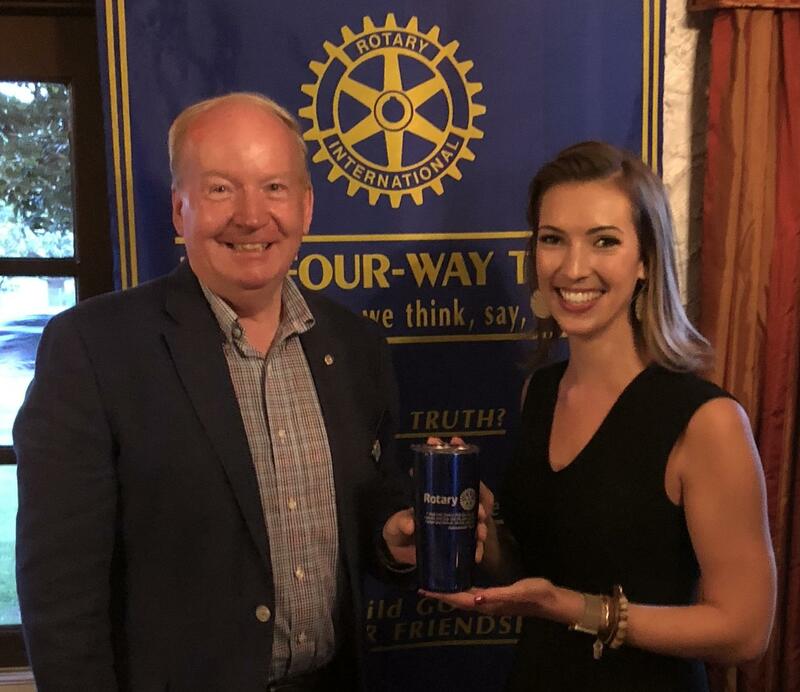 Twenty Clubs were honored for supporting the End Polio Now Campaign with an annual donation of $1,500 or more to the PolioPlus fund. The clubs, recognized with a certificate of appreciation, included Aberdeen, Annapolis, Bethesda-Chevy Chase, Bonds Meadow, Carroll Creek, Charles County (La Plata), College Park, Columbia, Columbia-Patuxent, Frederick, Gaithersburg, Glen Burnie, Lake Shore-Severna Park, Lexington Park, Montgomery Village, Parole, Potomac, Potomac-Bethesda, Silver Spring-Kensington, and South Anne Arundel County. Congratulations to each of the clubs recognized. These contributions to TRF help to fulfill the dream of sixth RI President Arch Klumph when he envisioned an endowment for the purpose of “doing good in the world” one hundred years ago. 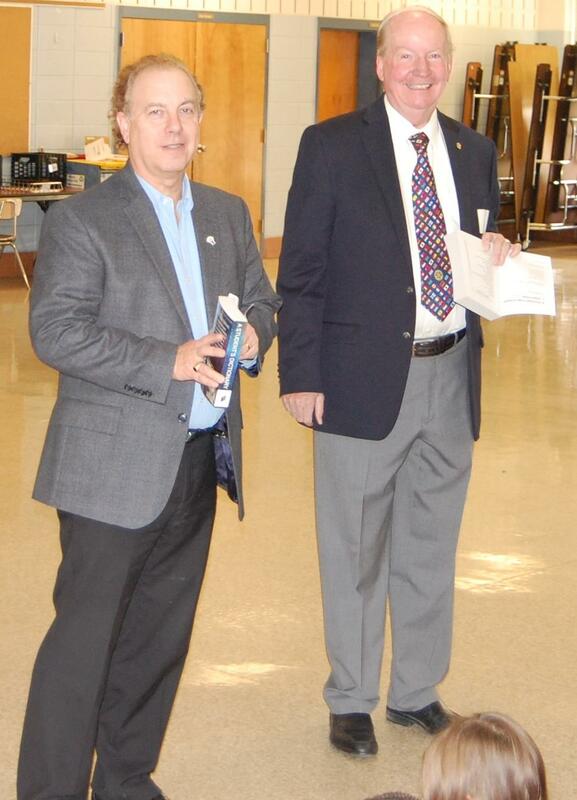 Alan Grant and Bob Nelson distributed dictionaries to third graders at Waters Landing Elementary School on November 15, 2016. 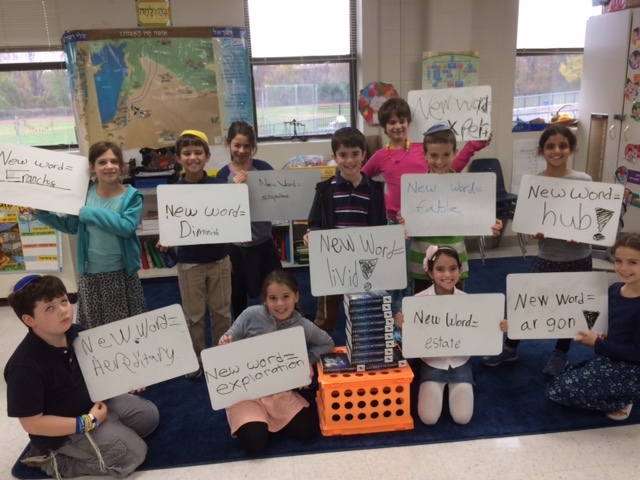 [Below] Students at the Melvin Berman Hebrew Academy display new words they found in their dictionaries. Back from photo safaris in Botswana and South Africa on November 10, 2016, Nancy Mason and Bob Nelson showed some of their photos from their exciting journey. Back from photo safaris in Botswana and South Africa, Nancy Mason and Bob Nelson showed 167 photos from their exciting journey. 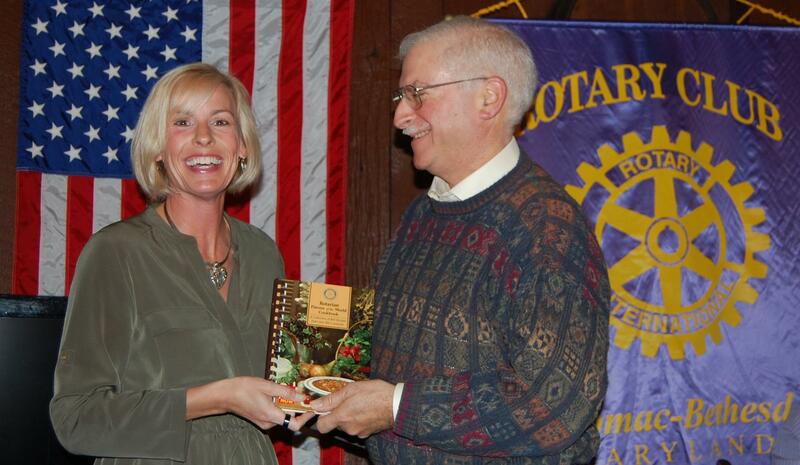 Nancy received the Rotary Cookbook from President Bob Fuhrman for her presentation. 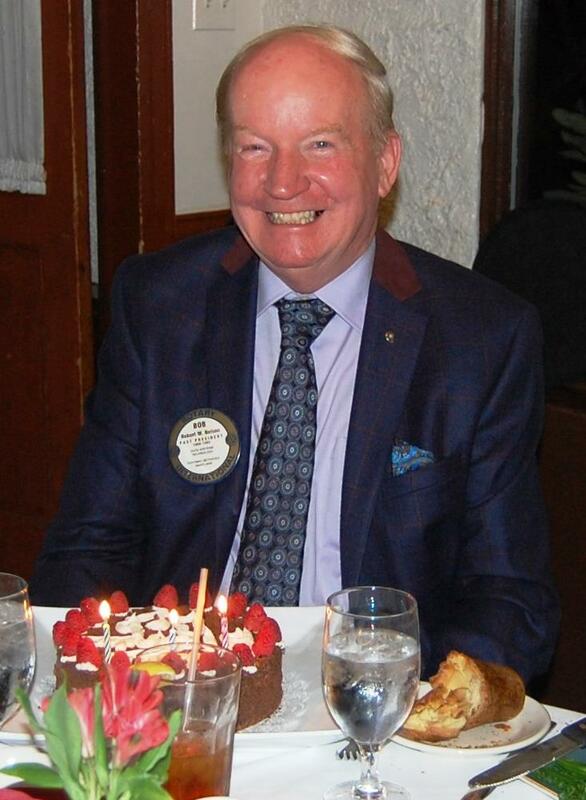 Bob Nelson celebrated his birthday at the Rotary Club meeting. On October 27, 2016, Susan Mathiascheck spoke on environmental policy related to nuclear power plants including storage and disposal of spent nuclear fuel. Susan also addressed the role nuclear power could potentially play in reducing U.S. dependency on combustion of fossil fuels such as coal, oil, and natural gas and resistance to expanding US nuclear capacity by environmental advocacy groups. October 20, 2016 meeting featured Professor Rudolph Hock's talk, "America, a Mirror Image of Ancient Rome?" 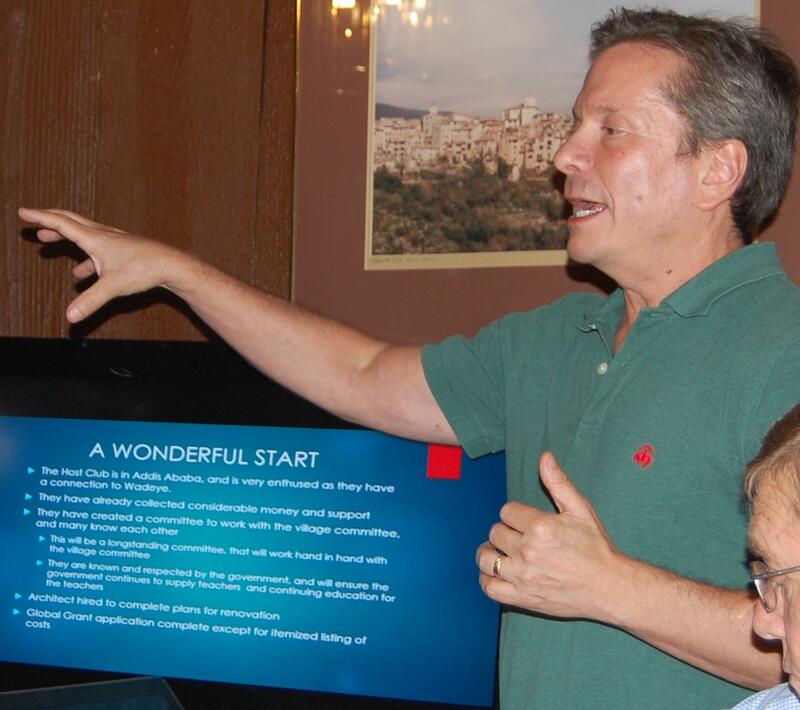 Professor Hock discussed the "republican" aspects of both the U.S. and Roman systems of government in addition to his preference for the study of Rome versus ancient Greek civilization and history. 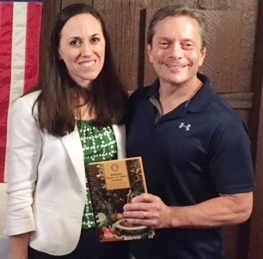 On October 13, 2016, guest speaker Samantha Horwitz was thanked by President Bob Fuhrman after her talk about her new book, "The Silent Fall: A Secret Service Agent's Story of Tragedy and Triumph After 9/11​." September 29 Rotary Club Meeting: John F. Kennedy as Discussed in William Leuchtenberg's Book "The American President"
[Above] President Bob Fuhrman provided an overview of the chapter on the Presidency of John F. Kennedy presented in William Leuchtenberg's history titled "The American President." Attendees shared perceptions and reflections on the pivotal years between the relative tranquility of the Eisenhower years and the emotional and political upheavals that followed the assassination of President Kennedy. 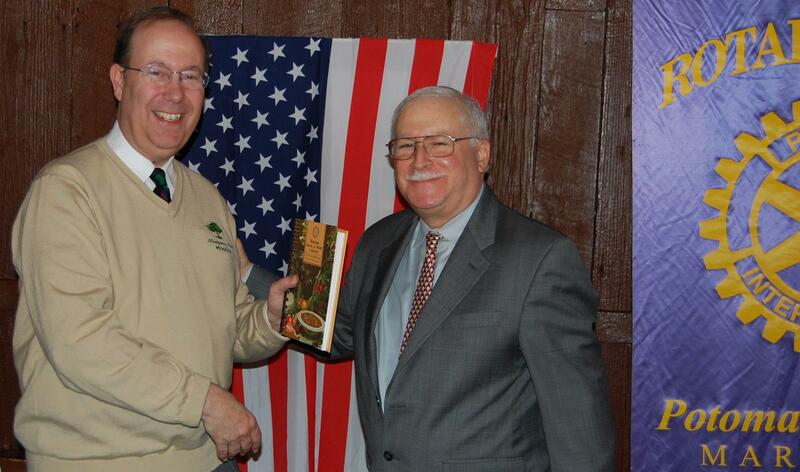 [Below] Tom displays a copy of his father's book and Steve Naron visited from Hollywood Florida. 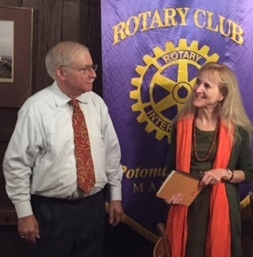 Dr. Susan Rich spoke about "Fetal Alcohol Spectrum Disorder" at the Potomac-Bethesda Rotary Club meeting on September 15, 2016. 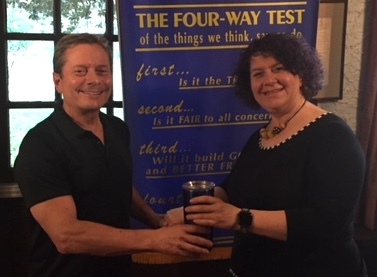 Dr. Susan Rich spoke about "Fetal Alcohol Spectrum Disorder" at the Potomac-Bethesda Rotary Club meeting on September 15, 2016. 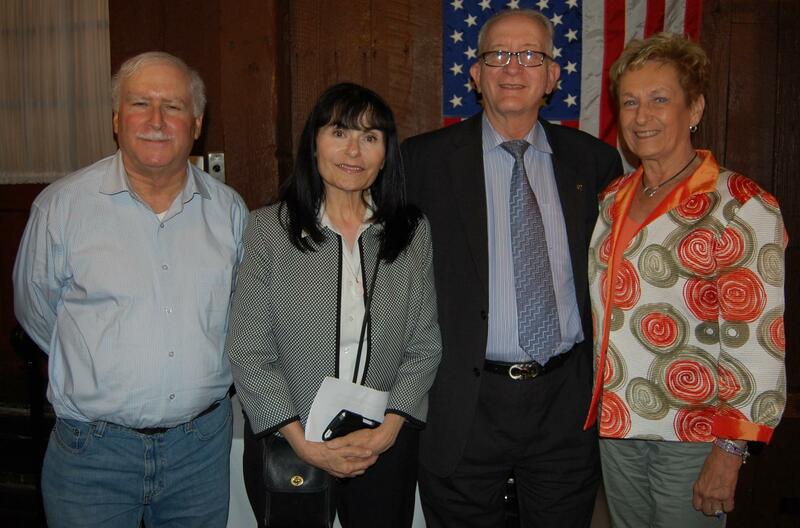 Pictured [L-R] are State Senator Brian Feldman, Dr. Susan Rich, President Bob Fuhrman and State Delegate Aruna Miller. 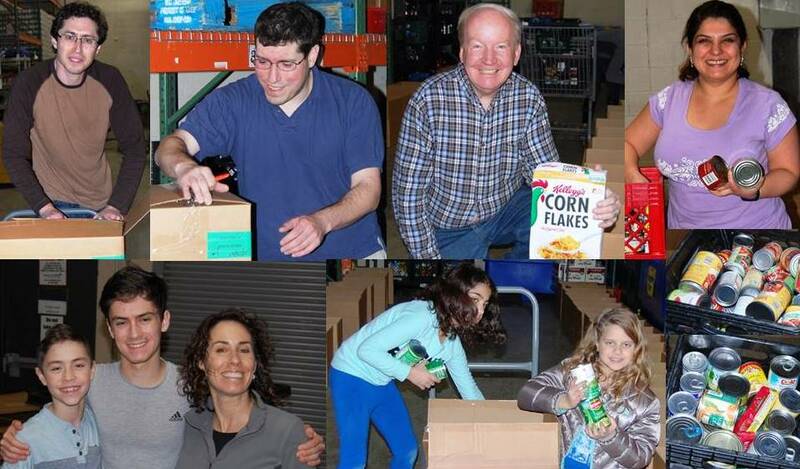 Alex Naron, Bob Nelson and new recruit Rosa Diaz packed 144 boxes at the Manna Food Center in Gaithersburg on September 13, 2016. 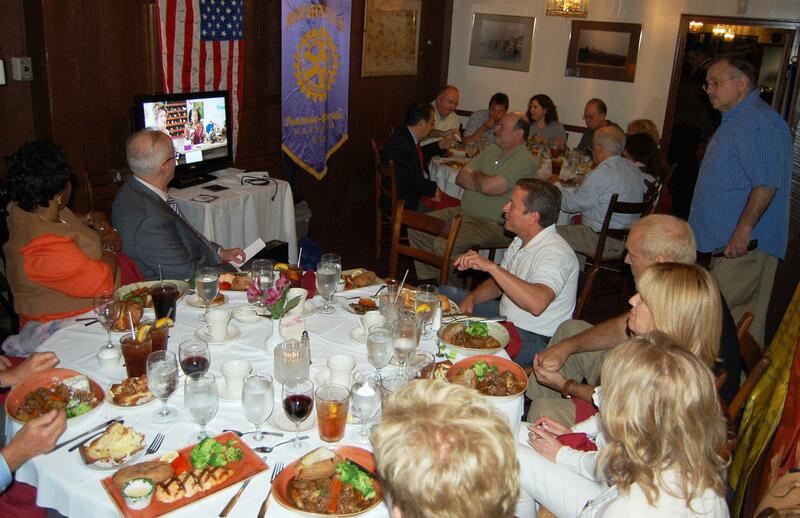 Dr. Neil Cohen presented the TV sitcom pilot “Bennie’s Gym” starring Ed Asner that he produced locally at the Potomac-Bethesda Rotary Club meeting on September 1, 2016. 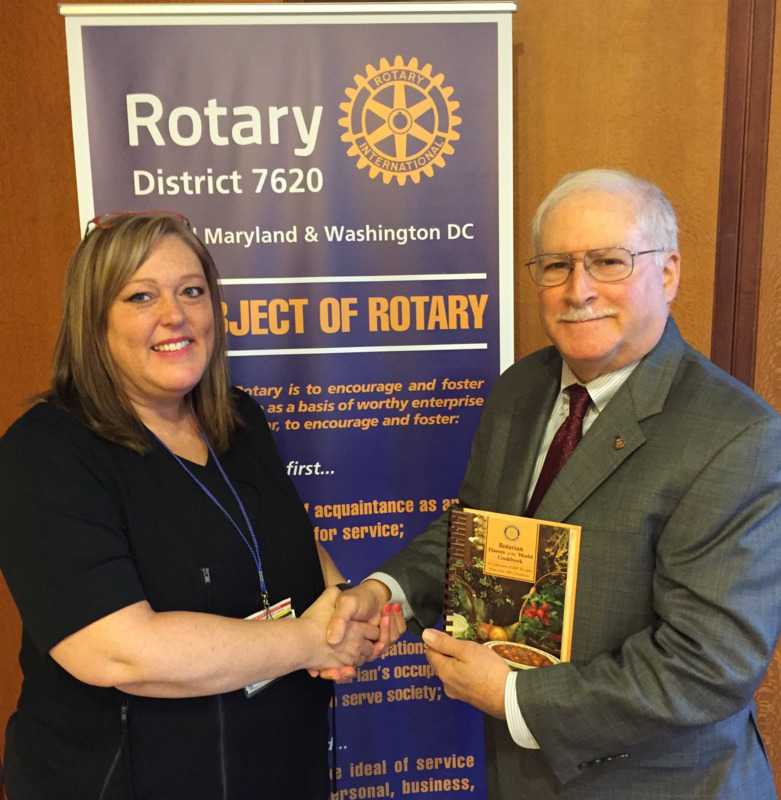 President Bob Fuhrman thanked Rotary District Governor Dr. Anna-Mae Kobbe for her presentation during the official visit at the Potomac-Bethesda Rotary Club on August 25, 2016. 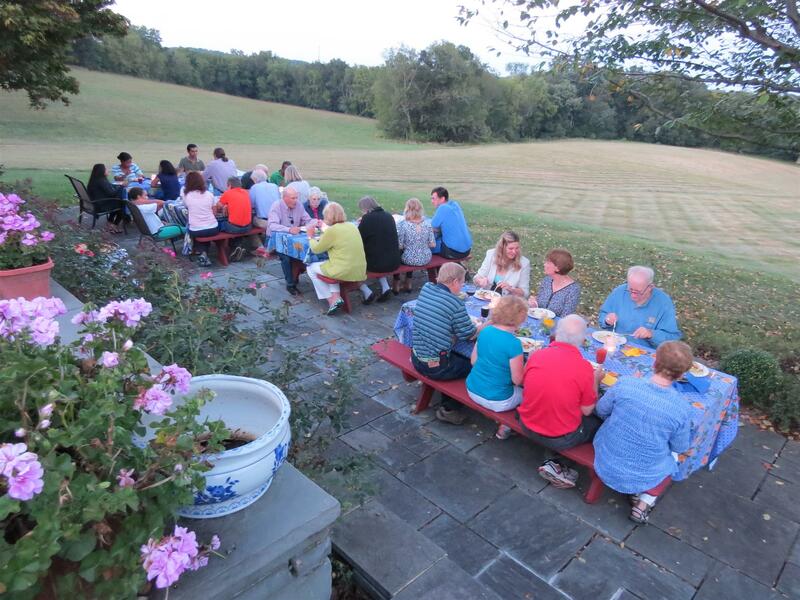 Rotary SummerFest at Bluestone Sanctuary on August 20, 2016, was enjoyed by 40+ Rotarians and guests. 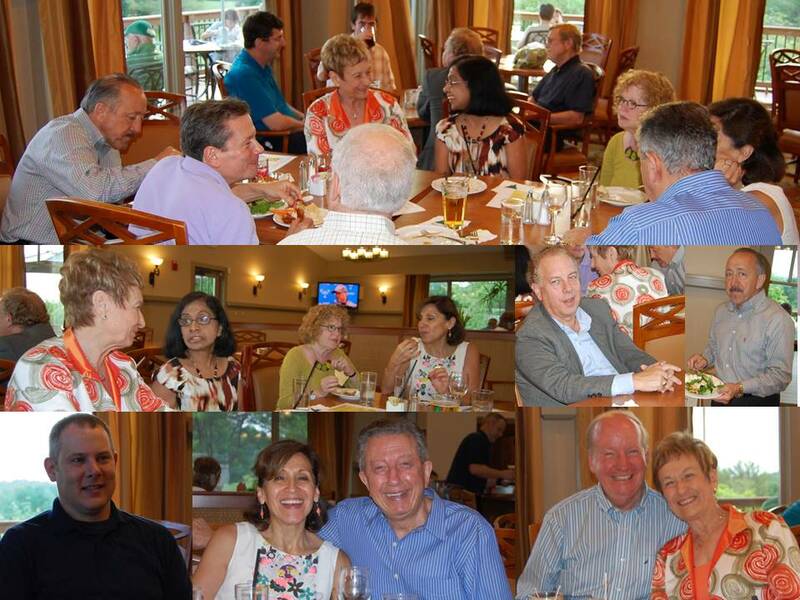 Rotary SummerFest at Bluestone Sanctuary on August 20, 2016, was enjoyed by 40+ Rotarians and guests from Potomac-Bethesda Rotary, Ellicott City Rotary, EC Sunrise Rotary and Howard West Rotary Clubs. 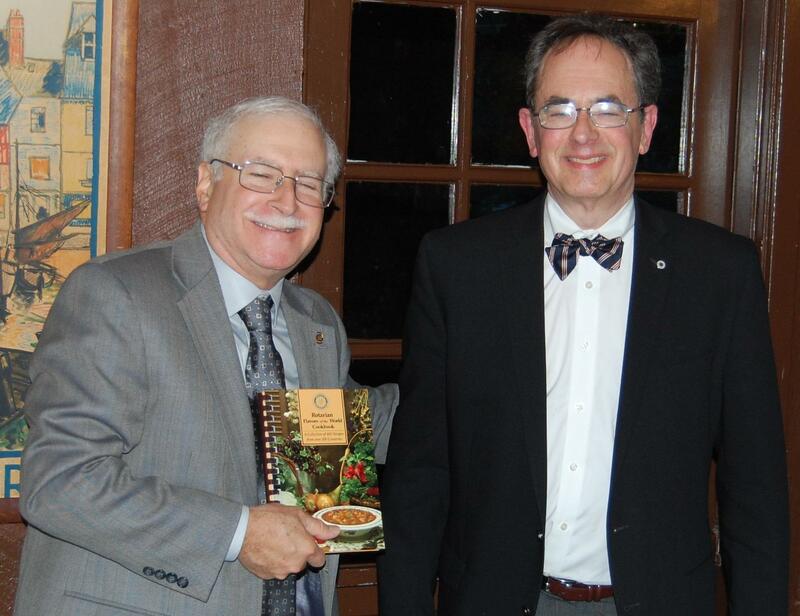 Dr. Stephen Hellman gave Dr. Stephen Vaccarezza a Rotary Cookbook for his presentation on his trip to Greece at the Potomac-Bethesda Rotary Club meeting on August 11, 2016. 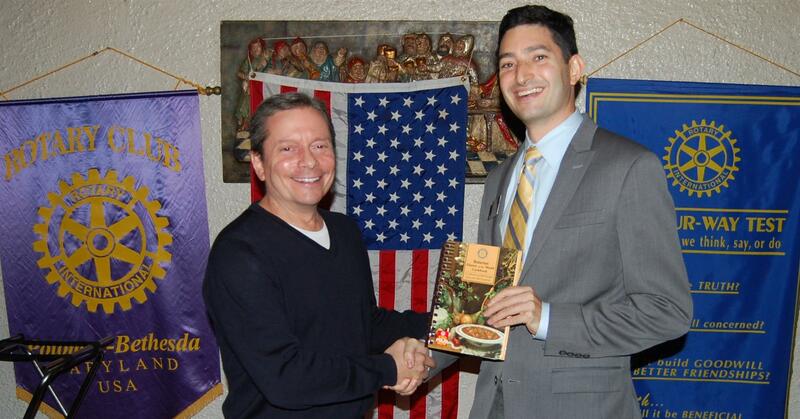 [Above] Dr. Stephen Hellman gave Dr. Stephen Vaccarezza a Rotary Cookbook for his presentation on his trip to Greece at the Potomac-Bethesda Rotary Club meeting on August 11, 2016. 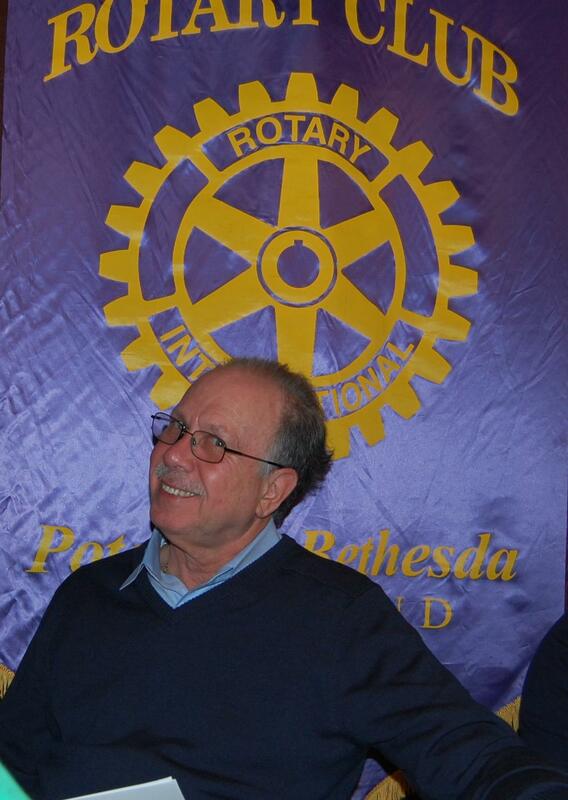 Dr. Stephen Vaccarezza is the Treasurer of the North Bethesda Rotary Club. 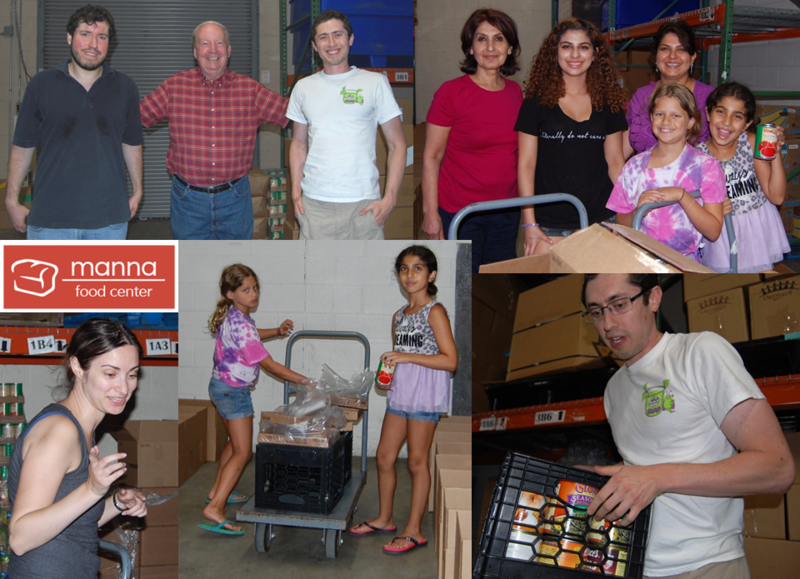 On August 9, 2016, we packed 192 boxes of food at Manna Food Center for needy families in Montgomery County. 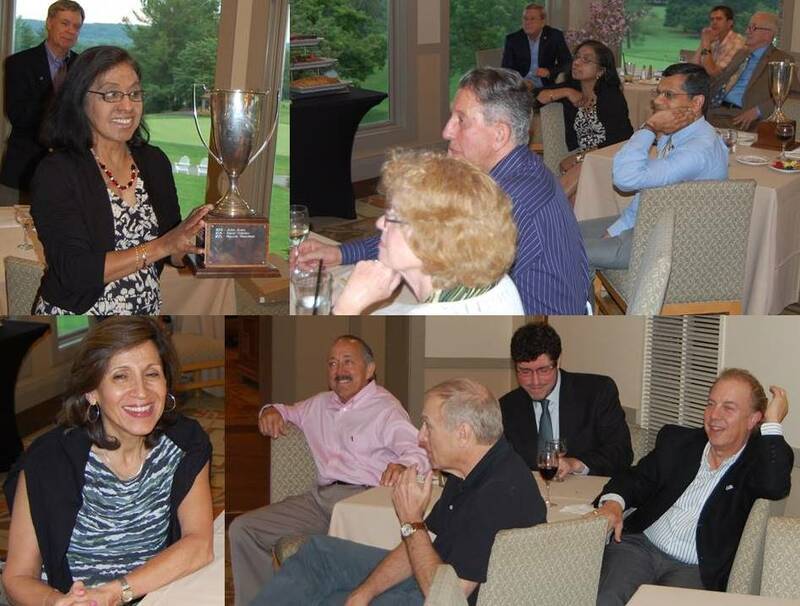 Potomac-Bethesda Rotarians enjoyed a Summertime Social at Bretton Woods Recreation Center on August 4, 2016, the 36th Anniversary of the Club's Chartering. 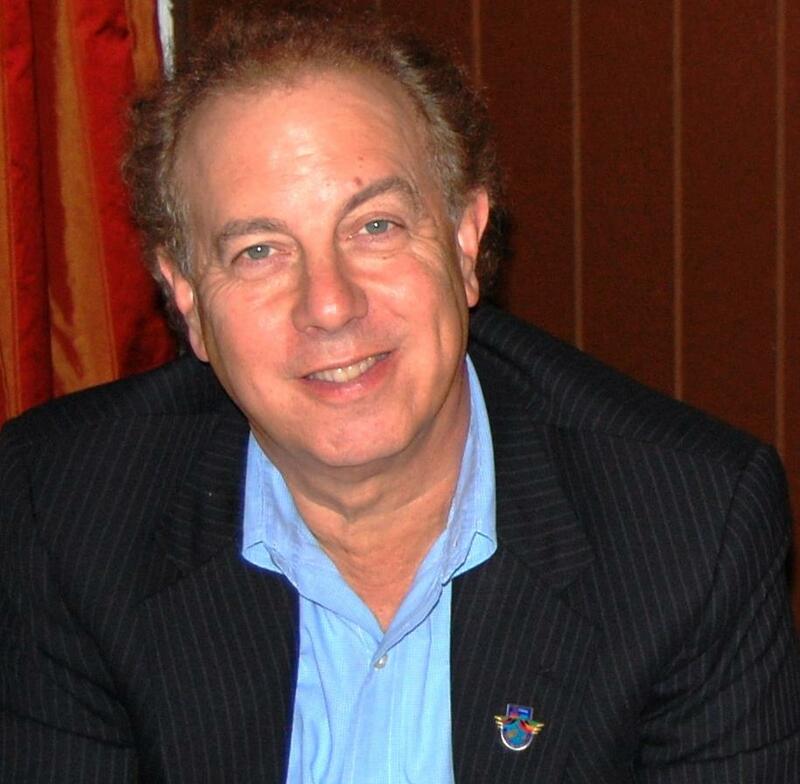 On July 28, 2016, Dr. Todd Nitkin described a New Project, "The Inspiration School Project of Ethiopia" that aims to build a complete, fully sustainable school system in the rural village of Wadeye, where presently no functioning school system exists. President Elect Dr. Todd Nitkin talked about Inspire Ethiopia, the Inspiration School Project of Ethiopia. The purpose is to build a complete, fully sustainable school system in the rural village of Wadeye, where presently no adequate school exists. It starts with the transformation of the primary school, complete with suitable infrastructure including classrooms, desks and chairs, teaching materials, a science center, a library, access to water and sanitation, and a playground. Instructors will be fully certified, and they will be supplied by the government upon certification of the school. Two Village Committees have already been formed, one in Wadeye and one in Addis, and a Parent Teacher Association to ensure the teachers receive continuing education and the school system continues to operate at a high level of competency. Please visit InspireEthiopia.org for more information and join Todd in transforming Ethiopia, one new student at a time! 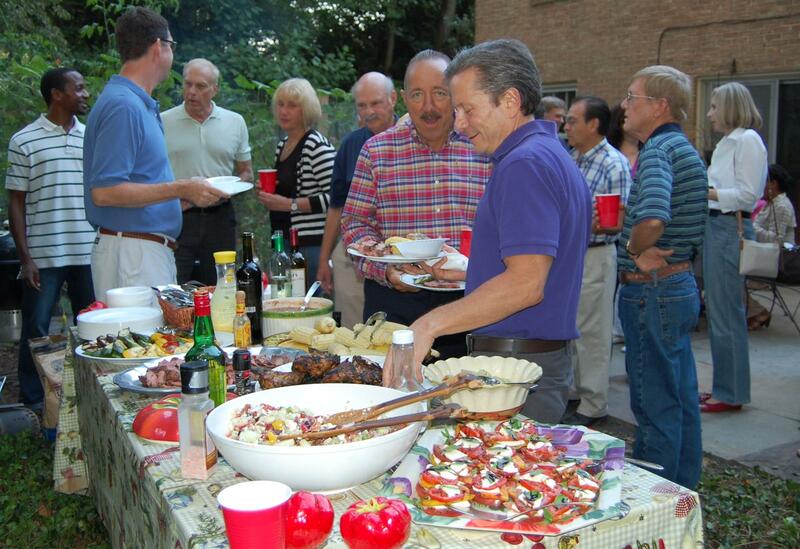 Potomac-Bethesda Rotarians enjoyed a summertime social at Bretton Woods Recreation Center on July 21, 2016. 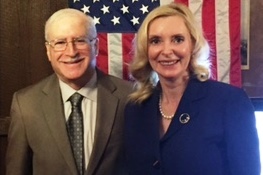 Guest Speaker on July 14, 2016, was Steven Grant, Mayor of Boynton Beach, Florida. 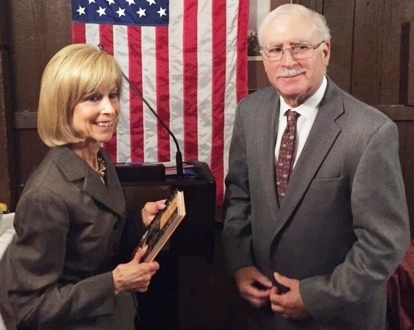 President Bob Fuhrman welcomed guests on July 14, 2016: Buck Williams, retired from the NBA; Steven Grant, newly installed Mayor of Boynton Beach, Florida; Irene Grant; Nancy Mason and Nabil Bedewi. 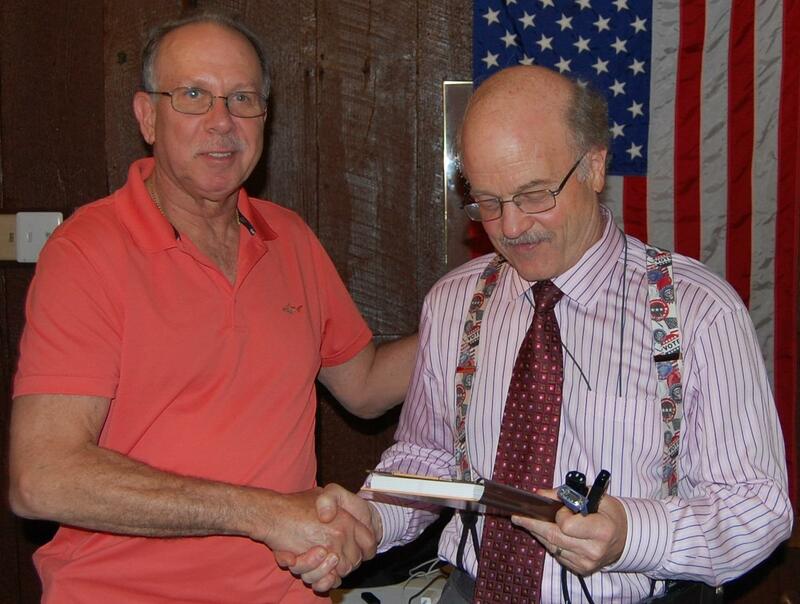 [Above] Bob Fuhrman is congratulated by Bob Nelson for his continuing service as President for the second year. 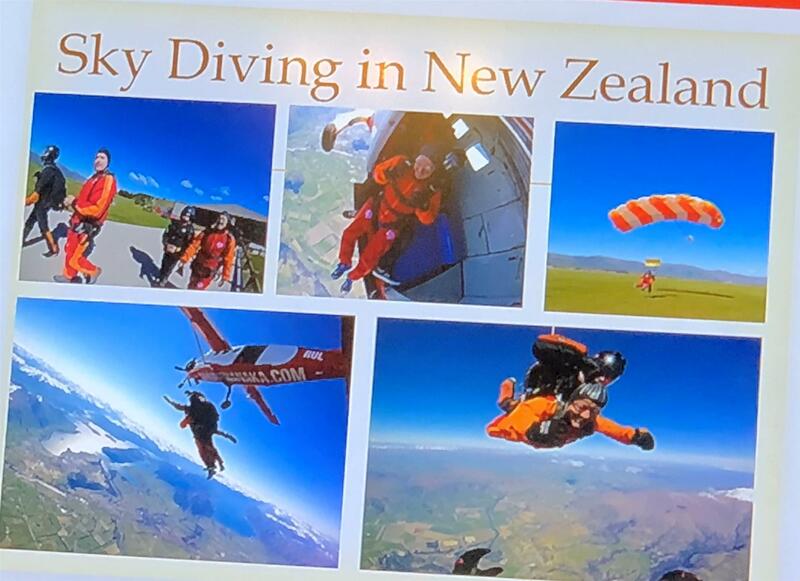 Both President Bob Fuhrman and President-Elect Dr. Todd Nitkin described their work planning international service projects in Nepal and Ethiopia respectively. 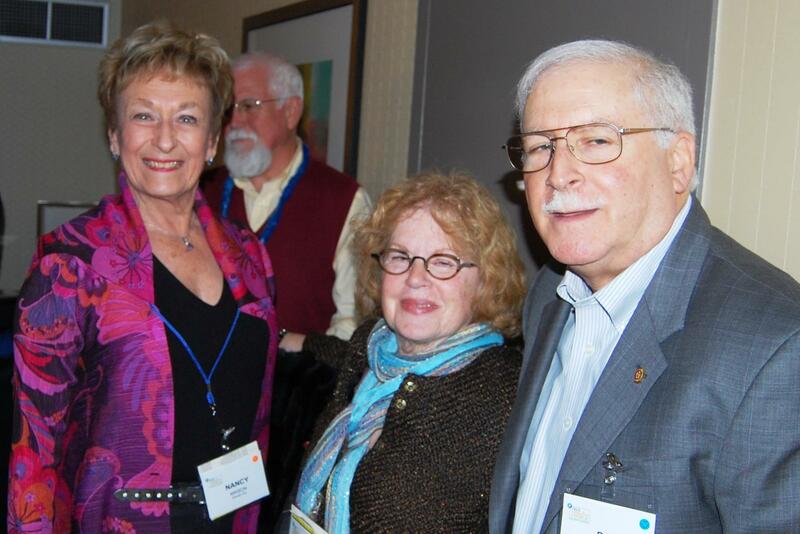 [Below L-R] President Bob Fuhrman, guest BT Arnett, Dr. Noel Howard and Nancy Mason. Our own Neil Cohen discussed his recent work as one of the producers of what may become a new television sitcom. Ed Asner starred in the pilot that was recently filmed here in Maryland. Photo by Dr. Stephen Hellman. 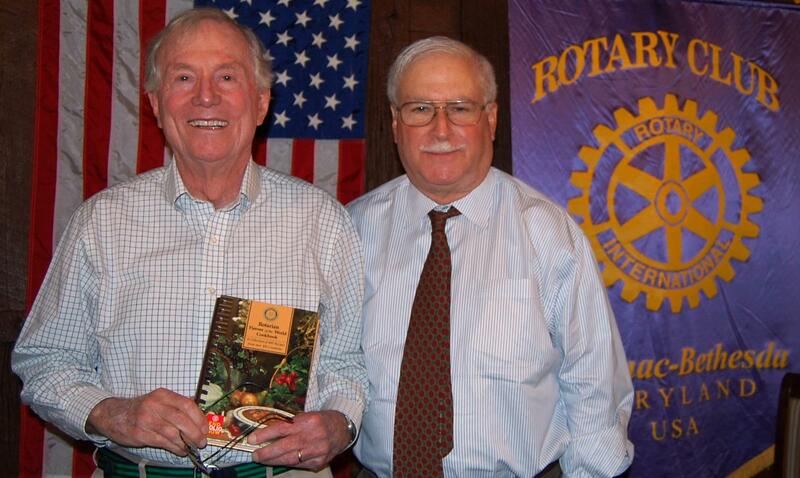 Larry Heilman shared “Lessons Learned in a Career in International Development” at the Potomac-Bethesda Rotary Club Meeting on June 9, 2016. 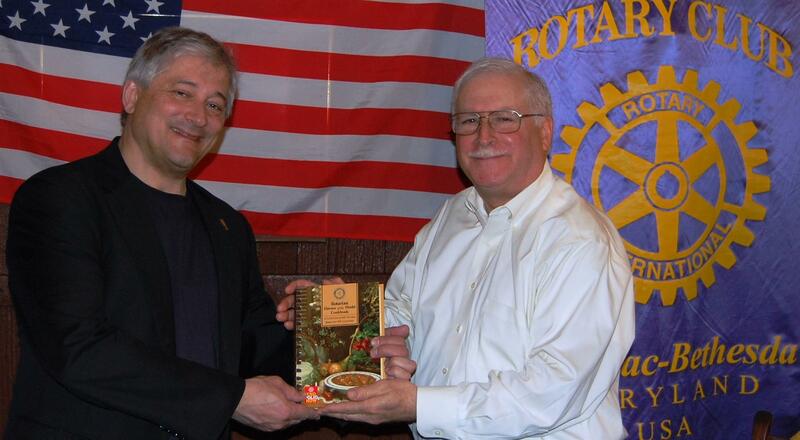 In appreciation President Bob Fuhrman presented him with a Rotary cookbook. 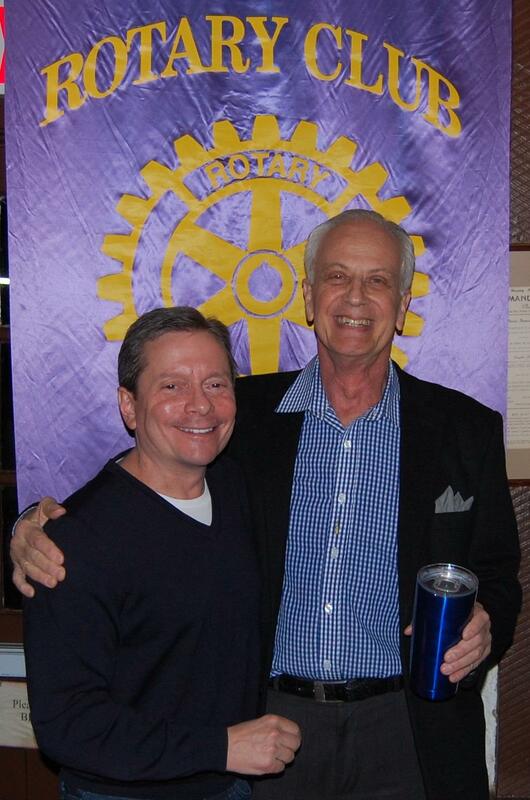 [Above] President Bob Fuhrman thanks Dr. Stephen Hellman for his classification talk including an historical perspective on medical breakthroughs at the Potomac-Bethesda Rotary Club meeting on May 26, 2016. 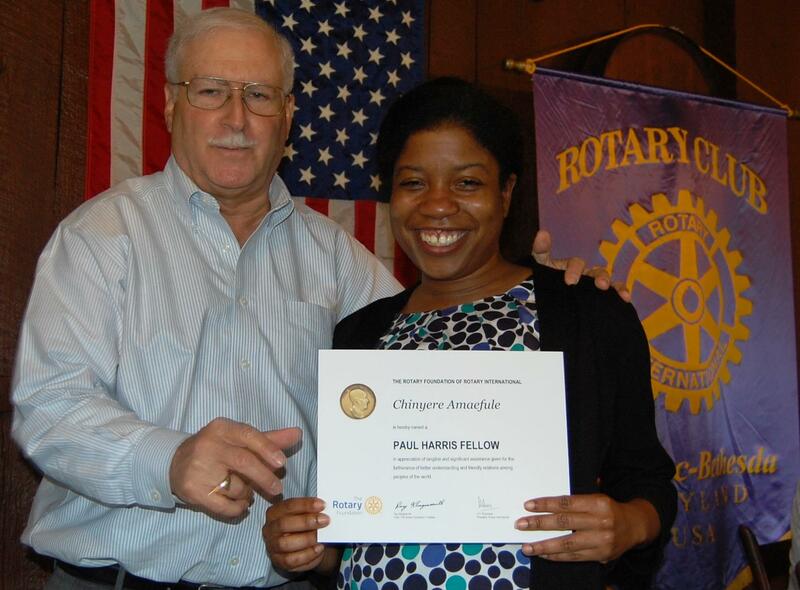 [Below] Congratulations to Chinyere Amaefule who was awarded her first Paul Harris Fellow and Art Blitz received a pin for his third Paul Harris Fellow. Potomac-Bethesda Rotarians with Jewish Foundation Group Home (JFGH) Executive Director Vivian Bass and Leyana Crumpton. 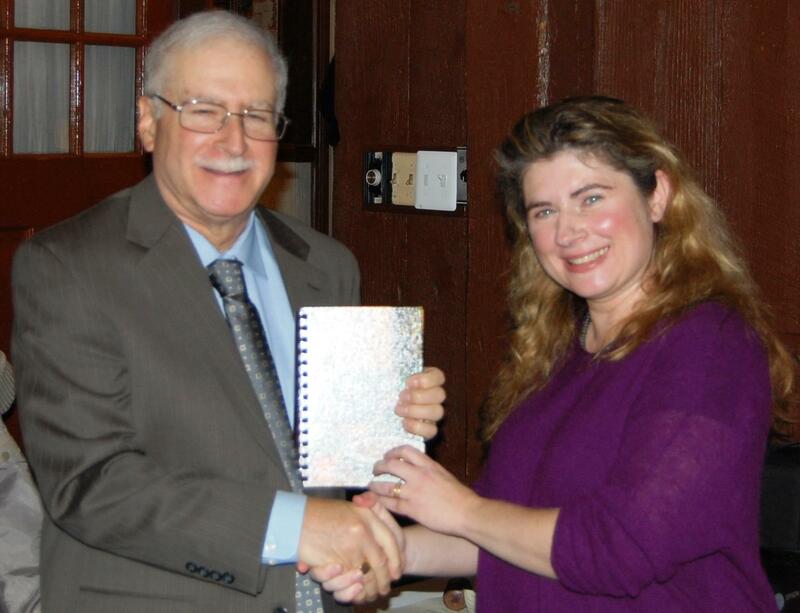 Leyana Crumpton said: "Much gratitude to the Rotarians for your hard work on behalf of JFGH’s Wagner Home. All your work helped transform our home into another beautiful space inside and out. Juan Carlos painters’ were terrific as always!" 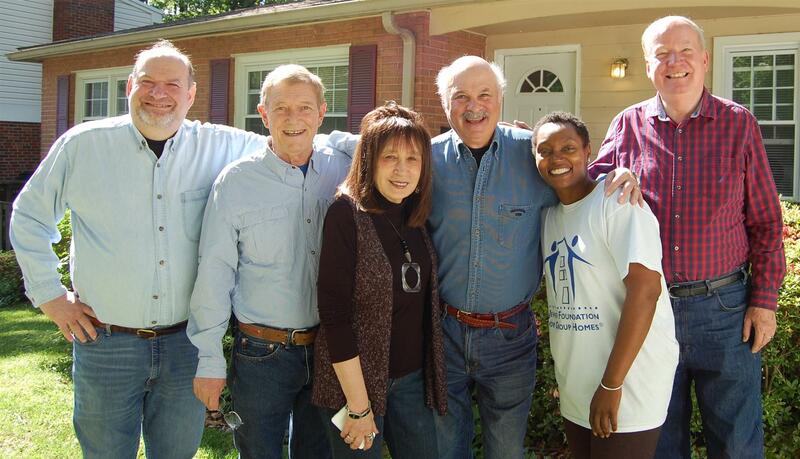 Art Blitz thanked his fellow Rotarians: "Just a short note to say thank you to those who participated in the Jewish Foundations for Group Homes “Fix Up” project last Saturday. And a special “Thank You” to Juan Carlos who supplied a crew of professional painters who painted the interior of the premises and to Tom Leuchtenburg who brought a ton of tools, gloves, mulch, seed, fertilizer and other supplies for the outside work. We had a nice turnout! 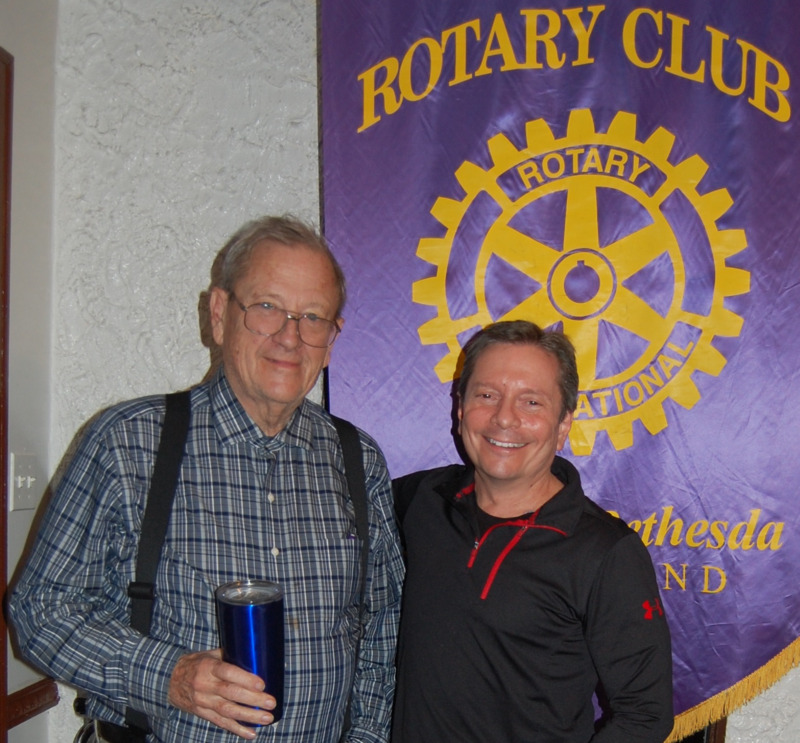 Again, thanks to our hard-working Rotarians who labored long and hard to spruce up the landscape areas." Vivian Bass is retiring after 30 years and a celebration is set for Sunday, June 26, 2016, from 2pm-5pm at the Julia Bindeman Suburban Center, 11810 Falls Road, Potomac. 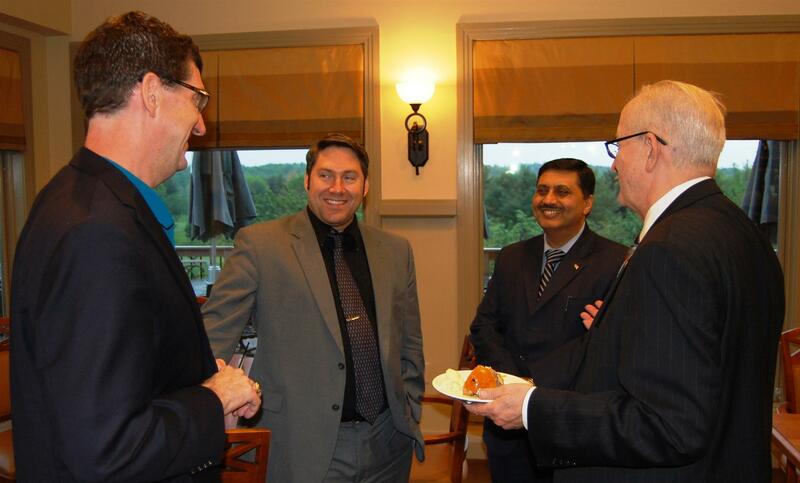 [Above] Tom Lewis and Noel Howard welcome guests Nathan Aguirre and Deepak Soni. 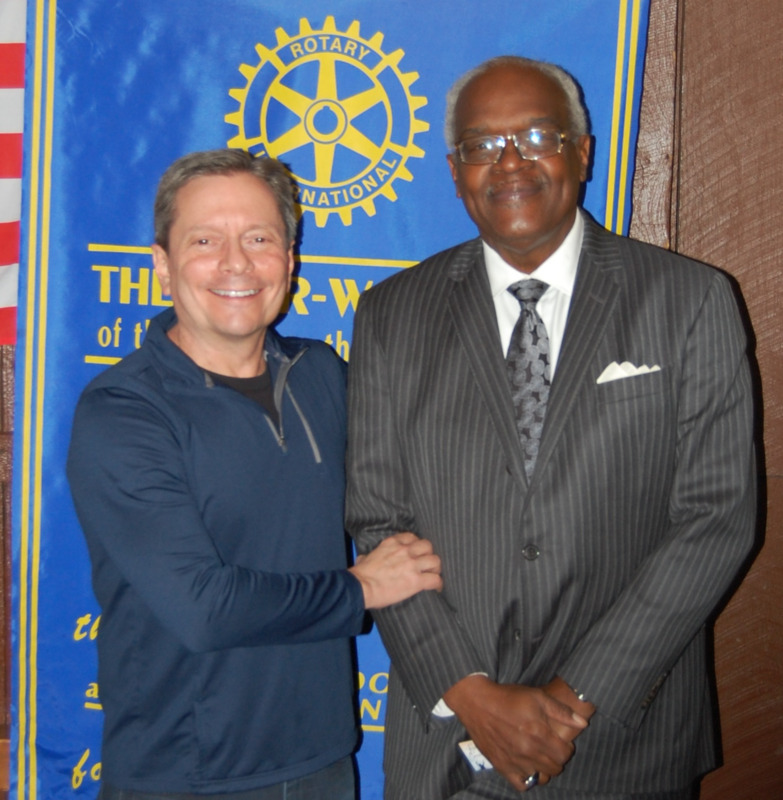 Rotary District Governor Nominee Greg Wims spoke about the Victims Rights Foundation at the Potomac-Bethesda Rotary Club meeting on April 28, 2016. 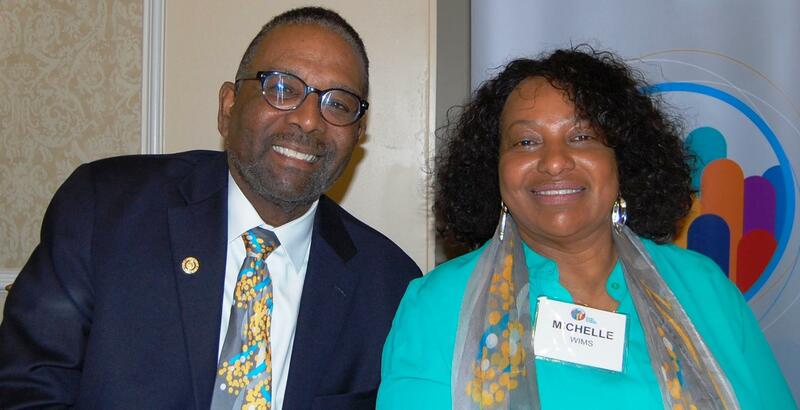 Rotary District Governor Nominee Greg Wims spoke about the Victims Rights Foundation at the Potomac-Bethesda Rotary Club meeting on April 28, 2016. The Victims Rights Foundation performs volunteer support services on behalf of victims of violent crimes and attacks. 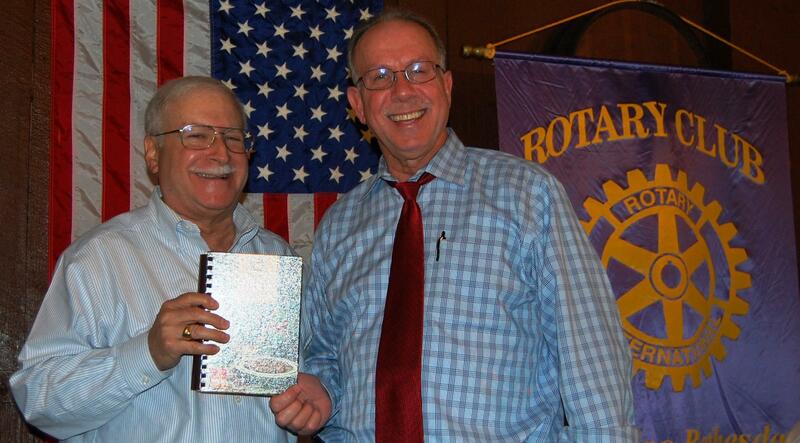 President Bob Fuhrman gave DGN Greg a copy of the Rotary Cookbook. 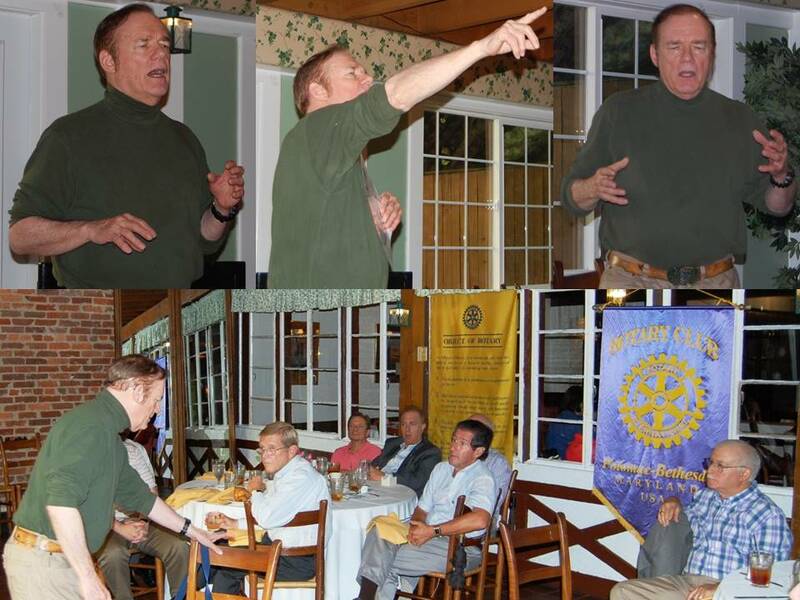 Rockville Rotarian John Kolm gave a presentation on the Haiti school project on April 21, 2016, that was supported by the Potomac-Bethesda Rotary Club. 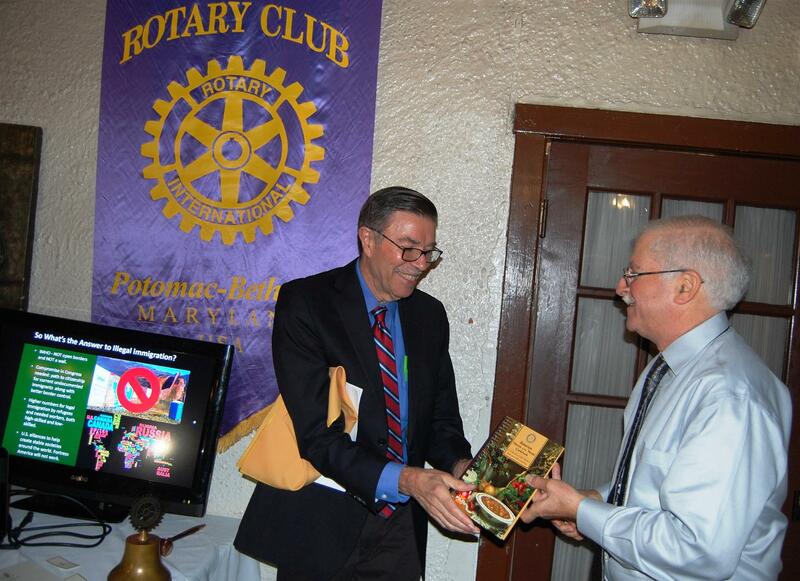 Rockville Rotarian John Kolm gave a presentation on the Haiti school project on April 21, 2016, that was supported by the Potomac-Bethesda Rotary Club. 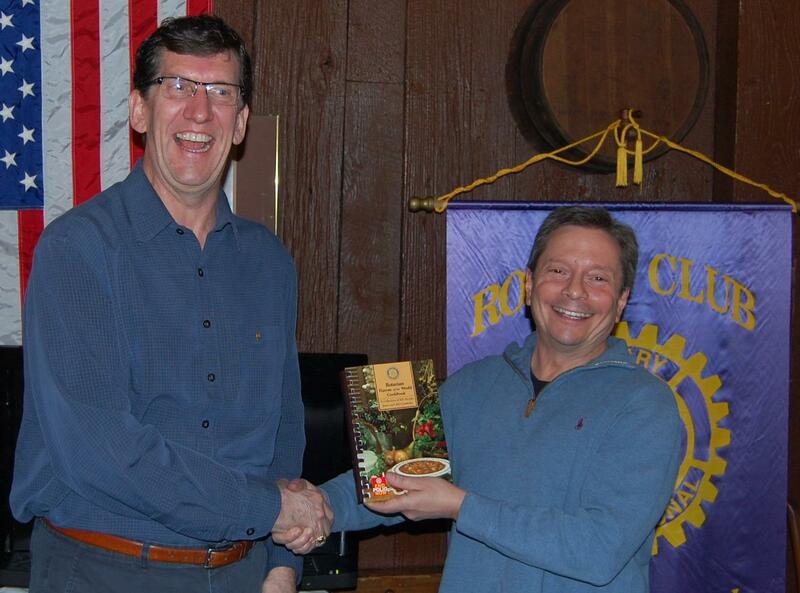 President Bob Fuhrman presented John with the Rotary Cookbook. 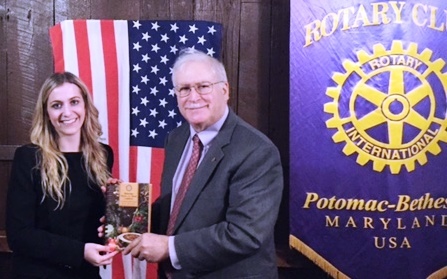 Rotary Scholar Kristina Wienhöfer receives a cookbook from Potomac-Bethesda Rotary Club President Bob Fuhrman on April 14, 2016. 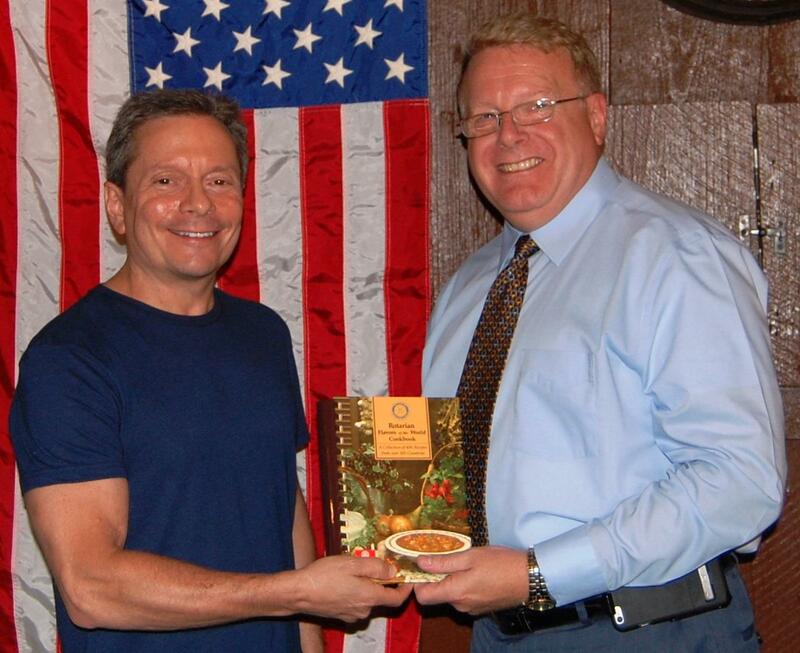 [Above] From the Rotary Club meeting on April 7, 2016: President Bob Fuhrman presenting a Rotary Cookbook to Todd Nitkin, who had just agreed to replace Bob Fuhrman. 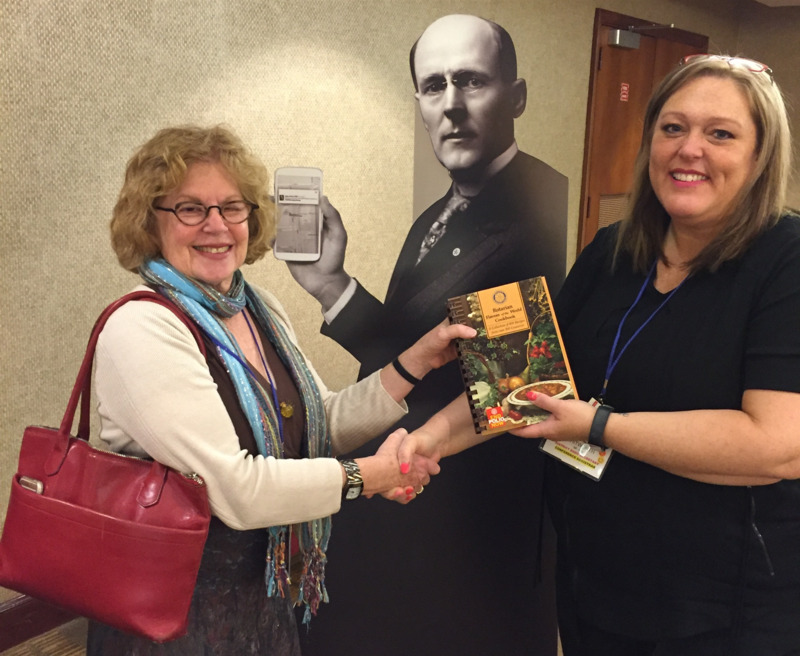 [Below] President Bob also presented a Rotary Cookbook to District Executive Secretary Sherry Whitworth at the District Conference, and Sherry Whitworth presenting a Rotary Cookbook to Nan Fuhrman. 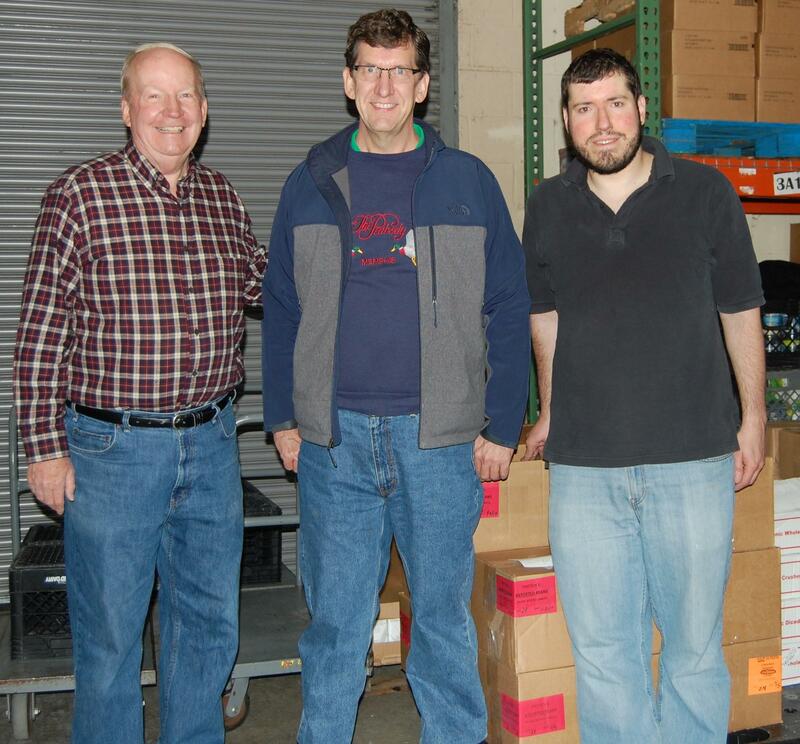 Alex Naron, Tom Lewis and Bob Nelson packed 144 boxes of food for needy families in Montgomery County on April 12, 2016. 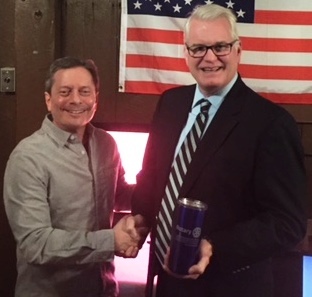 President Bob Fuhrman thanks Mike Nardolilli, the new Executive Director of the Montgomery Parks Foundation, for his presentation including the “Top 10 List of Why Parks Matter" on March 31, 2016. 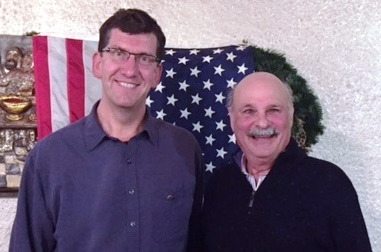 [Above] President Bob Fuhrman thanks Mike Nardolilli, the new Executive Director of the Montgomery Parks Foundation, for his presentation including the “Top 10 List of Why Parks Matter" on March 31, 2016. 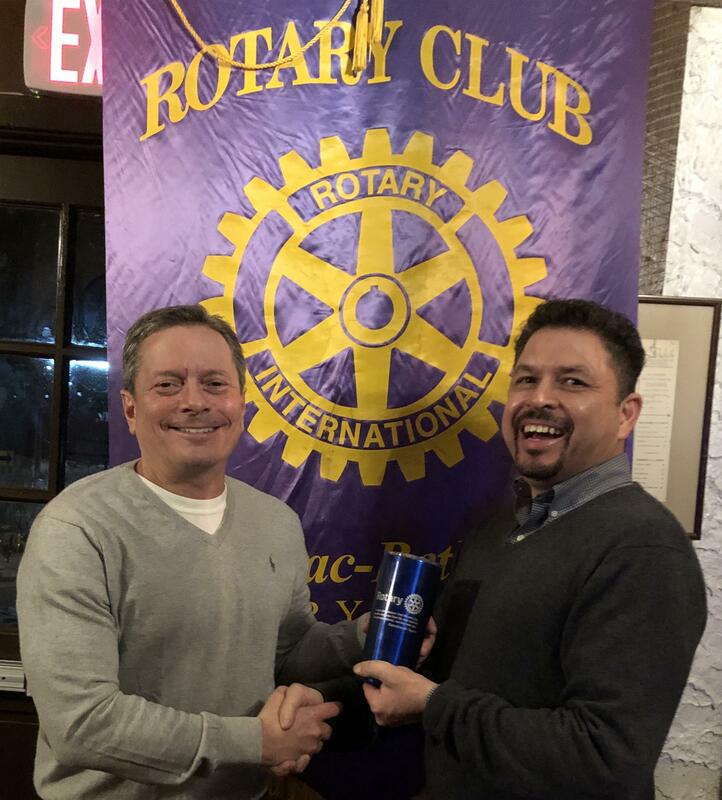 [Below] Past Potomac-Bethesda Rotary Club President Dr. Juvenal Goicochea and his brother Carlos, also a Past Rotary Club President from Peru. 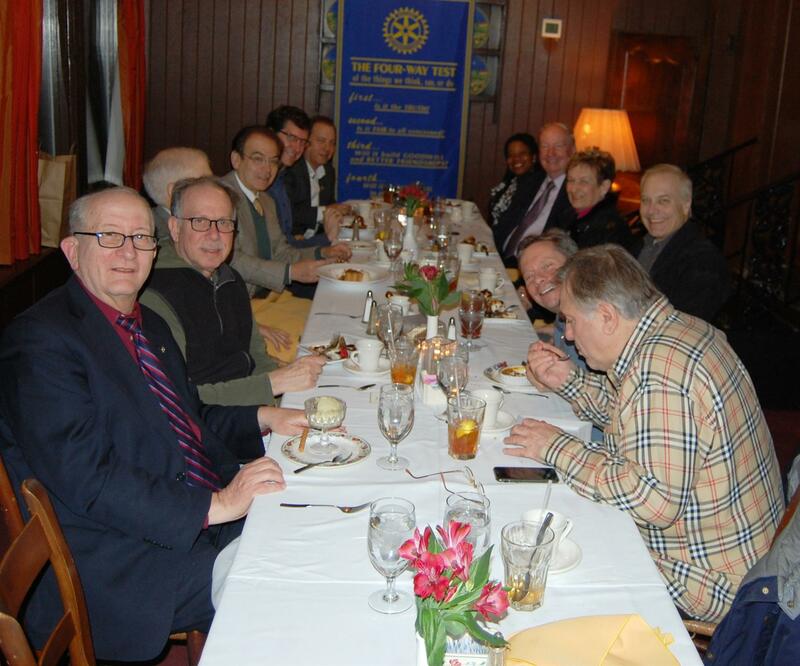 Potomac-Bethesda Rotarians joined the March 24, 2016, meeting of the metroBethesda Rotary Club. 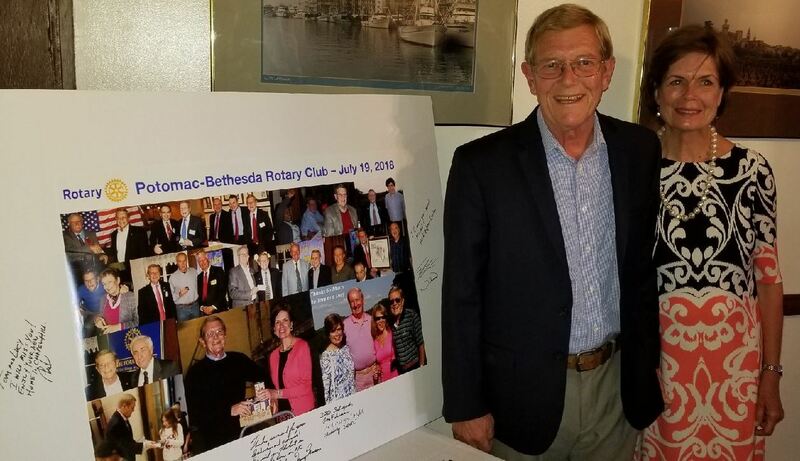 metroBethesda President Russell Lacey presented a giant check in the amount of $1000 to Potomac-Bethesda President Bob Fuhrman for the Ear Care Nepal project. 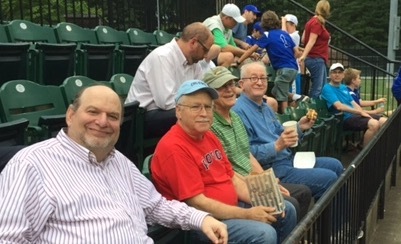 [L-R] Karl Miller, Tom Leuchtenburg, Potomac-Bethesda President Bob Fuhrman, metroBethesda President Russell Lacey and Bob Nelson. Michael Zhuang was the guest speaker on March 17, 2016, with the presentation "Investment Insight of Nobel Prize Winners." Michael Zhuang was the guest speaker on March 17, 2016, with the presentation "Investment Insight of Nobel Prize Winners." The 2013 Nobel Prize Winners in Economics were Eugene Fama, Robert Shiller and Lars Peter Hansen. 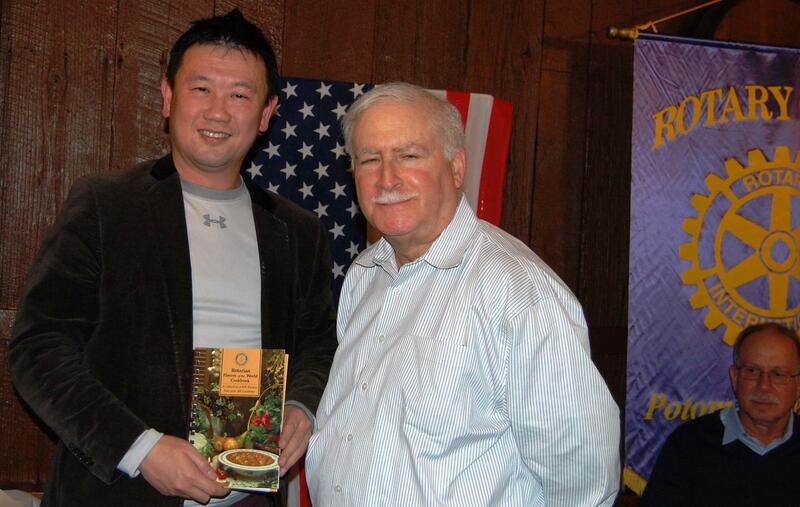 President Bob Fuhrman presented Michael Zhuang with a Rotary Cookbook. 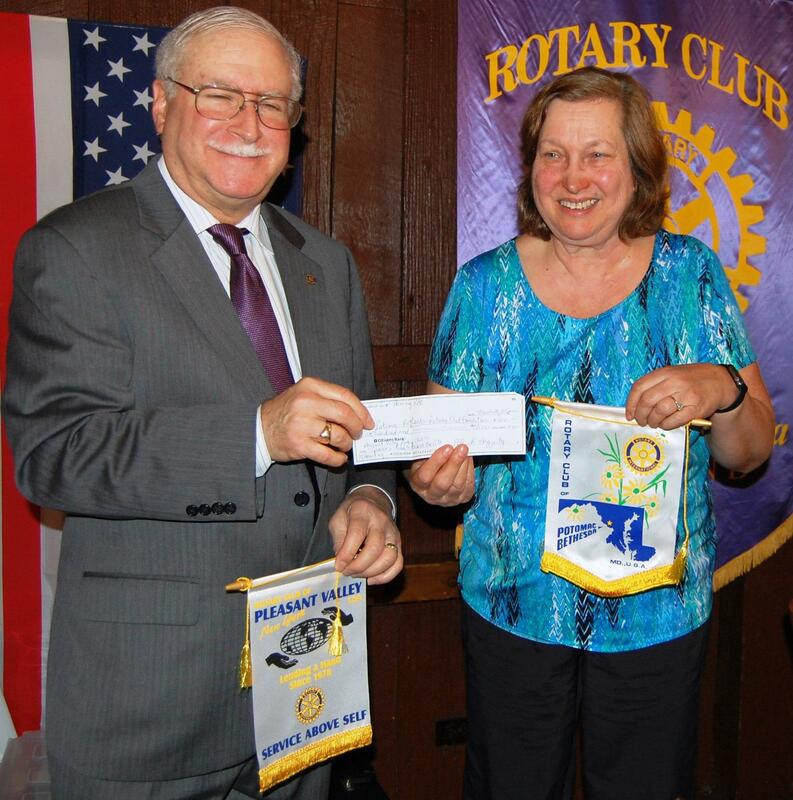 Ellen Haggerty, Chair of the Rotarians for Hearing Action Group and a member of the Pleasant Valley New York Rotary Club exchanges club banners and presents President Bob Fuhrman with a check for $500 for the Ear Care Nepal Project on March 10, 2016. 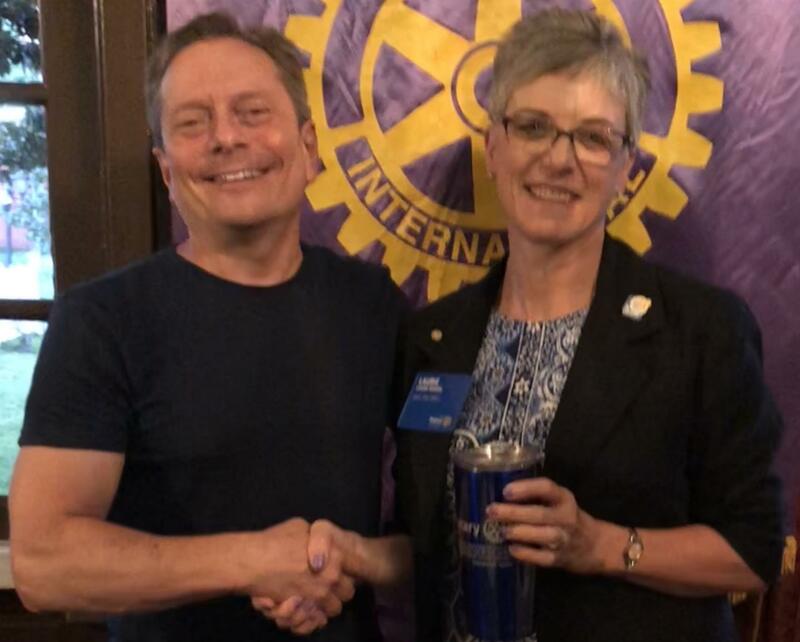 Ellen Haggerty, Chair of the Rotarians for Hearing Action Group and a member of the Pleasant Valley New York Rotary Club exchanges club banners and presents President Bob Fuhrman with a check for $500 for the Ear Care Nepal Project. 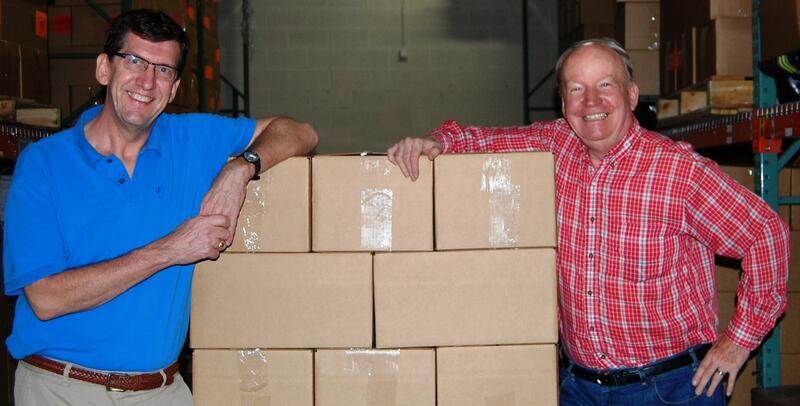 [Above] Tom Lewis and Bob Nelson at the Manna Food Center Packing Night on March 8, 2016. 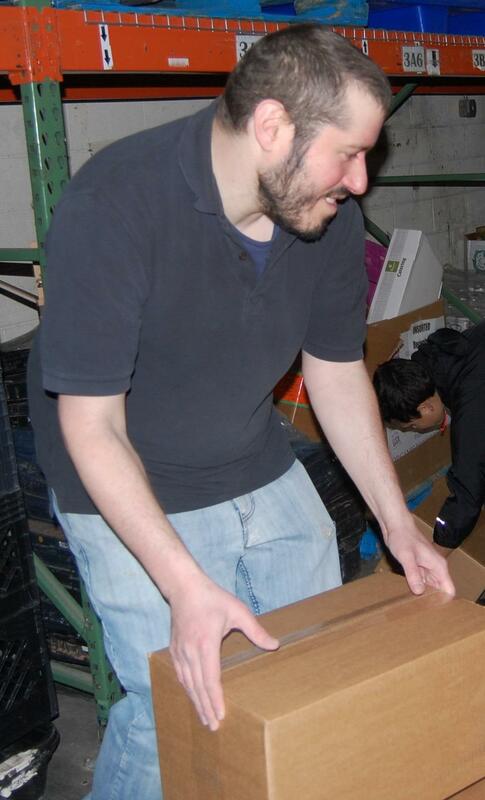 [Below] Alex Naron leads the Manna Food Center Packing crew. 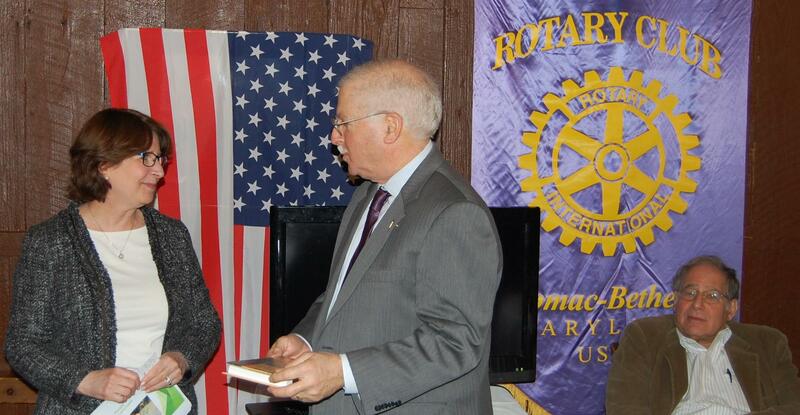 Debby Fisher, Interim Chief Operating Officer of CHI Centers, Inc., was the guest speaker at the March 3, 2016, Potomac-Bethesda Rotary Club meeting. 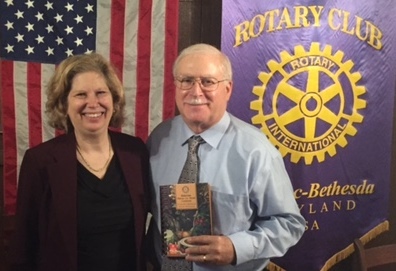 Debby Fisher, Interim Chief Operating Officer of CHI Centers, Inc., was the guest speaker at the March 3, 2016, Potomac-Bethesda Rotary Club meeting. CHI Centers, Inc. provides residential services in alternative living units, rent subsidized housing, vocational training, and working with adults with disabilities. 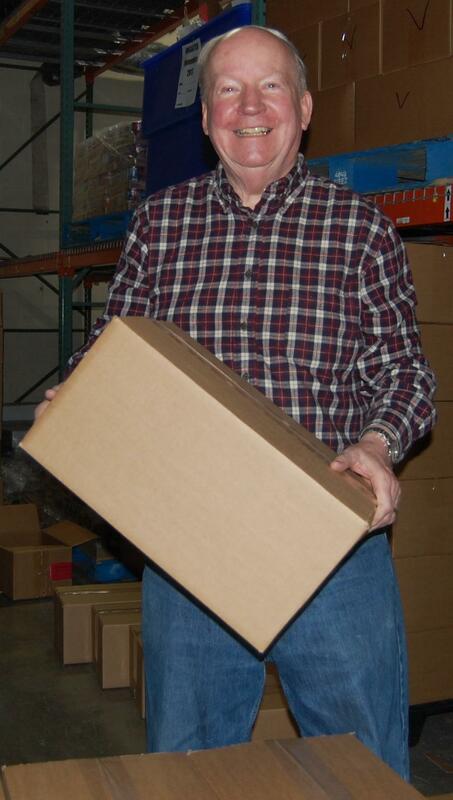 In February, the Potomac-Bethesda Rotary Club Foundation donated $4,000 to CHI Centers, Inc. 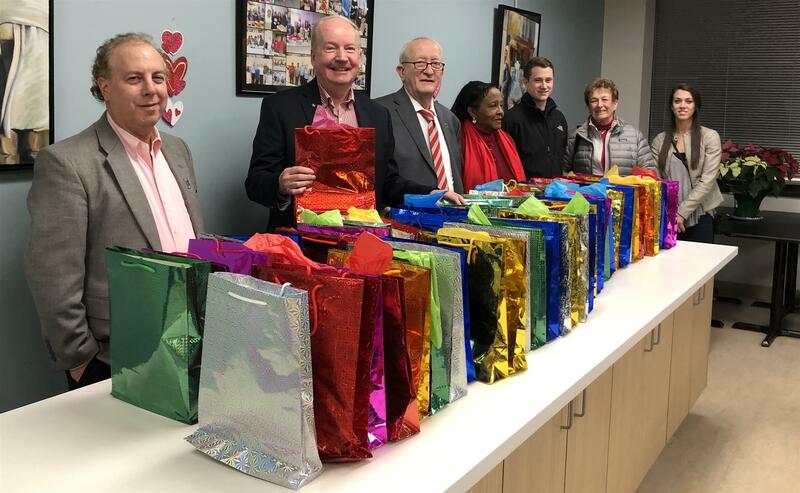 In honor of Valentine's Day, Potomac-Bethesda Rotary presented pashmina shawls to residents at Sophia's House in Rockville, Maryland. 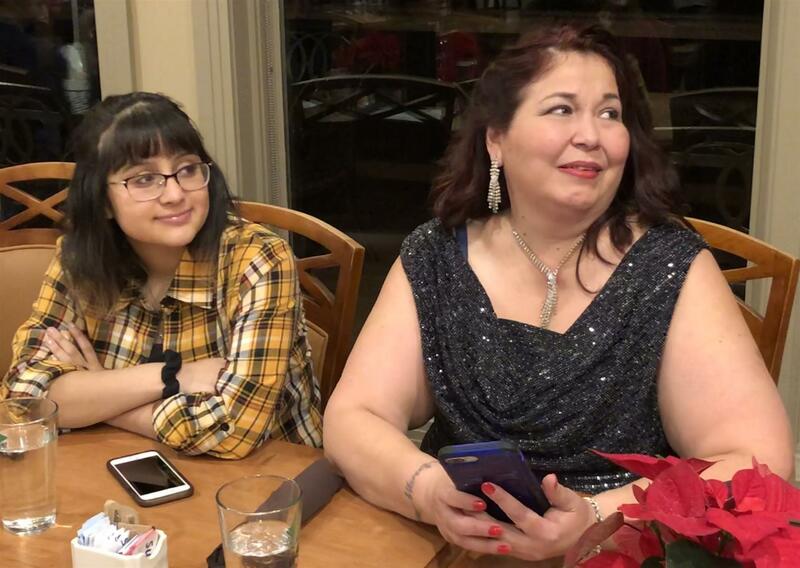 Sophia's House provides emergency shelter for women with mental illness, substance abuse, trauma or long term disabilities. 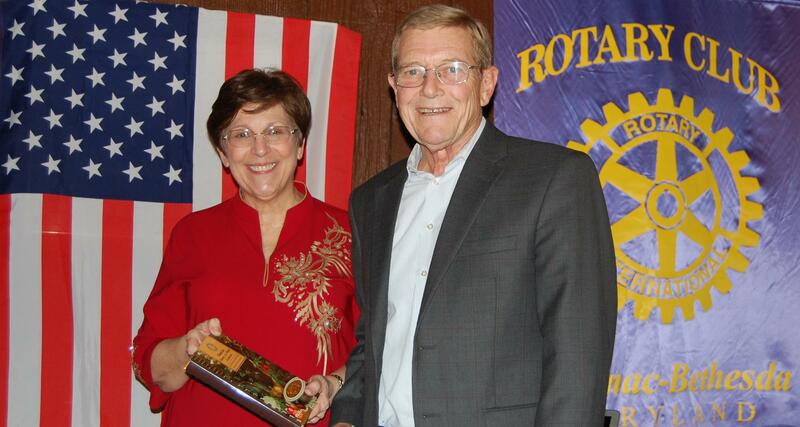 This annual presentation of gifts is led by Rotarian Dr. Noel Howard and his wife, Gladys Howard. 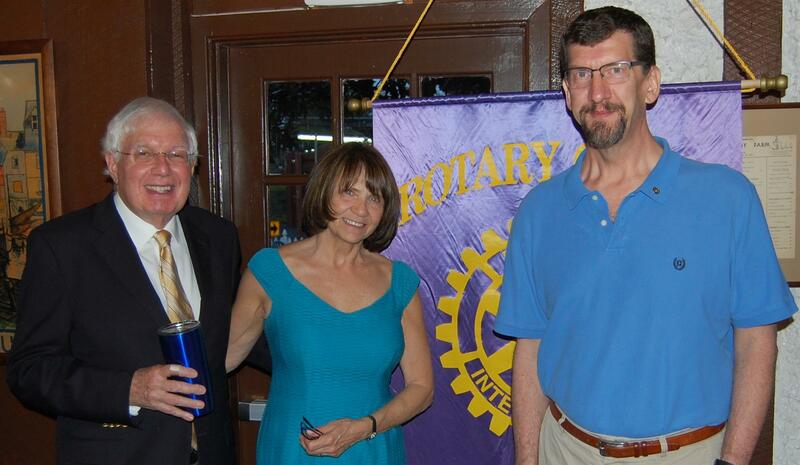 Potomac-Bethesda Rotary Foundation supports various projects in the local community related to housing and education. 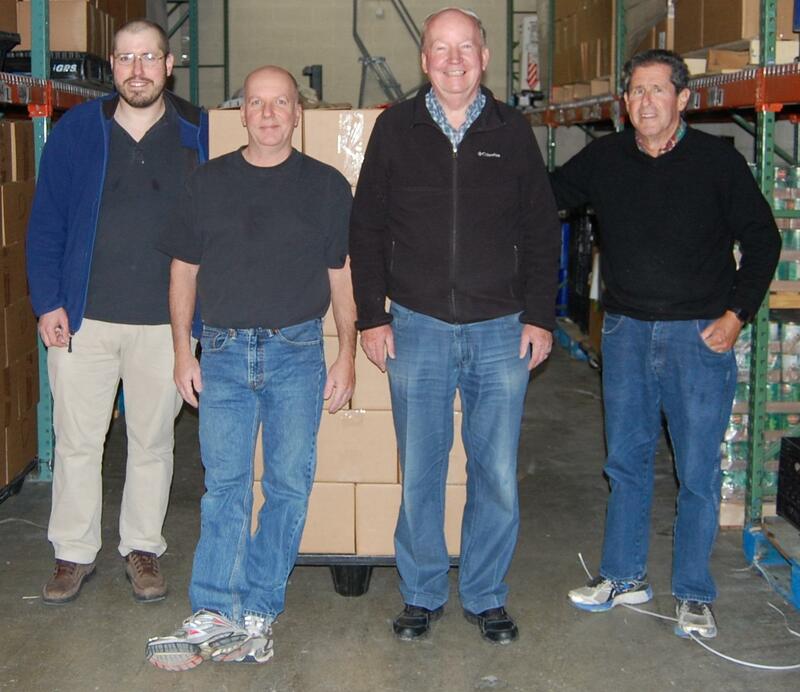 Dr. Drew Baden, University of Maryland- College Park Physics Department Chair and Professor "The CERN Particle Accelerator and Understanding the Structure and Physical Laws of This Universe"
[L-R] Will Naron, Manna Coordinator Alex Naron, Bob Nelson and volunteers pack boxes of food for needy families on January 12, 2016. 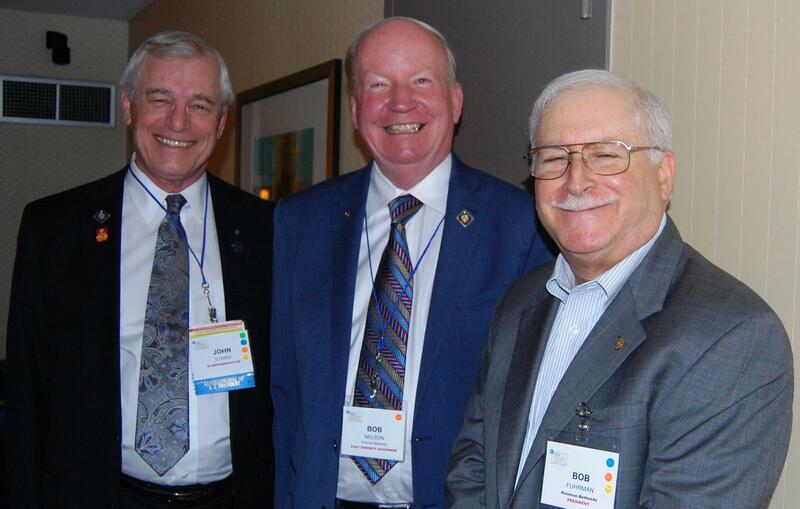 Congratulations to the new officers elected for 2016-17: President Elect Bob Fuhrman, Secretary Elect Noel Howard, Treasurer Elect Tom Lewis and Membership Chair Caesar Kavadoy. 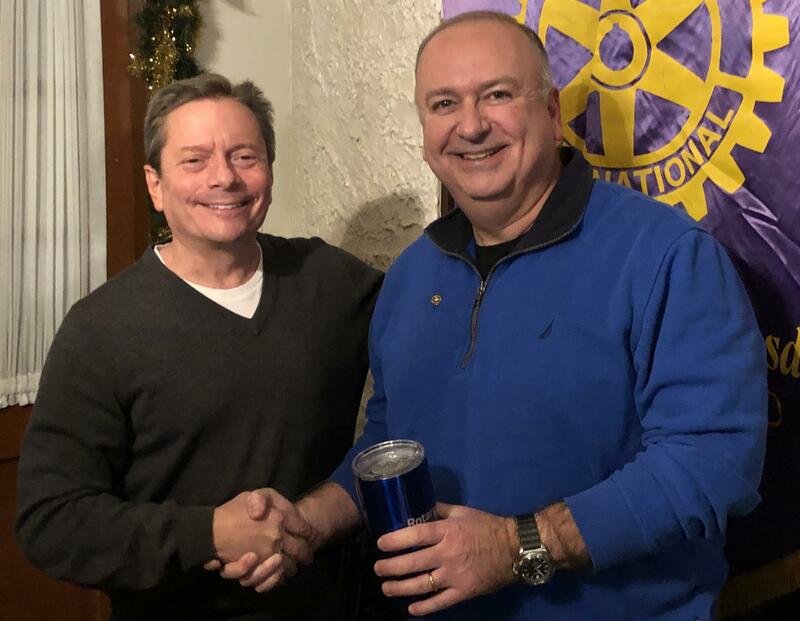 Congratulations to Arthur Blitz who received the Outstanding Service Above Self Award for 2014-2015 on December 17, 2015, from Immediate Past President Caesar Kavadoy. 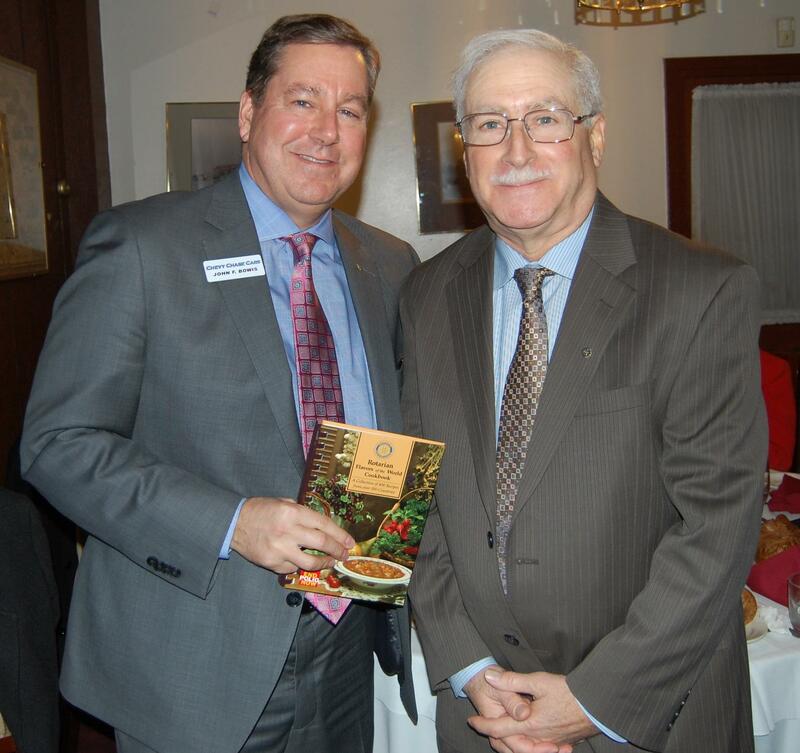 Delegate Jim Gilchrist discussed the state legislative process and issues that will be coming up in the next legislative session at the Rotary Club meeting on December 3, 2015. 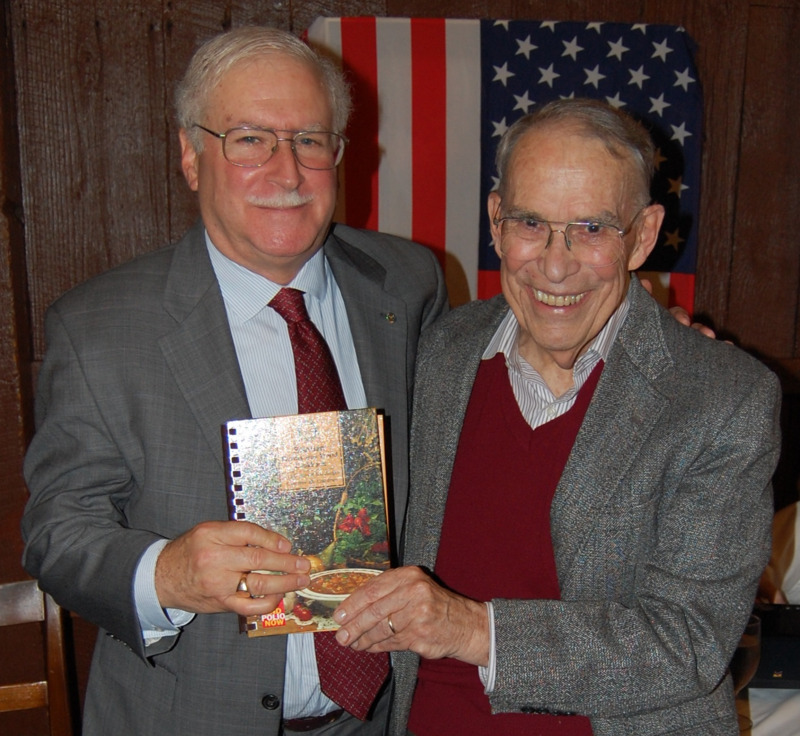 Delegate Jim Gilchrist receives a Rotary Cookbook from President Bob Fuhrman to thank him for his presentation about the state legislative process and issues that will be coming up in the next legislative session on December 3, 2015. 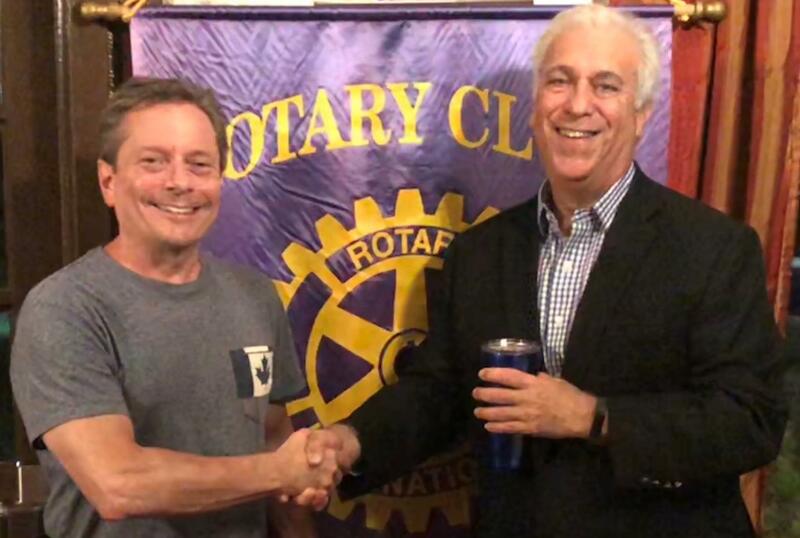 Jim is also the current President of the Rockville Rotary Club and accompanying him were Rotarians Heather Sunderman and Theresa Garcia-Parks. 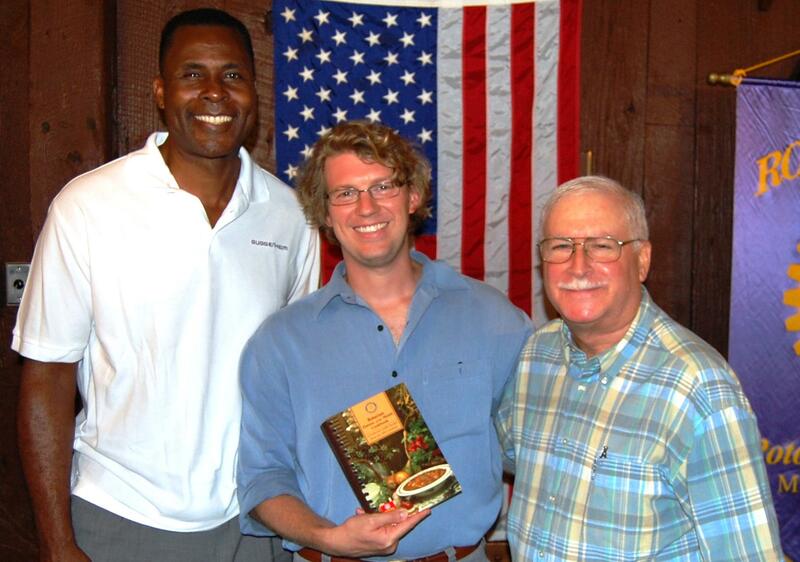 Alan Grant, Tom Lewis and Bob Nelson distribute Dictionaries to Third Graders at Bells Mill Elementary School on November 24, 2015. 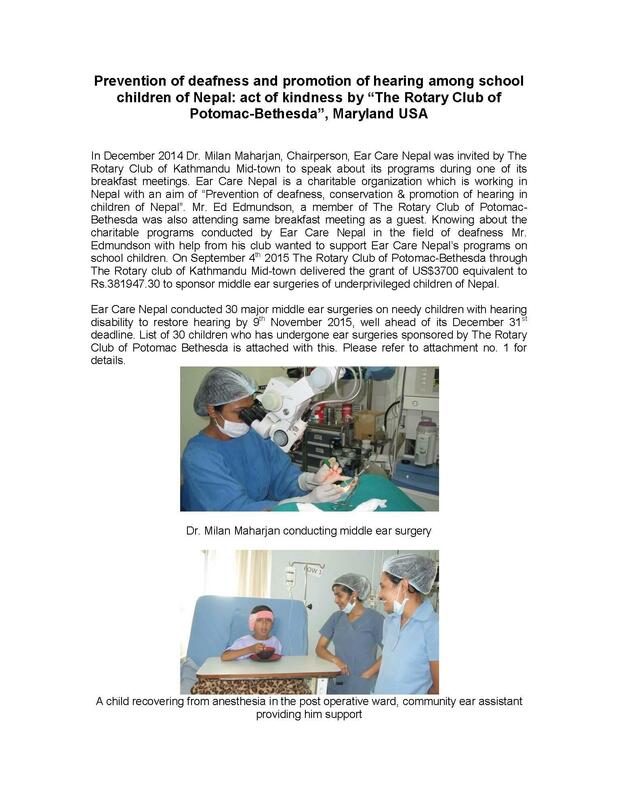 "Thank you Rotary Club of Potomac-Bethesda, Maryland, USA for their generous contributions. 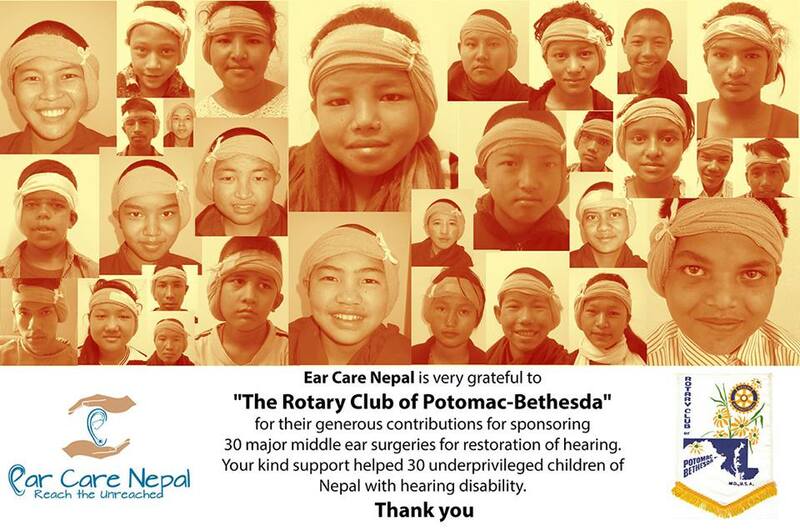 Also Ear Care Nepal is very grateful to 'The Rotary Club of Kathmandu Mid-town' for their kind support. Thank you all !!!" 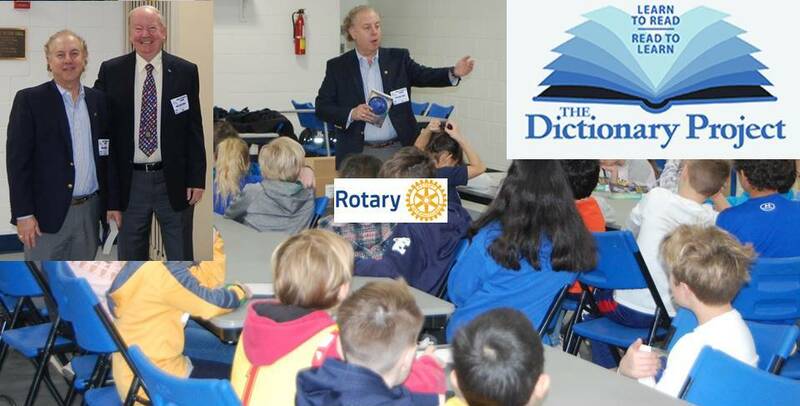 Alan Grant and Bob Nelson introduce excited third graders to their new Dictionaries/Almanacs and share about Rotary. 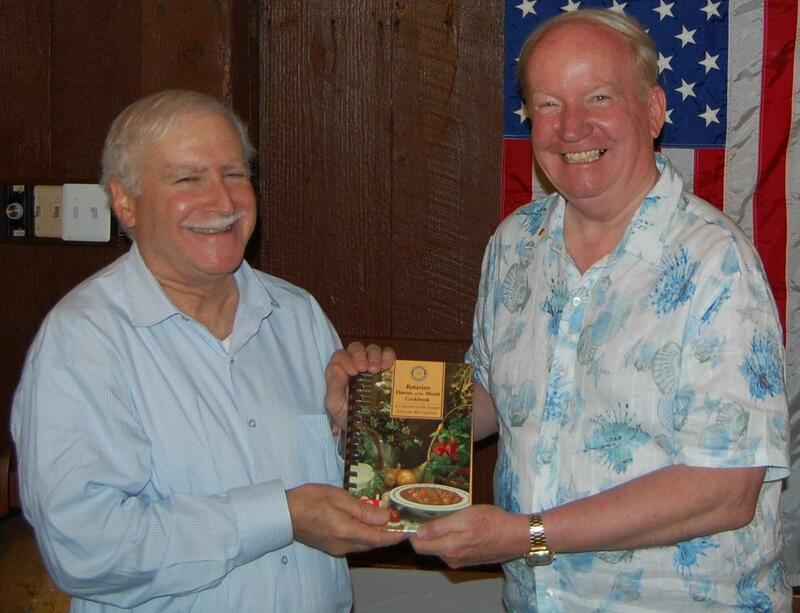 President Bob Fuhrman presents the Rotary Cookbook to Rotary District Membership Chair Rich Glover for leading the club discussion on membership growth. 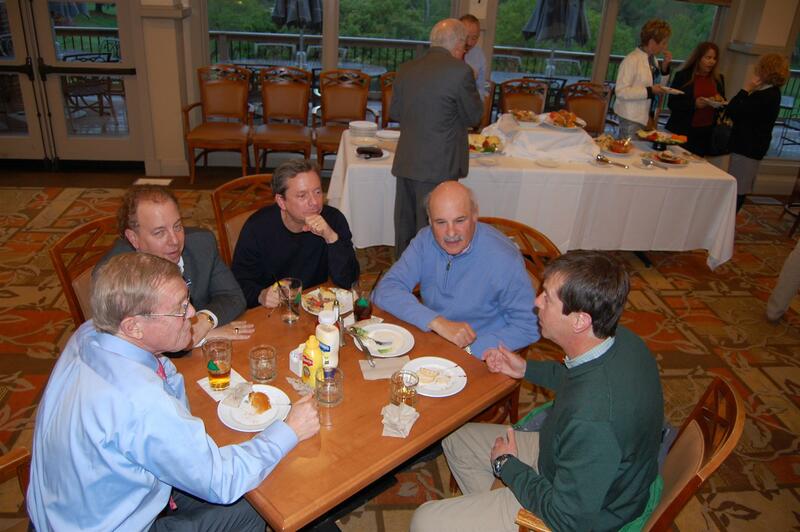 President Bob Fuhrman thanks guest speaker Dr. Dean Pruitt for his talk on International Negotiations. 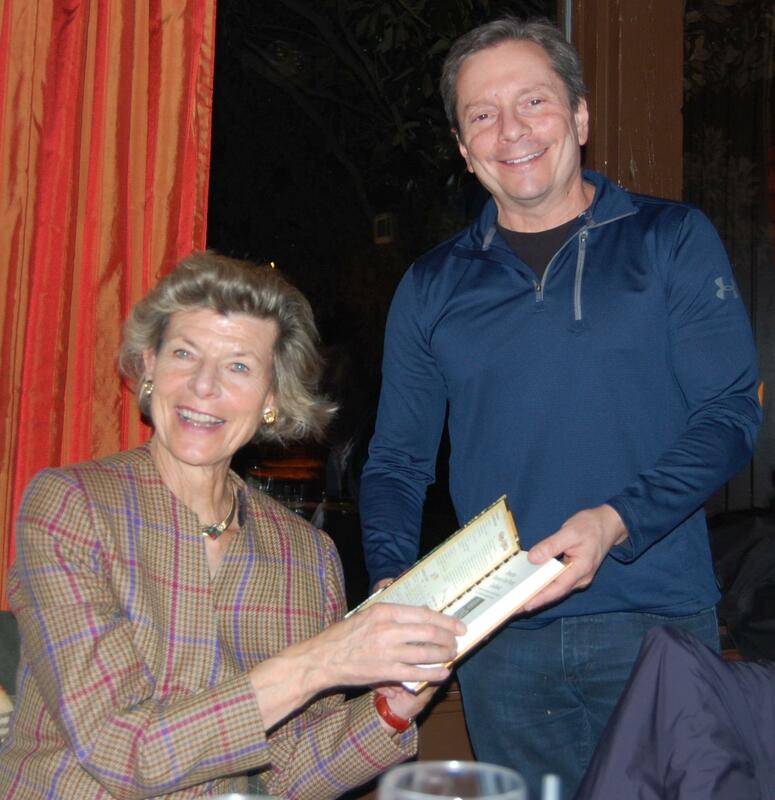 Accompanying Dean was his wife France (Bethesda-Chevy Chase Rotarian) and son Paul. 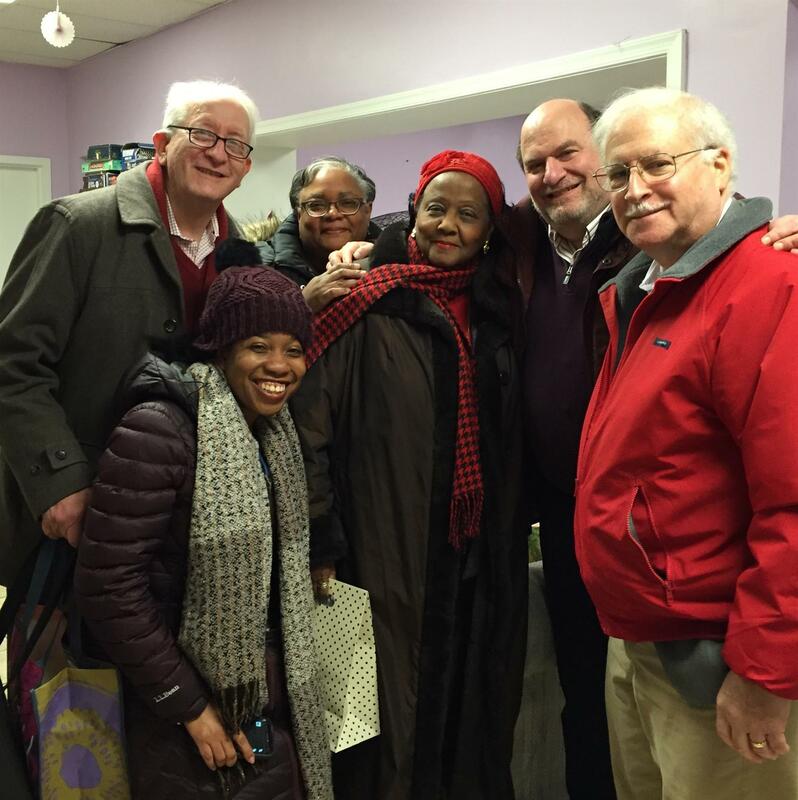 Guests included Benjamin Viray, Ed Feroli and Francine Schwartz. 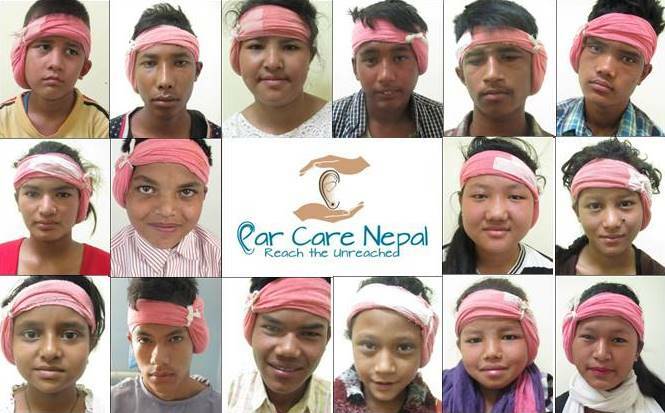 The above children have all undergone middle ear surgery for restoration of hearing in the past two weeks through Ear Care Nepal at Nidan Hospital, Pulchowk, Lalitpur, Nepal. 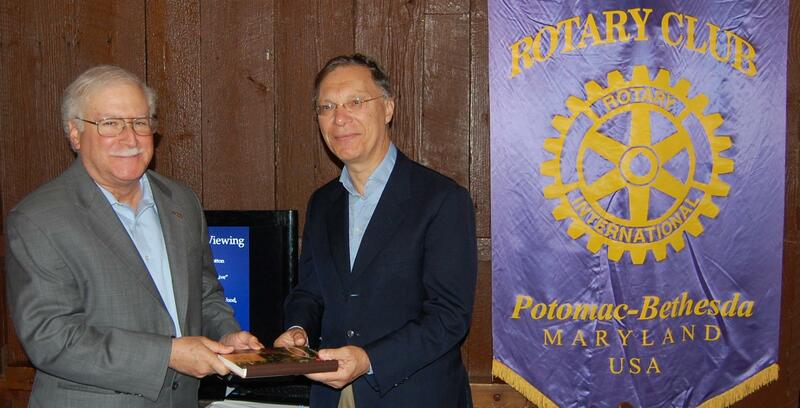 Funding for 30 children was provided by the Potomac-Bethesda Rotary Club in the amount of $3700. 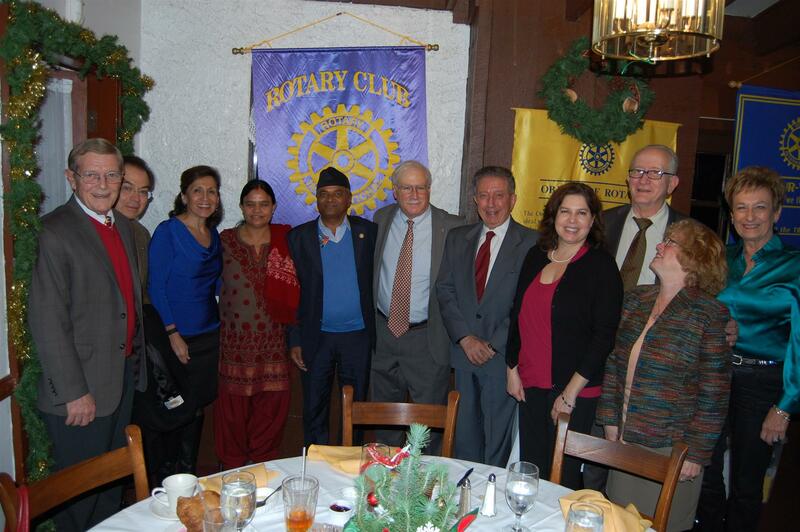 This project is being done in cooperation with the Rotary Club of Katmandu-Midtown. Rev. 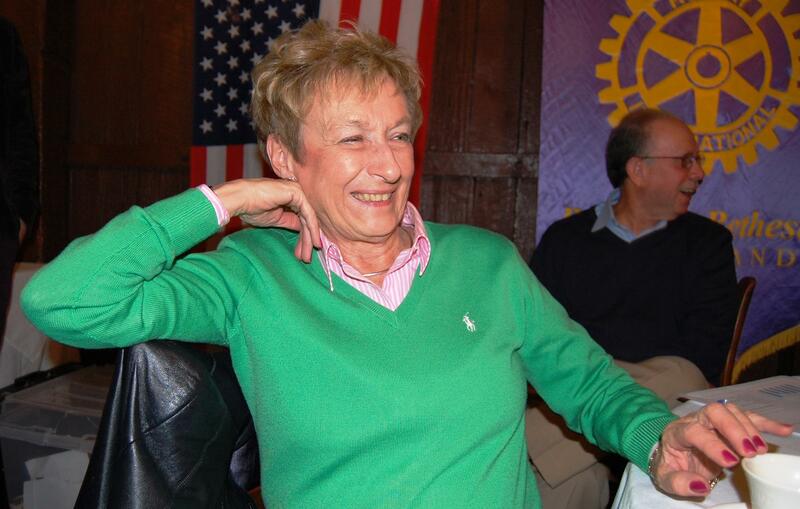 Anne Benefield from the Potomac Rotary Club described her experiences at a National Immunization Day in India. 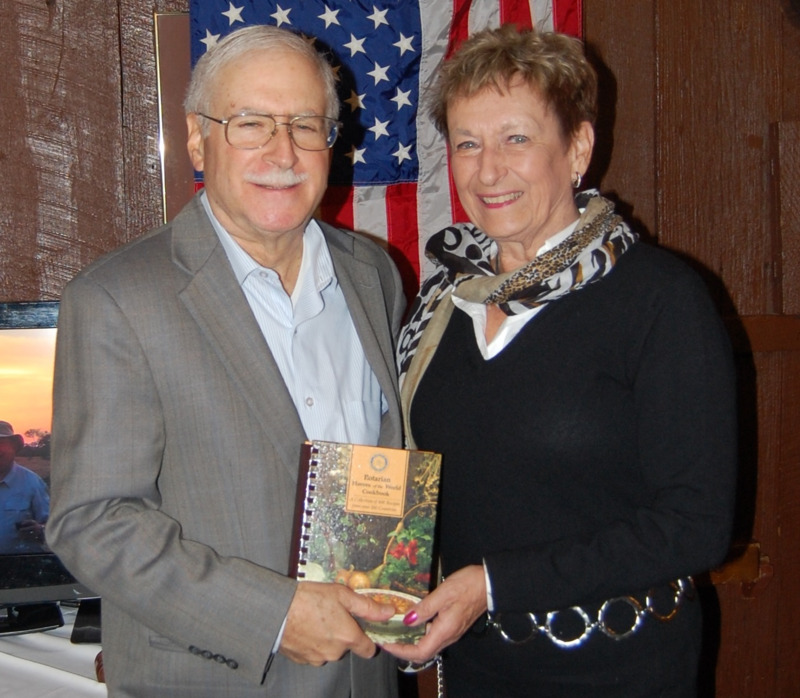 Past President Tom Leuchtenburg presented a Rotary Cookbook to Anne for her excellent presentation. 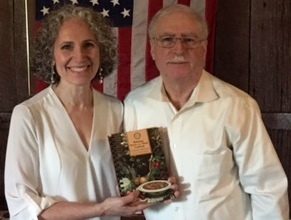 President Bob Fuhrman invited local author Sara Taber Thomas to speak about her book "Born Under an Assumed Name", which is a memoir of her early years. Her dad was a covert CIA agent who tried to run spies into Red China 50 years ago. She periodically lived in Taiwan, Japan, Holland, Bali, and elsewhere "undercover," as it were. Photos by Tom Lewis. 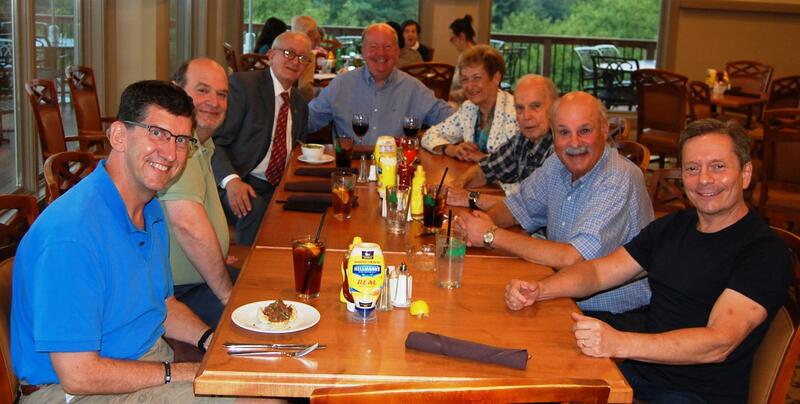 Todd Nitkin celebrated his birthday at the Rotary Social and Dinner at Bluestone Sanctuary. LOUIS E. FETTIG, 98, Obstetrician-Gynecologist and USAF Captain, affectionately known as "Opa", of Charlotte, NC, formerly of Potomac, MD, died Sunday, August 30, 2015 after a brief illness. 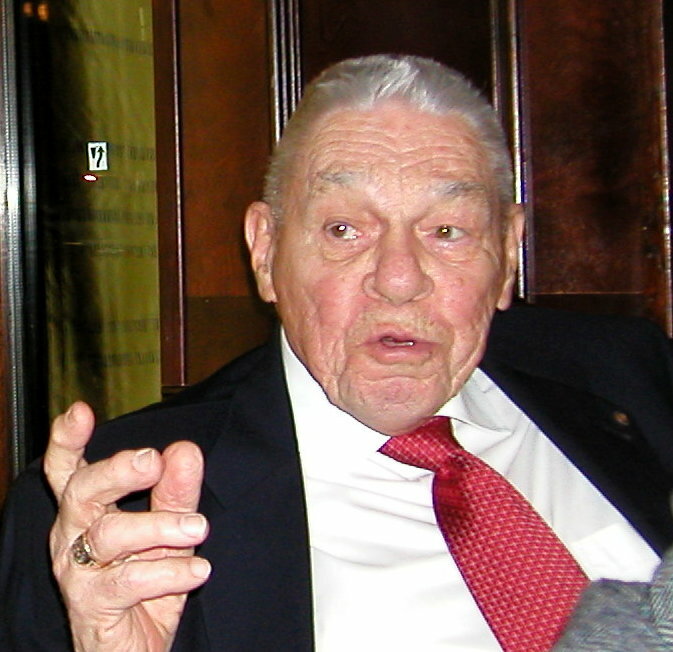 Born June 21, 1917 in Phila., PA, he was a son of the late Mr. Louis and Bertha Weiser Fettig. He was a graduate of Penn State University with a major in Chemistry in 1943. Afterwards he graduated in medicine from Hahnemann Medical College in 1947 and University of Pennsylvania Post Graduate School of Medicine in 1952. 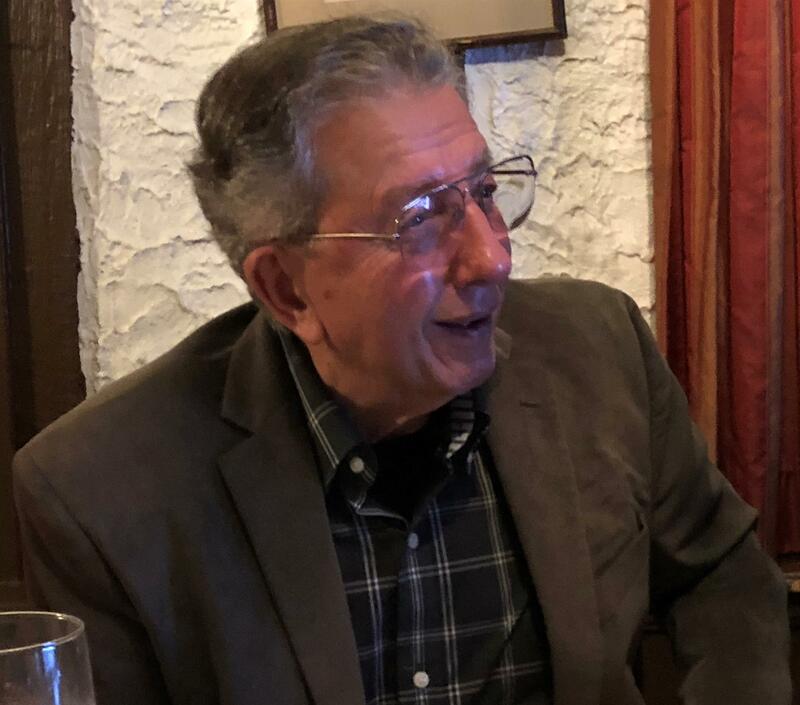 He was the OB coordinator for the National Institute of Health Cerebral Palsy project at Pennsylvania Hospital from 1959-1964 and director of the OB/GYN outpatient department. 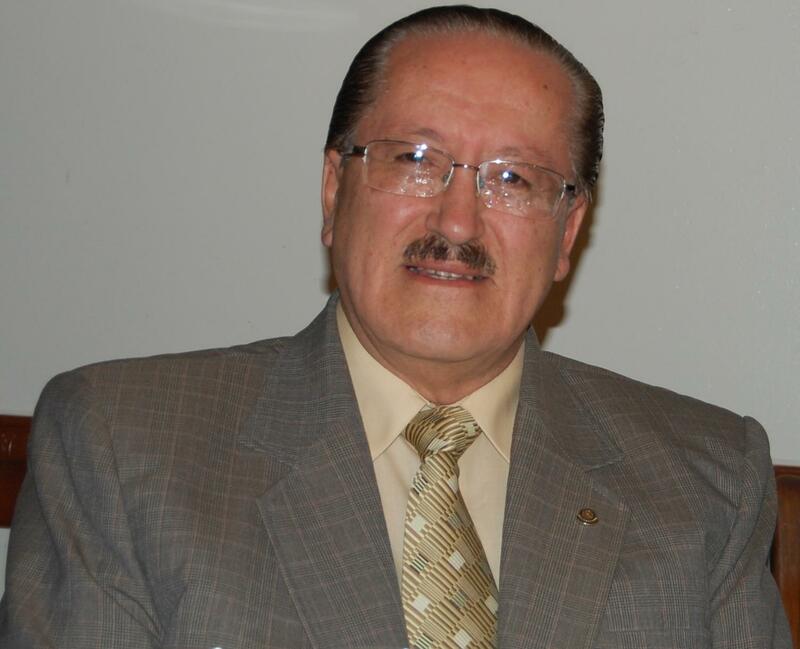 In addition, he served on the staffs at George Washington University Medical Center, Washington Hospital Center, Holy Cross Hospital, Doctor's Hospital, Shady Grove Hospital and Washington Adventist in Obstetrics and Gynecology for over 25 years. At George Washington University, Dr. Fettig served as an Associate Clinical Professor in OBGYN in addition to working in private practice. He was drafted as a lieutenant in World War II and served in the Army Medical Corps and later obligated to service as a Captain in the USAF during the Korean War. At that time he was Chief of the OBGYN Department for the Strategic Air Command (SAC) at Ramey Air force Base, Puerto Rico. Dr. Fettig was a 32 degree Mason of the Frankford Lodge No. 292 Free and Accepted Masons of Pennsylvania, a member of the Scottish Rite of Allentown, PA, the National Sojourners, the AMA, the Potomac-Bethesda Rotary Club, the Penn State Alumni Association and Alpha Chi Sigma- Nu Chapter. 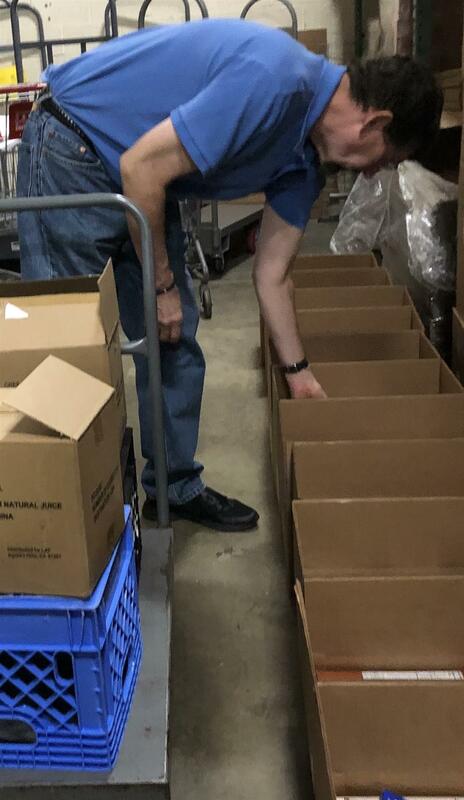 Each month Alex Naron faithfully leads a group of volunteers packing boxes for families needing food in Montgomery County. Join him on the second Tuesday of every month at 7pm at Manna Food Center, 9311 Gaither Rd, Gaithersburg, MD 20877. 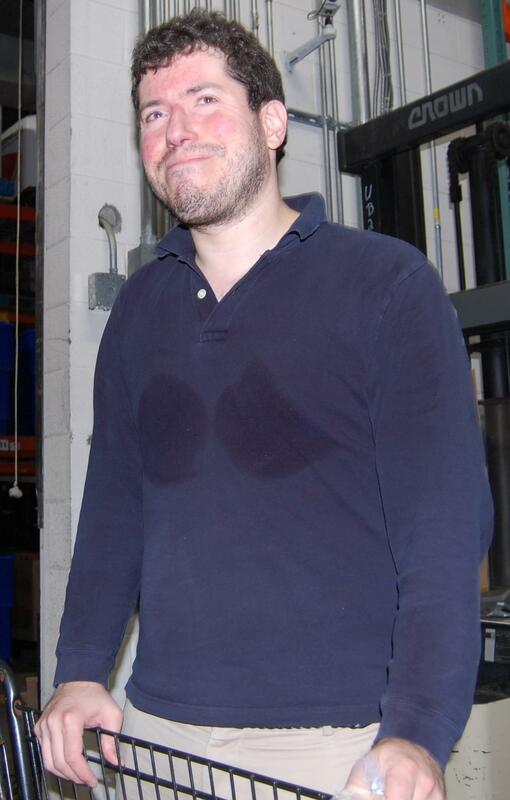 It really is good exercise! 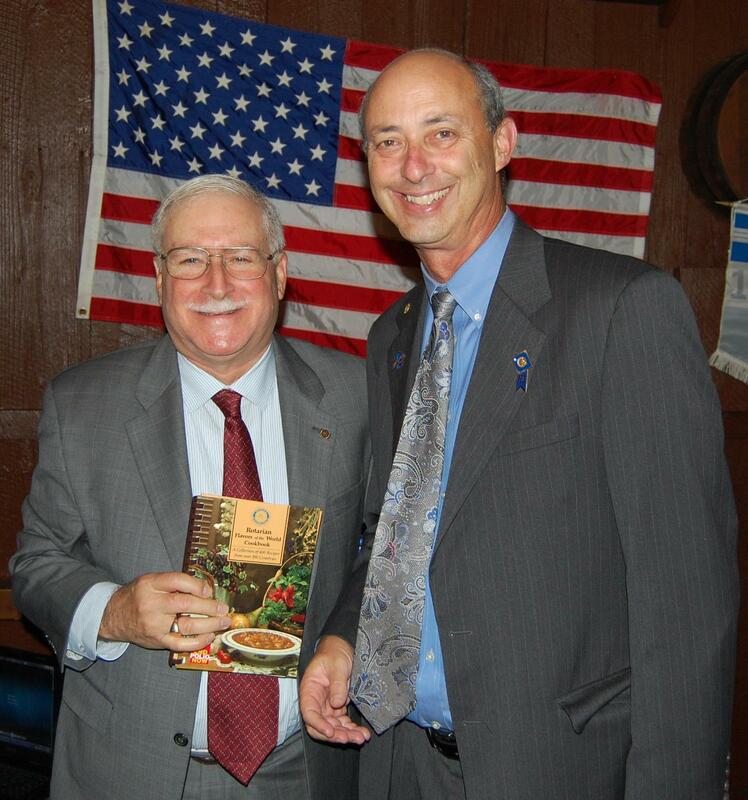 President Bob Fuhrman presents a Rotary International Cookbook to District Governor Ken Solow at his official club visit on September 3, 2015. 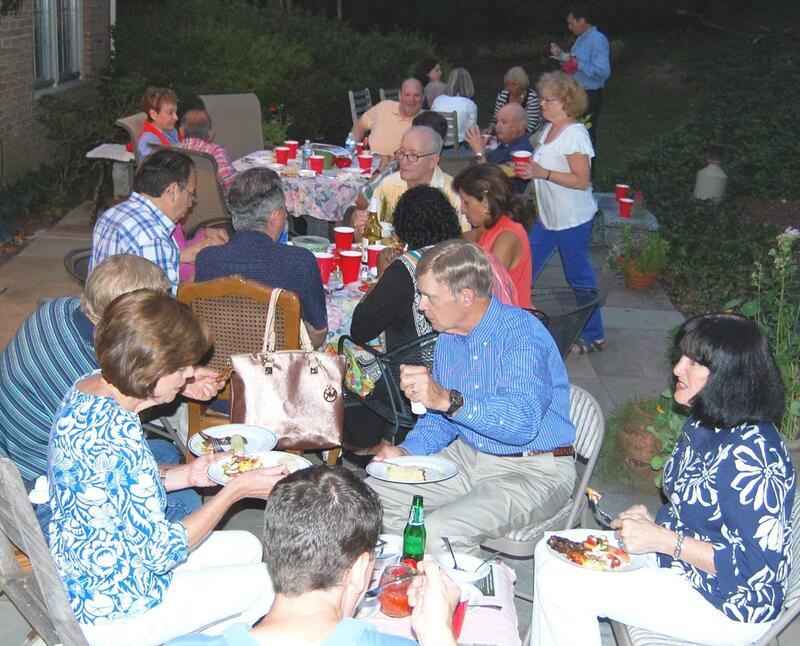 On August 27, 2015, President Bob and Nan Fuhrman graciously hosted a social and dinner at their home. 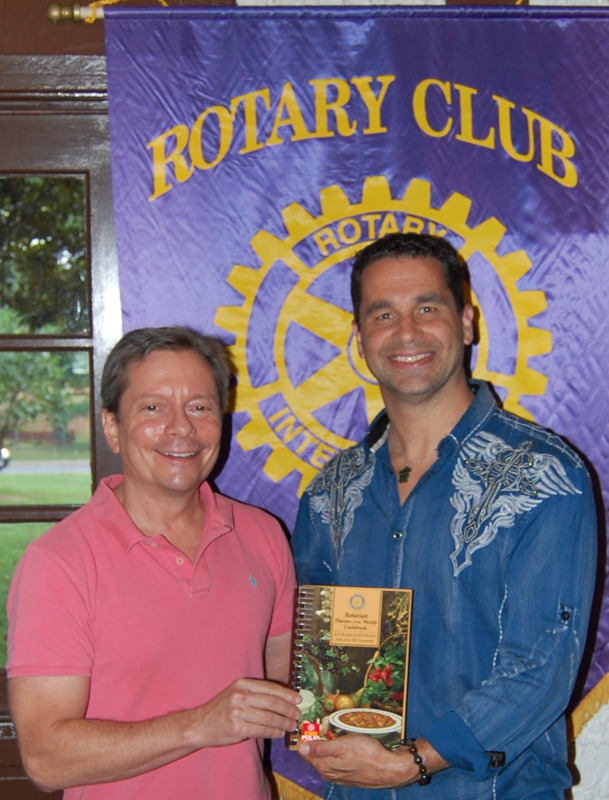 Dr. Allen Barwick spoke about Cosmology and the origins of the universe at the Rotary Club meeting on August 20, 2015. 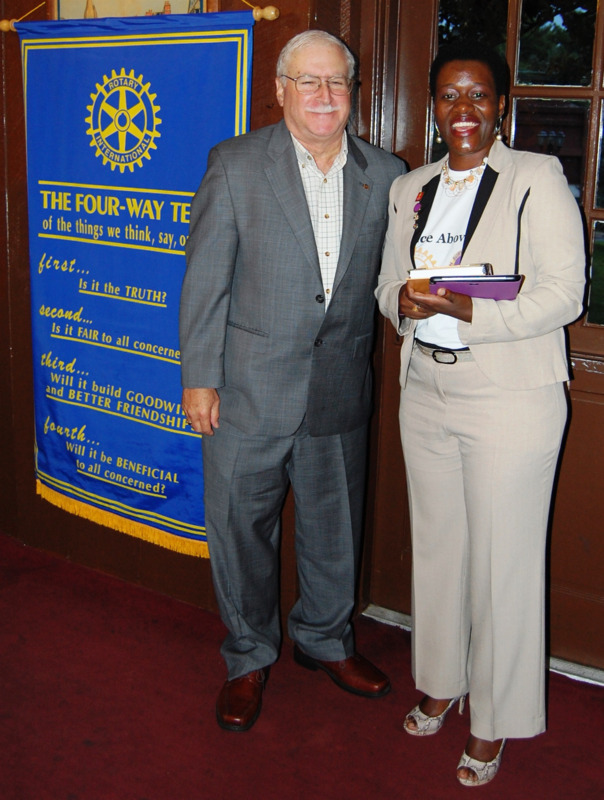 The August 6, 2015, Potomac-Bethesda Rotary Club meeting featured Tausi Suedi, Co-founder and Country Team Leader of Childbirth Survival International (CSI). CSI’s work focuses on reproductive, maternal, newborn, child, and adolescent health in hard-to-reach areas. 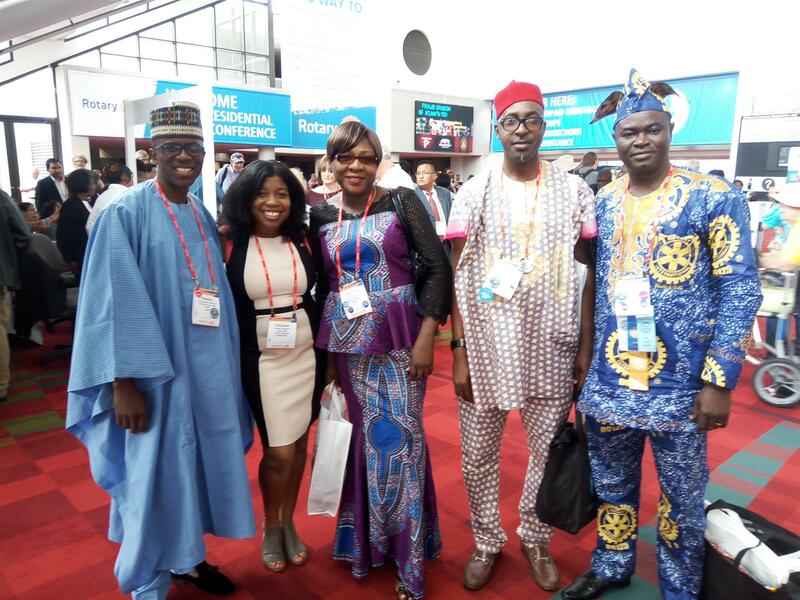 Tausi holds an MPH from George Washington University (2005), speaks four languages, and is passionate about the health and well-being of women, newborns, children under five years old, adolescents/youth, and the elderly especially in marginalized communities. 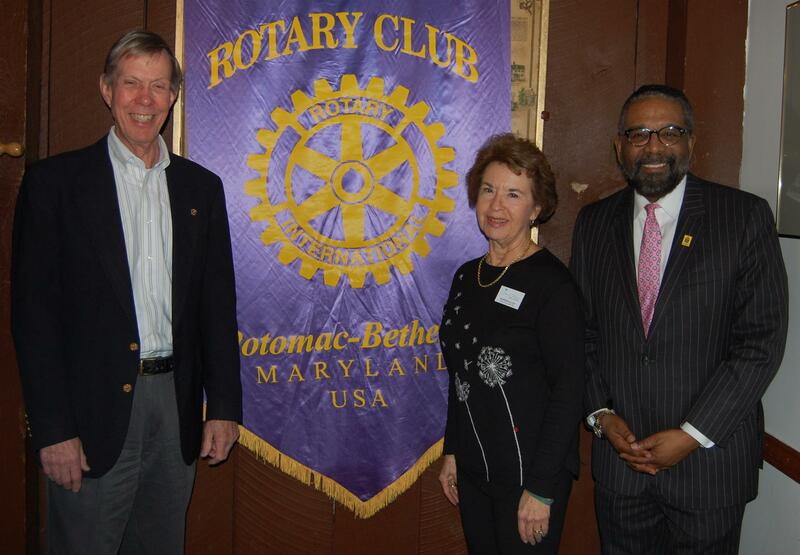 Special guests included District Governor Nominee Greg Wims, Potomac Rotary Club Past Presidents Janis Brose and Rev. Anne Benefield. 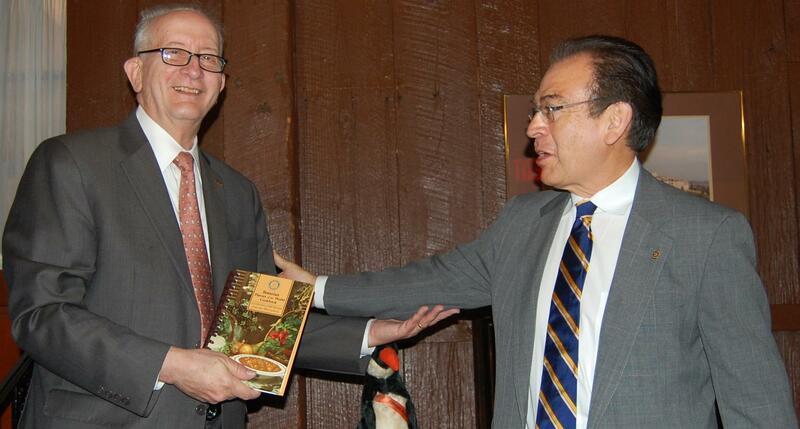 [Below] Rotary Club President Bob Fuhrman presented Tausi with a Rotary Cookbook. 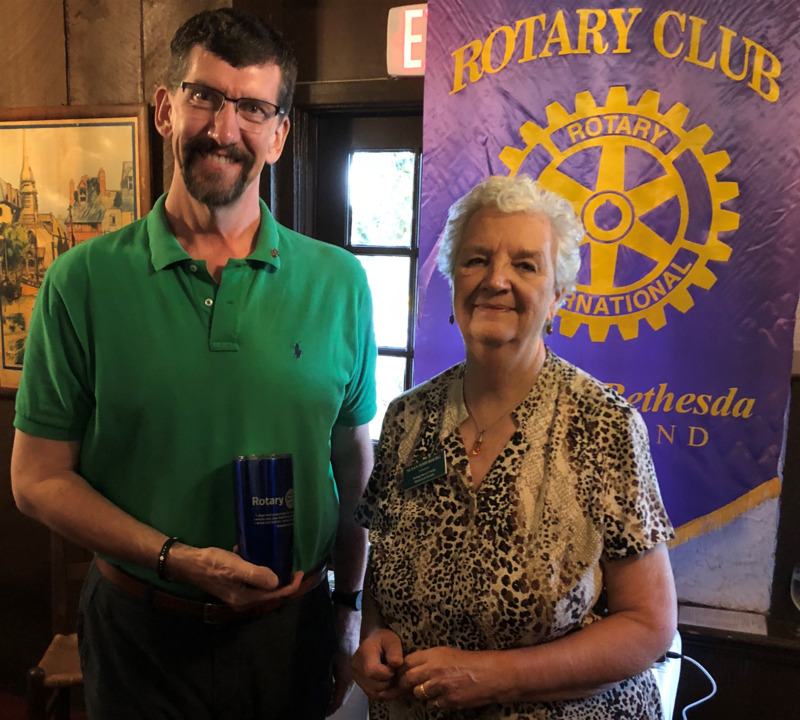 Bruce Fowler is a Rotarian from the North Bethesda Rotary Club who presented an innovative approach to providing transportation for disabled individuals to get to jobs and job interviews where public transit is not readily available. 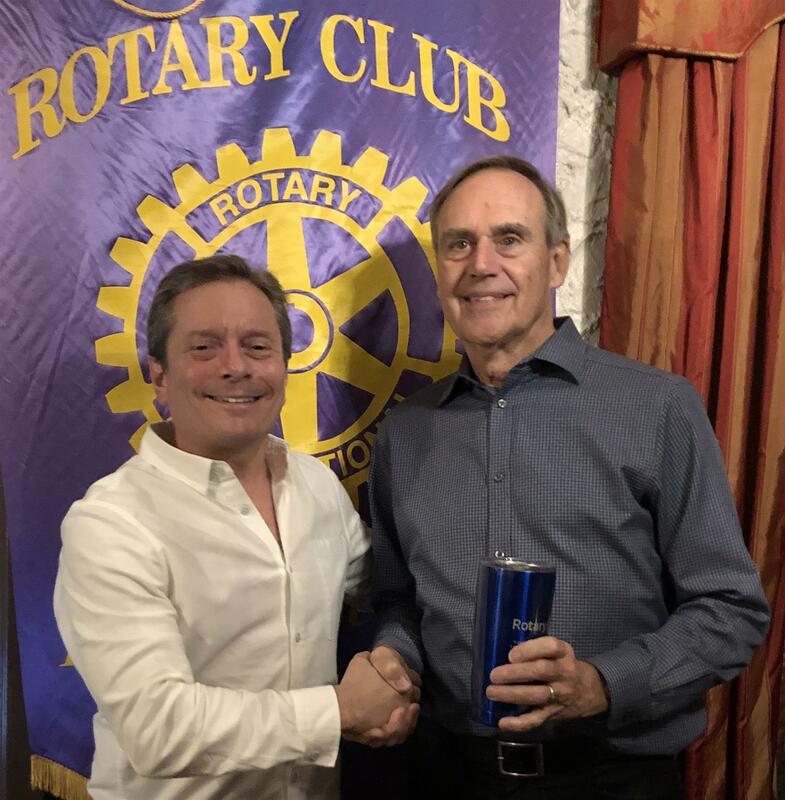 His Rotary Club has partnered with Barwood Taxi and Cornerstone Montgomery and is already reporting very successful results. 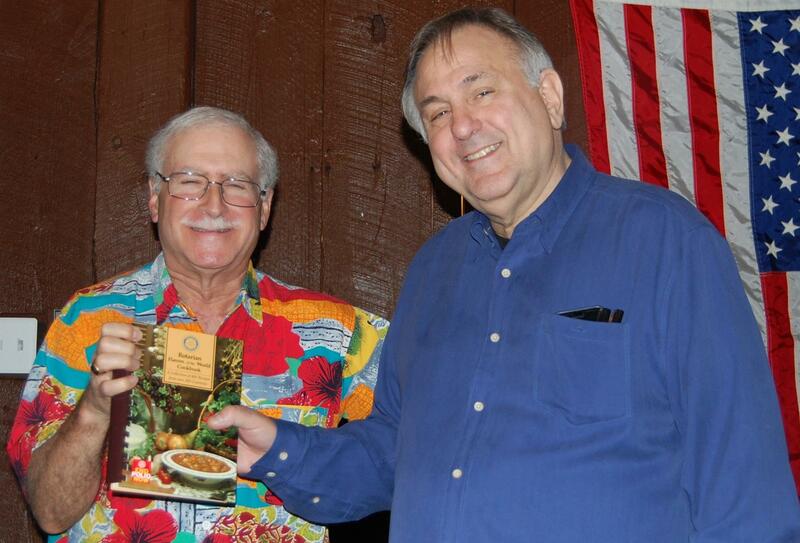 President Bob Fuhrman thanked Bruce for his presentation with a Rotary Cookbook. 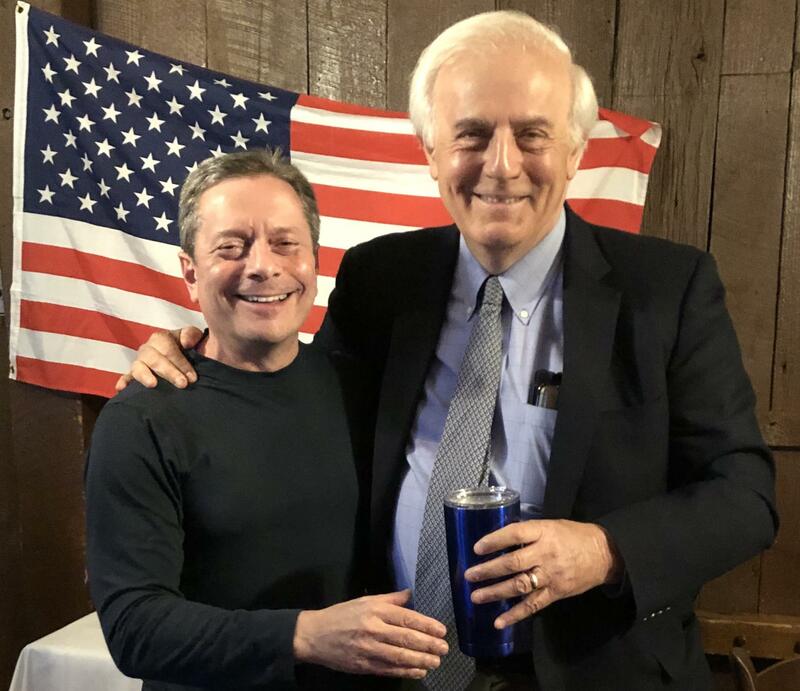 President Bob Fuhrman thanks State Senator Brian Feldman for his report on the recent legislative session in Maryland. 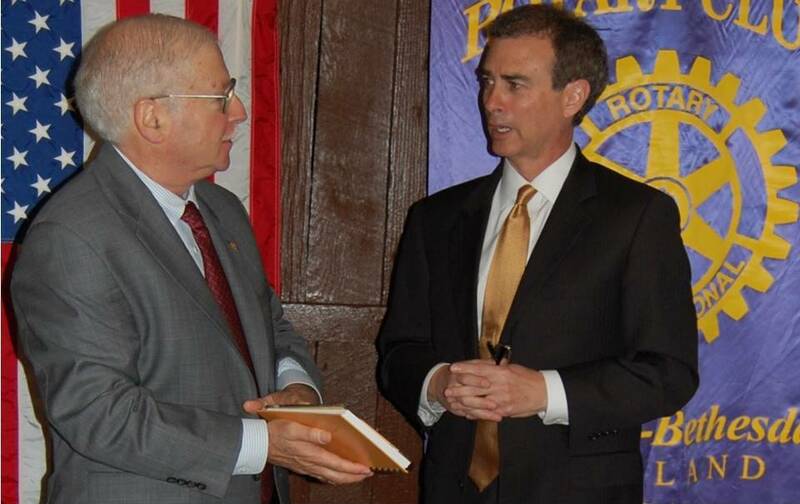 [Above] Bob Fuhrman thanks President Caesar Kavadoy for his leadership of the club during the 2014-15 Rotary year. 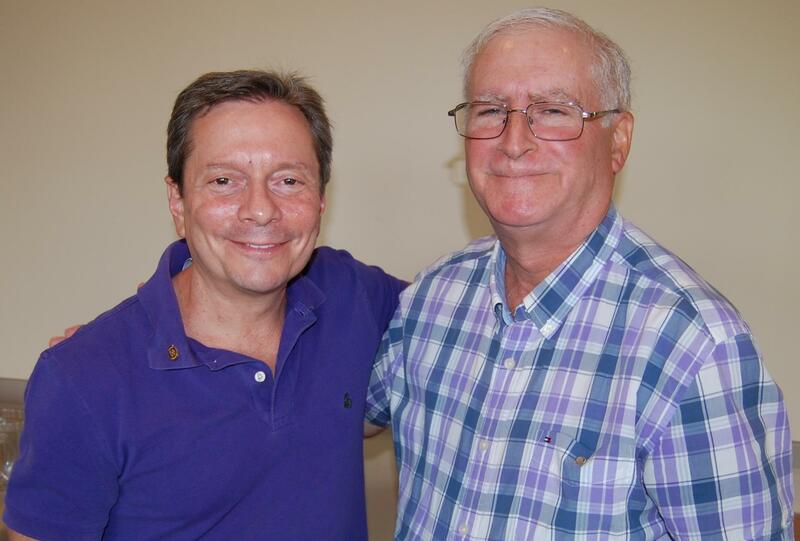 [Below] Caesar pins Bob as 2015-16 President. 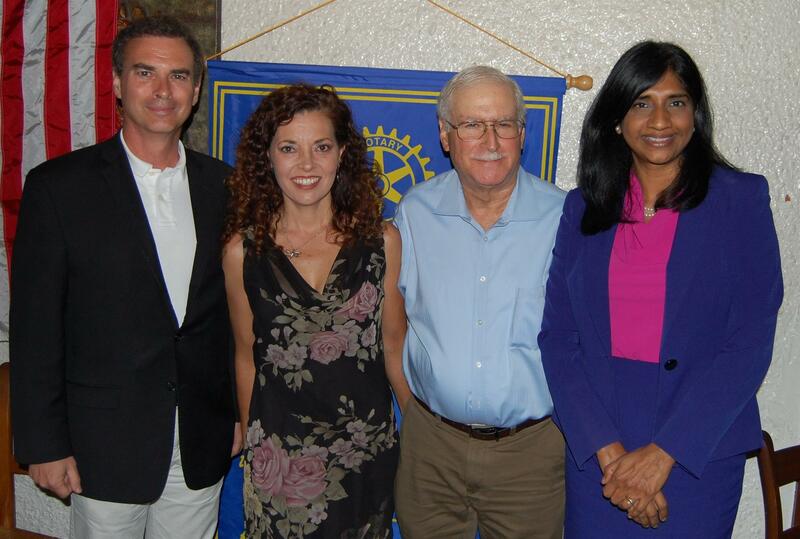 [Above] Melanie Weerakoon receives the Rotarian of the Year Award. [Below] Bob Fuhrman, Bob Nelson, Juan Carlos Peirano and Nihad Kaibni receiving service awards. 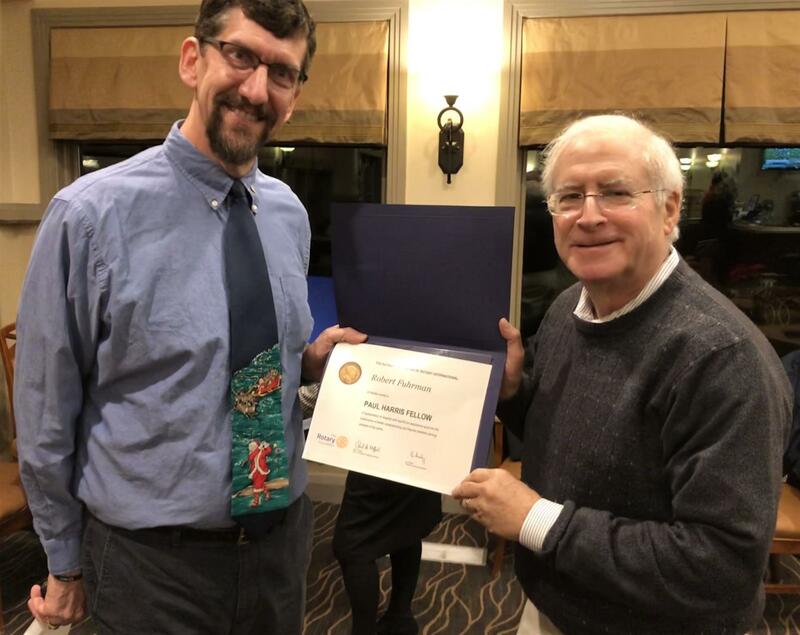 President Caesar Kavadoy congratulates Dr. Noel Howard on 10 years of membership in the Potomac-Bethesda Rotary Club and on the 46th wedding anniversary for Gladys and Noel. 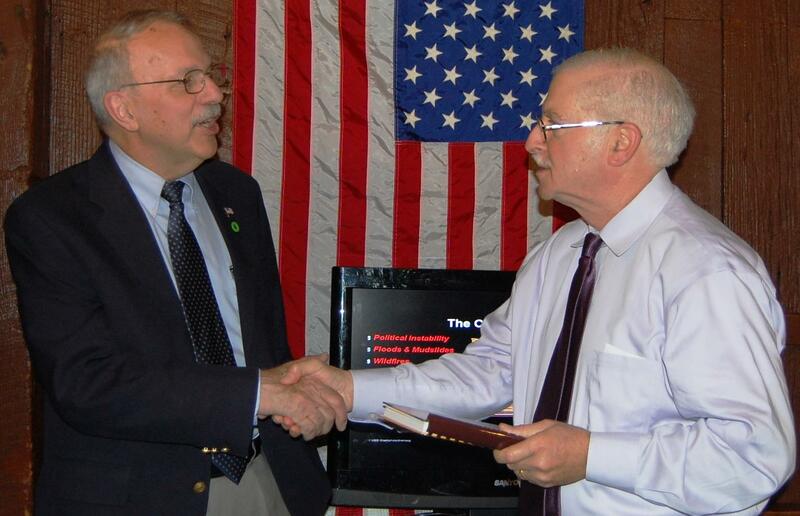 Noel gave his "re-classification" talk including his time as the highest-ranking psychiatrist in the U.S. Navy. 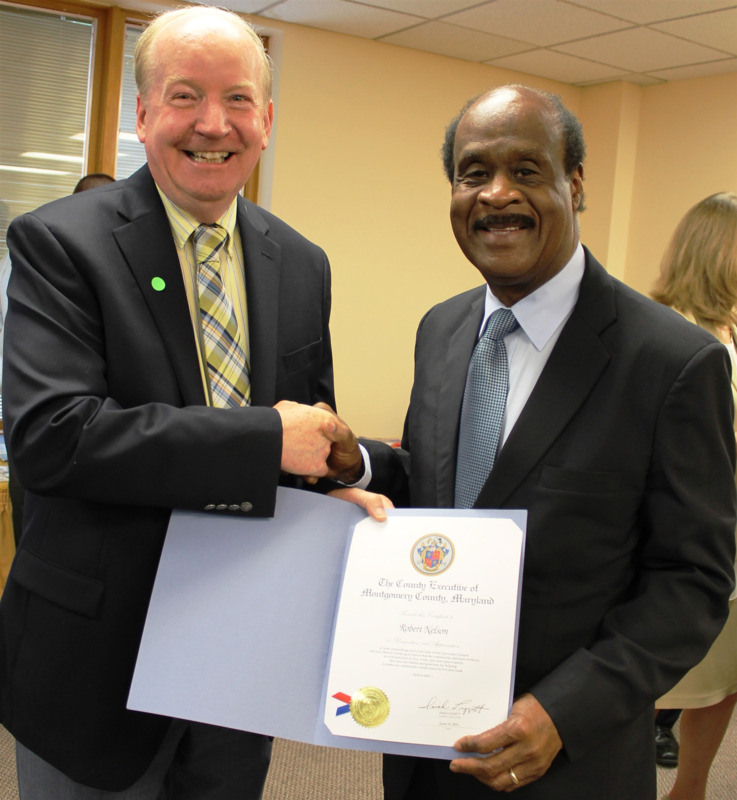 Montgomery County Executive Isiah Leggett thanks Bob Nelson for serving as Chair of the Upcounty Citizens Advisory Board for the past year. The certificate reads: “In recognition and appreciation of your outstanding service as Chair of the Upcounty Citizens Advisory Board helping to ensure that the community continues to thrive as a vibrant place to live, work, play and raise a family. You have my thanks and gratitude for helping to make our community a better place to live and work.” The Upcounty Citizens Advisory Board represents approximately 300,000 residents. 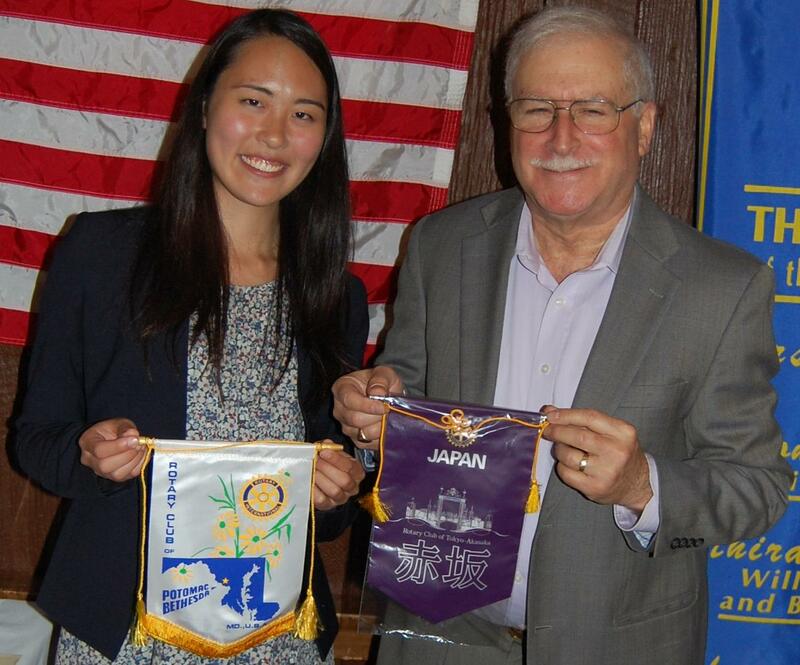 President Elect Bob Fuhrman exchanges Rotary banners with Misa Azuma, a Rotary International Scholar at Georgetown University Law Center. She focused on subjects on international human rights during her L.L.M. studies and has participated in extra-curricula activities related to human rights, specifically refugee/ immigration law such as assisting refugee applications and working with immigrants seeking status. She is planning to work in an international organization on human rights. Here is a very easy way to help us with fundraising. If you are an Amazon shopper please bookmark this link http://pbrotary.org/Page/amazon in your browser and ask your friends and family to do the same. Whenever you start your Amazon shopping from this page the club gets a percentage. See the link above for details. You can also get to it from our website banner at http://pbrotary.org. We now have a page which serves as a launching point to our club’s Foundation. 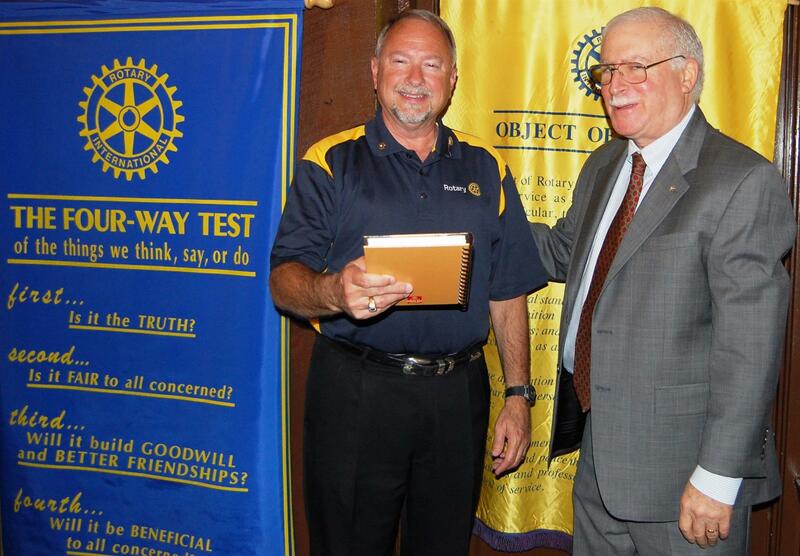 Check it out at http://pbrotary.org/Page/our-foundation. You can get to it in three ways from our home page (www.pbrotary.org) : Look for “Foundation” located on the banner or under the menu choices “About Us” or “Services/Projects”. Besides evolving content and links to internal and external resources, on that page we can now accept online donations for everything we do.